BoulderGate! BoulderDash! 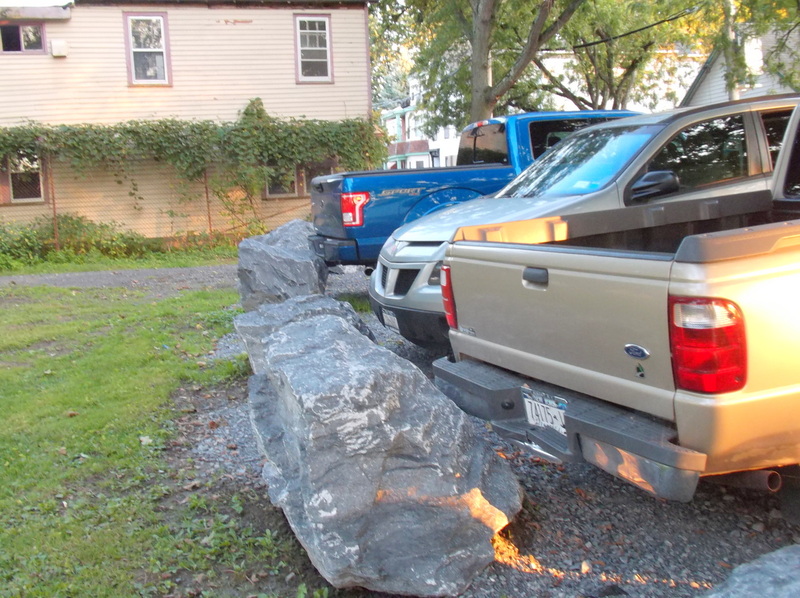 Frankly, I’ve been virtually seething over the process used by the officers and board of the Stockade Association [SA] to achieve the replacement of old metal guardrails with boulders where Riverside Park meets the dead-end parking/turn-around areas of three Stockade streets. 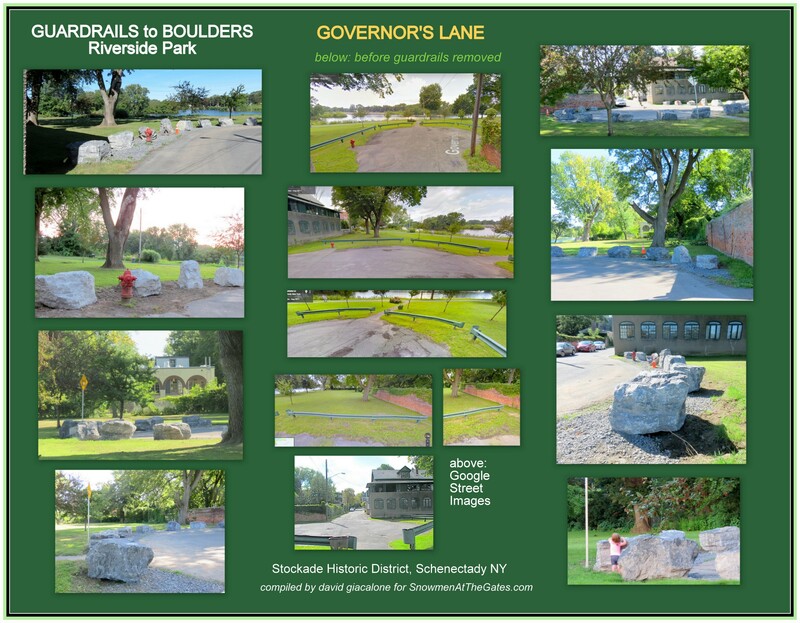 The deliberate decision* of SA leaders not to inform members and neighbors of the boulders-for-guardrails project, specifically because they expected strong opposition, shows a great disrespect for the Stockade community, and disregard for their obligations. SA President Carol DeLaMater sent me an email yesterday morning (Sept. 22), saying “David, very disappointed in your assumption about Board behavior regarding support for a proposal to improve the area at the end of North St. It had none of the deliberate motivations you describe.” Please Note: My information on the reason the Board failed to inform the community comes from a person who attends SA Board Meetings, has no apparent axe to grind, and who I have always found to be most trustworthy and reluctant by nature to foment controversy. The account also rings true, because Board fear of opposition to the boulders is about the only reason that seems to explain the failure to request or allow “outside” input over perhaps a period of two years. 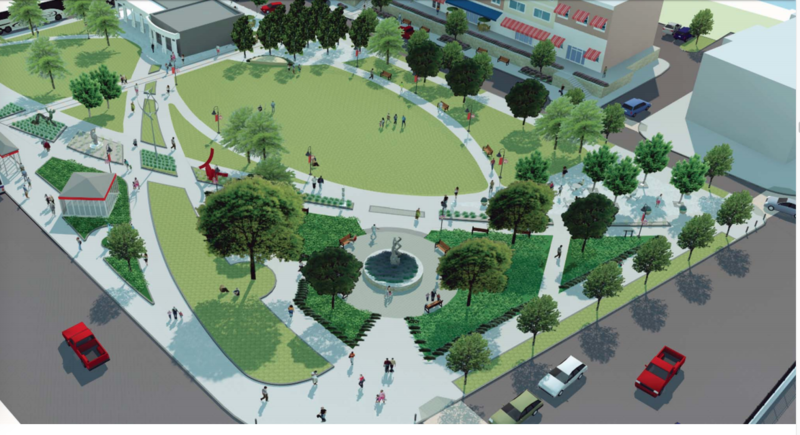 I do not believe that responsible Board members and officers considered this major change in the appearance of the Park and streetscape to be too trivial to bring to the membership. 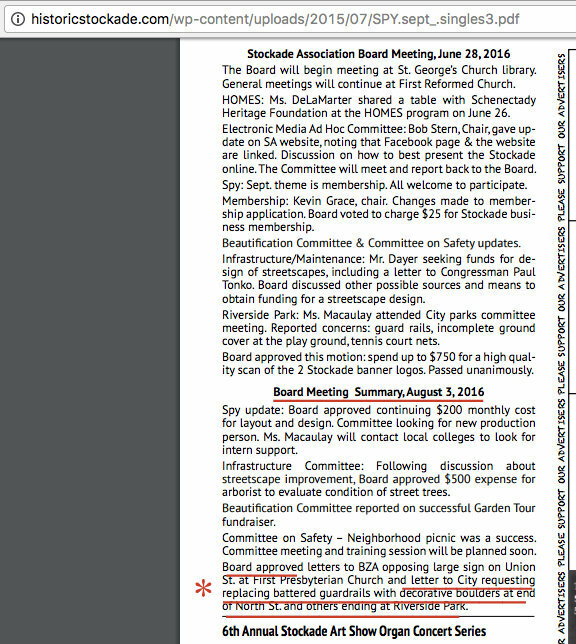 Perhaps more importantly, the failure to inform members and the community about the requested boulder project demonstrates why any substantial proposal needs the input of “outsiders” (people other than the proponents of a plan and their close friends) to assure that significant concerns are raised, unintended consequences pointed out, alternatives offered (and expensed), and the thoughtful wishes of the neighborhood heard. Nonetheless, I am attempting to write in a civil tone, and keep my sense of humor (see the Boulder Bunch Design Committee, to the right of this paragraph). 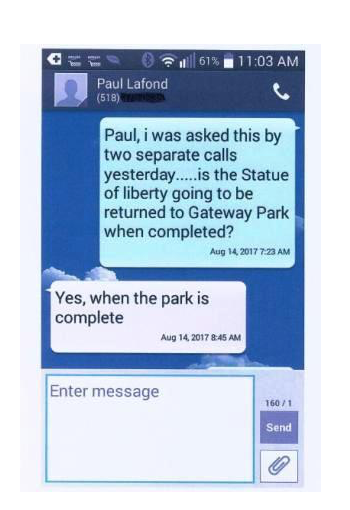 There may be reasonable responses to the concerns discussed below, but we were never allowed to raise the issues or test the responses before 110 tons of rock were deposited in Riverside Park. Why am I so upset at the process? To better focus on facts, research, and common sense concerns relating to the use of the boulders, I expand on my reasons at the foot of this posting*. I also explain why even non-members of the Stockade Association have the right to be concerned and to point out failures in the process and outcome. 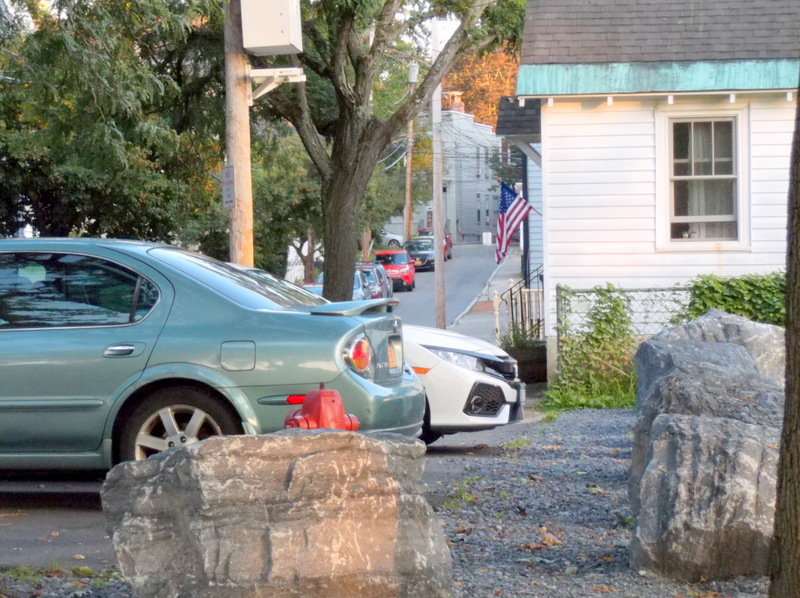 . . above: [L] a car parked at North St. boulders; [R] a toddler about to climb a boulder at the end of Governor’s Lane . .
NORTH STREET Focus: To simplify the discussion, this posting will focus on the situation at the end of North Street. 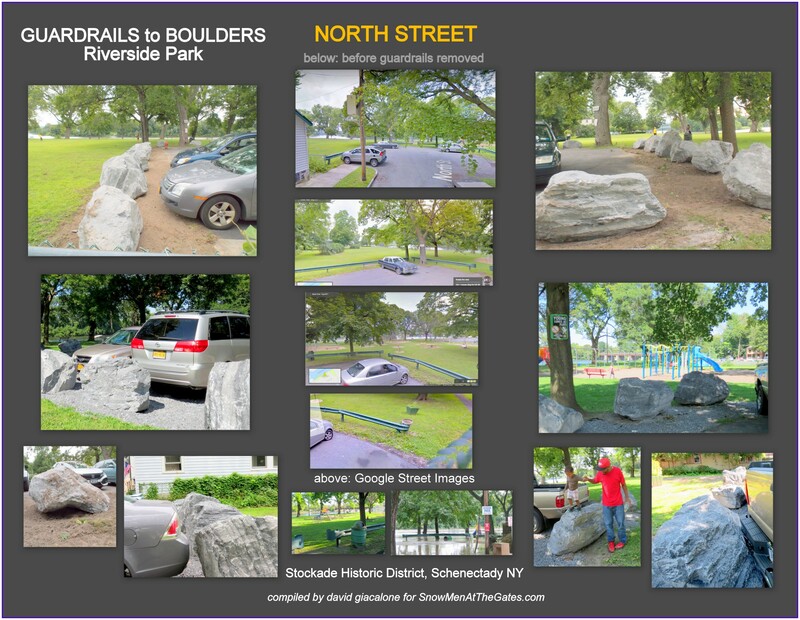 According to SA President Carol DeLaMater, it was North Street residents who first suggested replacing the old green, bumper-high metal guardrails with large rocks or boulders, where the street dead-ends at Riverside Park, in a small, circular, paved area used for parking and turn-arounds. 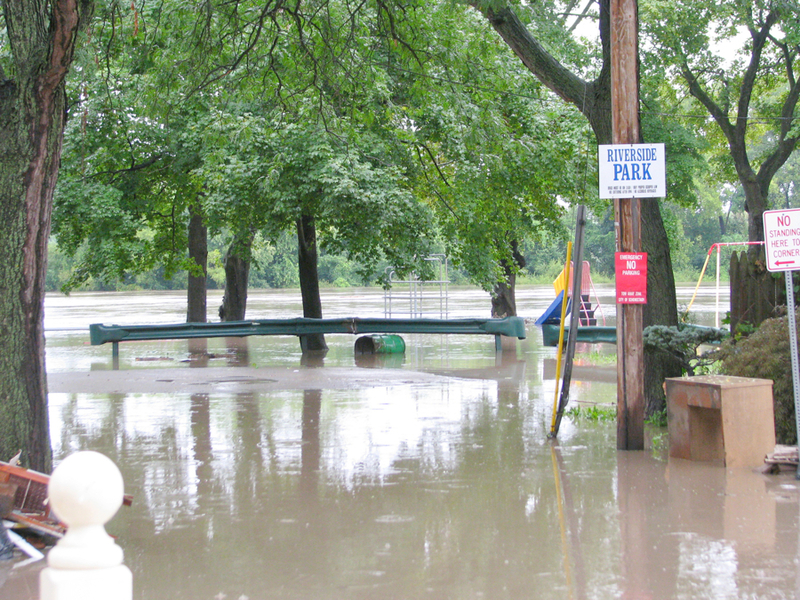 The street is one block long starting at Front Street, north to the Mohawk River. There is only one travel lane, which must be used by two-way traffic, making turn-arounds important and requiring the accumulation of snow at the dead-end or the Park. 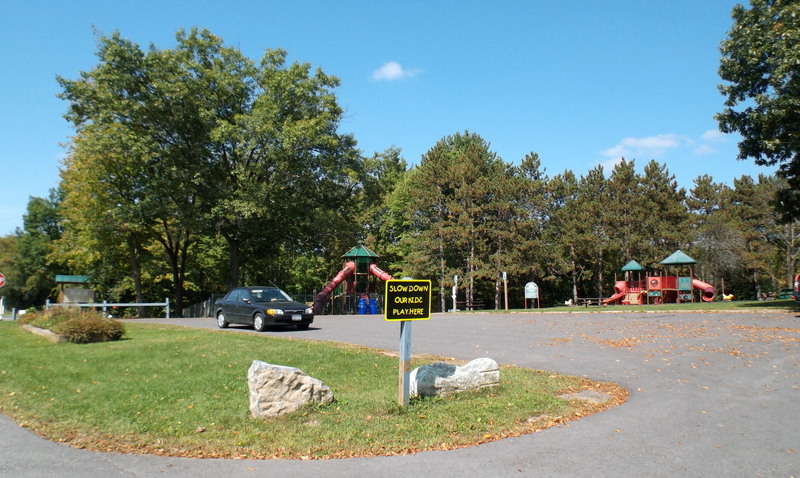 The Park’s playlot, aimed at young children, and almost totally renovated by the City in November 2016 for safety reasons, is located about 25′ from the parking area. 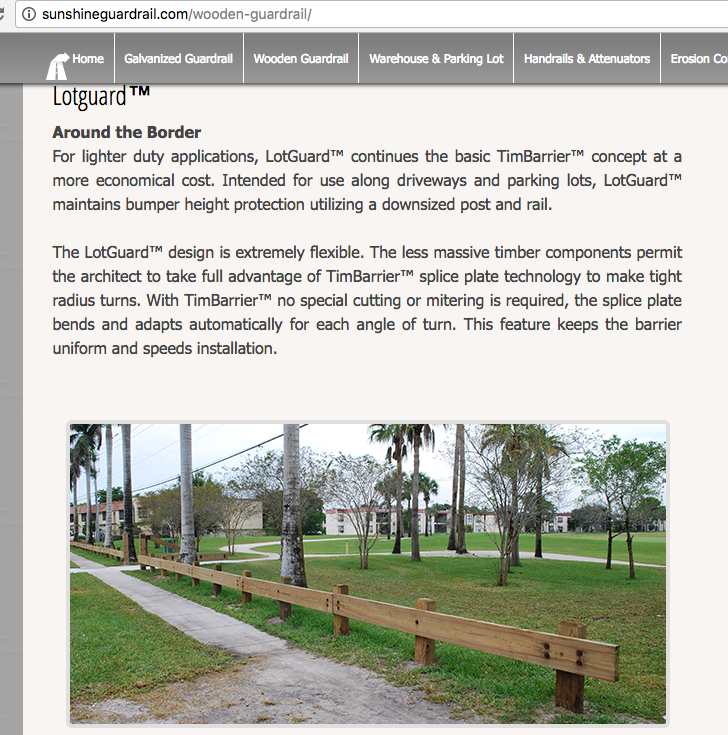 When replacing a utilitarian element like guardrails, we should probably start by asking what purposes the guardrails serve, whether they have been serving those purposes well, and whether some performance factor can be improved at a reasonable cost. We surely need to ensure the replacement situation is just as safe and effective, and hopefully adds no new maintenance worries or costs. 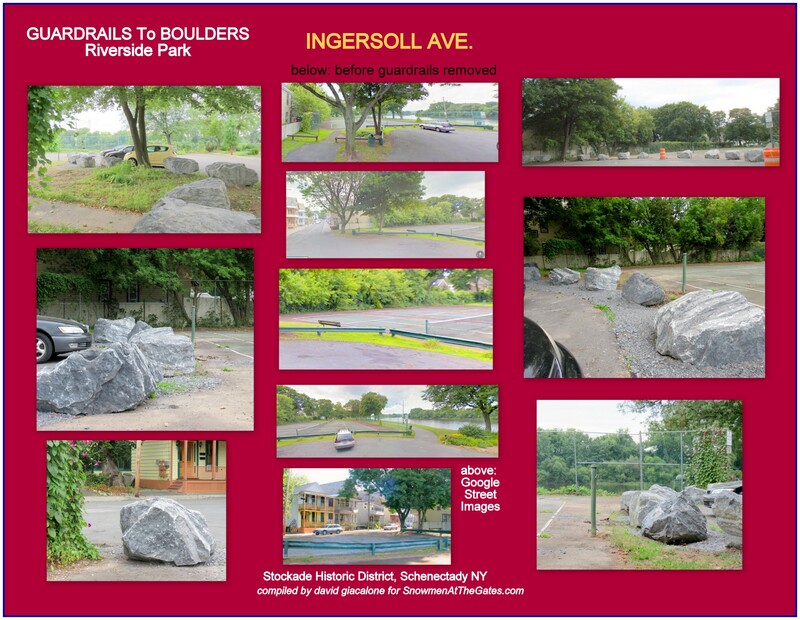 Note, however, that in support of his boulder proposal for North Street, Dennis Meyer told the Times Union that “boulders would also satisfy the city’s 2020 comprehensive action plan to “remove guardrails from parking areas and install a more appropriate barrier”. 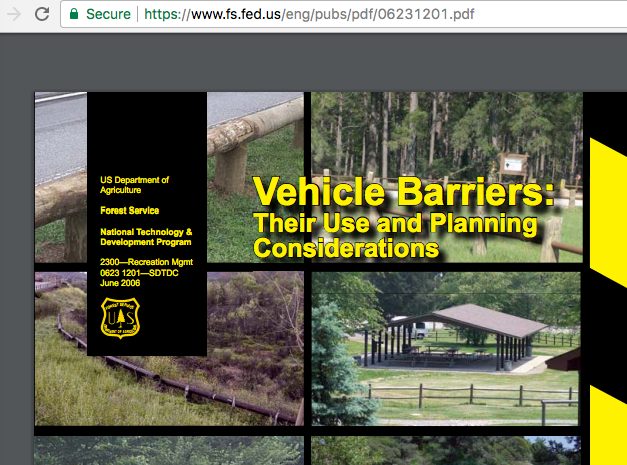 That, of course, begs the question of what constitutes an appropriate barrier at the particular location. boulders are unforgiving. they will beat your doors, fenders, bumpers and side-panels every time you engage them. also their non-uniform shape means you cannot always tell how far away the vehicle is from the boulder merely by seeing its top. 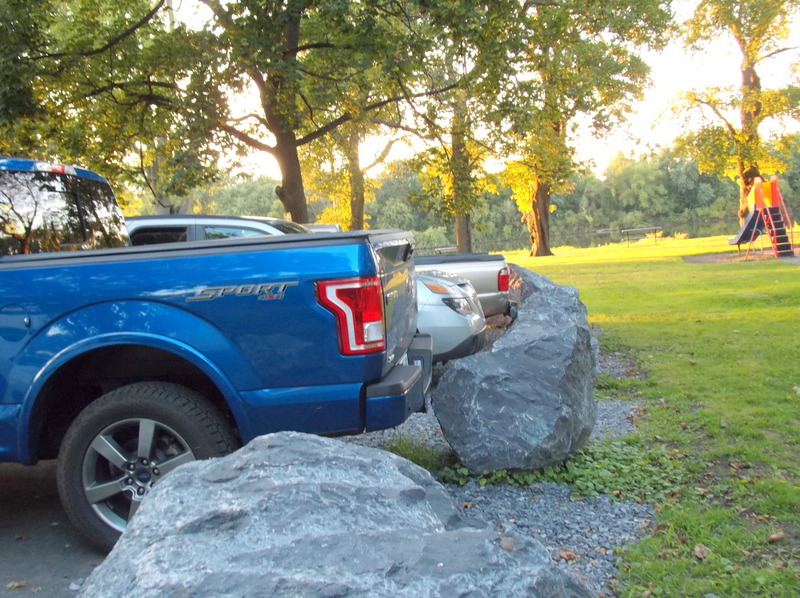 the boulders are much higher than passenger car bumpers. drivers backing in have to worry about being able to open their rear doors. parallel parkers very much need to have full control of their doors when exiting and returning to the vehicle. 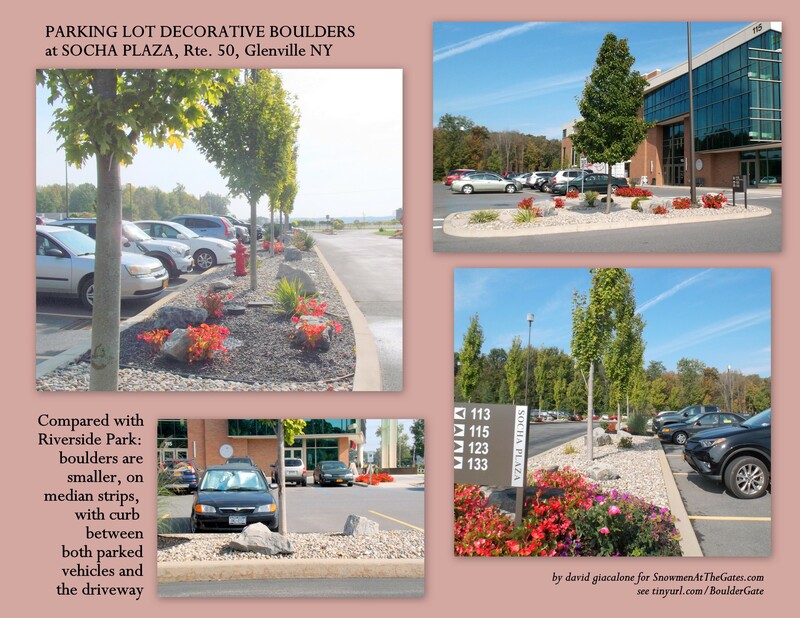 Because drivers often do not park as closely to the boulders, there is considerably less space to maneuver when pulling out of a parking space or turning around at the dead-end. We know how the guardrails serve snow removal needs, but we have to wonder how major snowfalls will be handled, and what major accumulations will mean. Guardrails permit some snow to be pushed under them and are low enough for plows to dump snow over them. Boulders seem to have neither characteristic. One SA officer wrote that snow can be pushed between the boulders. Maybe by hand, but the suggested process seems to be a great way to break a plow blade or push boulders onto the park lawn. 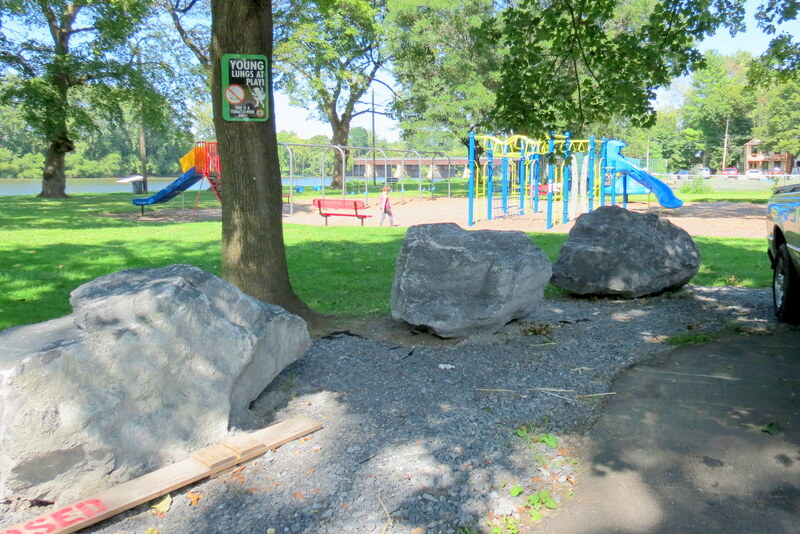 It seems highly likely that small children will be attracted by the boulders, which do not offer the foot and hand holds of artificial climbing boulders certified for playgrounds. 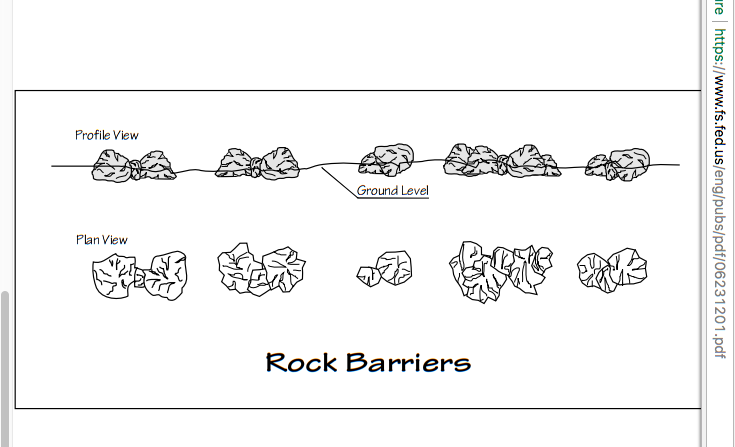 Instead, these unpainted, rough limestone boulders have many sharp edges, and splinters chipping off, and those falling will not have the required surfacing found on playgrounds (which mandate 6′ of such buffered ground around the entire climbing element). An “attractive nuisance” is any condition on someone’s property that would attract children, who are fascinated by it but don’t understand its dangers. If a child is injured or killed by an attractive nuisance, the property owner could be held liable for damages in a personal injury case. 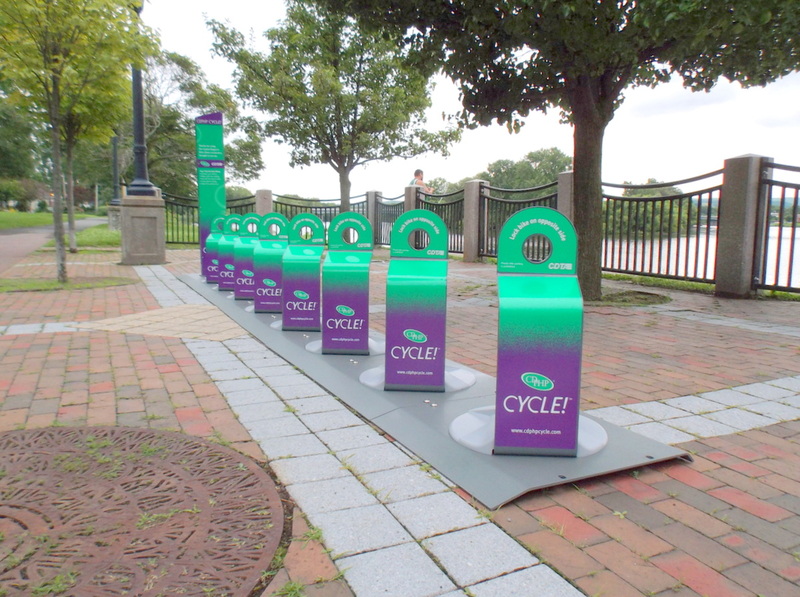  Parking barriers shall be treated as potential visual features and shall have consistency with neighborhood and regional character and with other landscape elements such as lighting, adjacent building details, and street furniture.  Cluster and stagger boulders to mimic natural conditions. 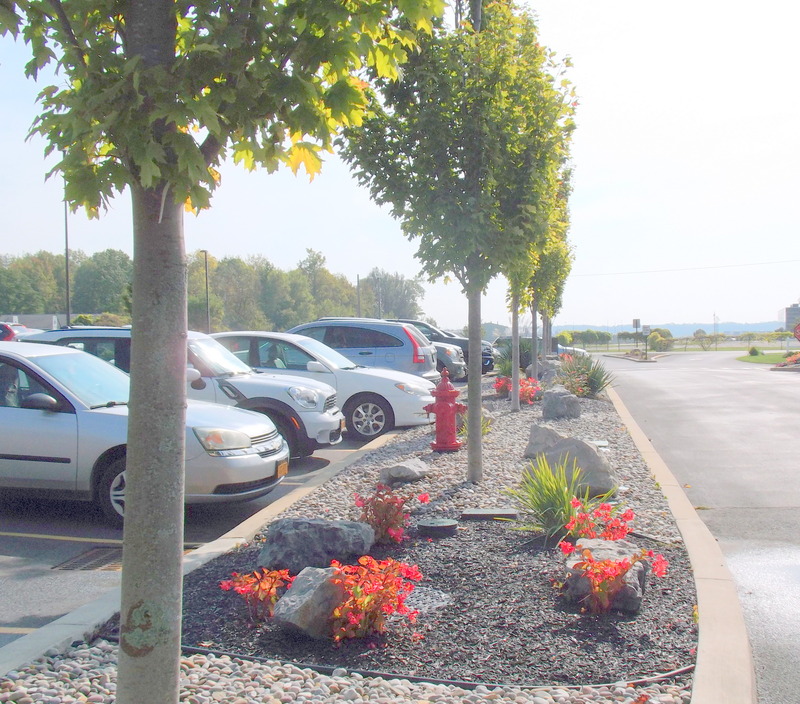  Shrubs and vegetation can be used as parking barriers. INSPECTION AND MAINTENANCE: Ensure parking barriers are sized and spaced correctly so they remain intact. Yearly maintenance may be necessary to repair damage from snow removal activities. 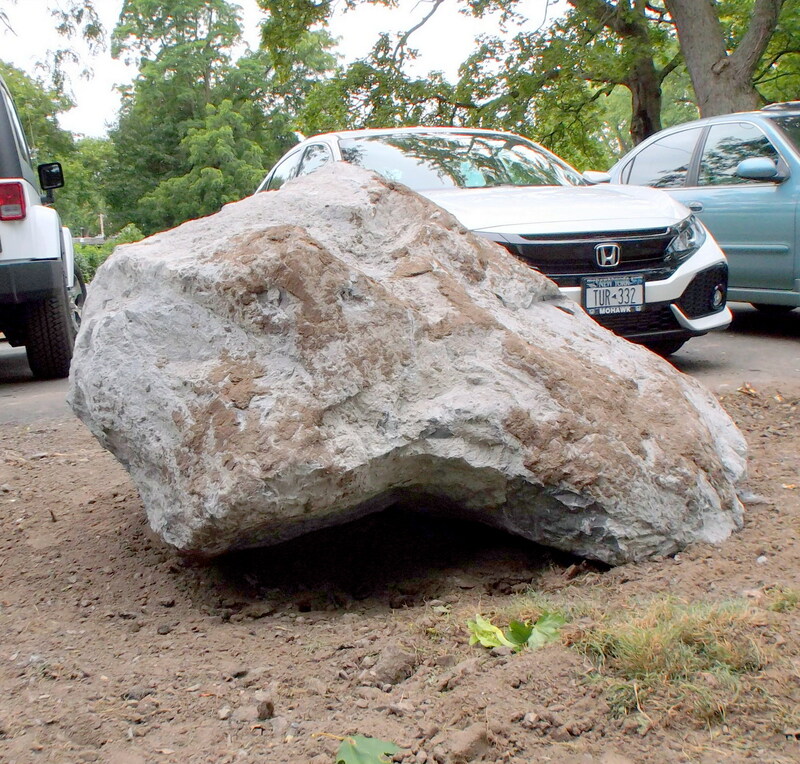 According to Paul Nelson’s Times Union article, “The city engineer said he is not overly worried about the rocks being spray-painted because they can be power- or sand-blasted without being damaged.” (“Boulders make a big difference at Riverside park in Stockade neighborhood,” August 16, 2017) . That seems rather optimistic. The rocks are already flaking away; they are soft, limestone. 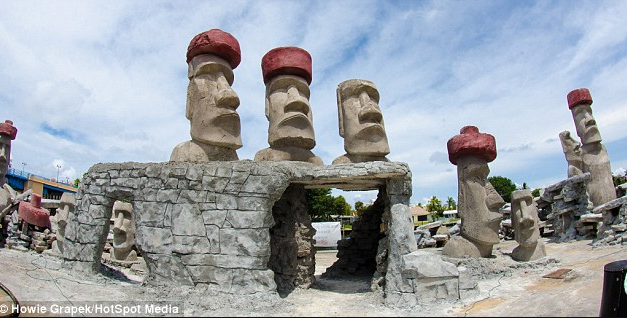 Also, they are oddly-shaped, not smooth granite-type rocks, or already painted, and are not securely anchored. Because there are so many crevices, the idea of power cleaning, especially near parked vehicles and playing children, seems unrealistic. We know the guardrails stay put in a flood. Can we say the same for the poorly anchored boulders? Where might they end up if there is a flood? What about with ice-jam-related flooding? A FEMA training material states that flash flooding can move very large boulders, and then states (at 2-9). Flooding caused by ice jams is similar to flash flooding – the formation of a jam results in a rapid rise of water both at the point of the jam and upstream. Failure of the jam results in sudden flooding downstream. 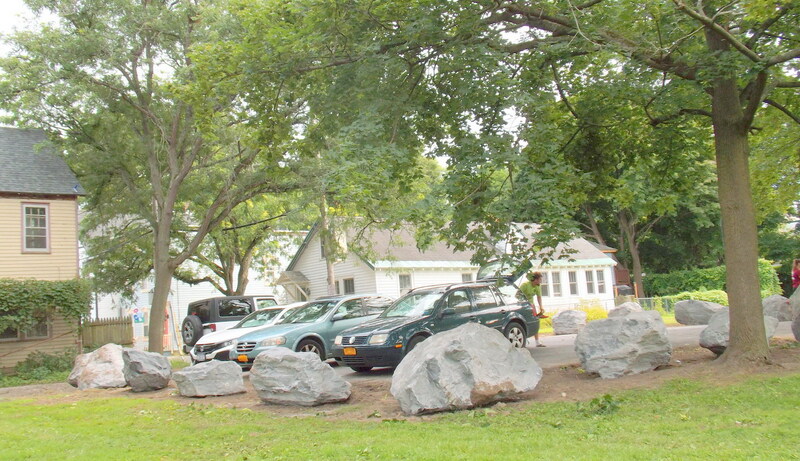 Many in the Stockade community appear to disagree with the notion that the boulders are “beautiful” and look “natural”. Aesthetics are a matter of subjective evaluation, but the opinion of a significant, and perhaps majority, element of a neighborhood should not be ignored, and should at least be solicited. That is especially true when several years ago a similar boulder proposal for the Park inspired strong opposition when presented to an SA membership meeting. 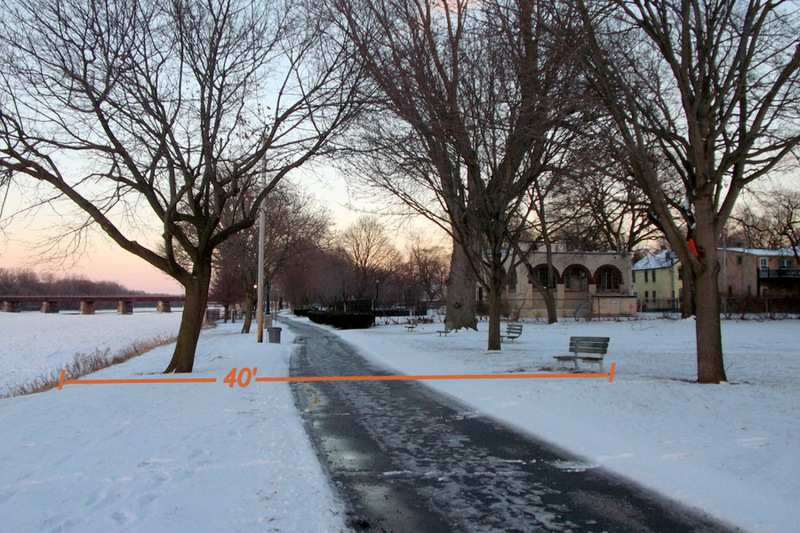 When we are dealing with Riverside Park, which has been called “perhaps the finest thing of its kind” by the editor of Architect Forum, “nice”, “I’ll learn to live with it,” or “better than those old, dented guardrails”, is simply not good enough. . . beautiful and natural? How to use: Mimic nature by planting rocks in clusters of one to five and varying space between the rocks and the clusters. 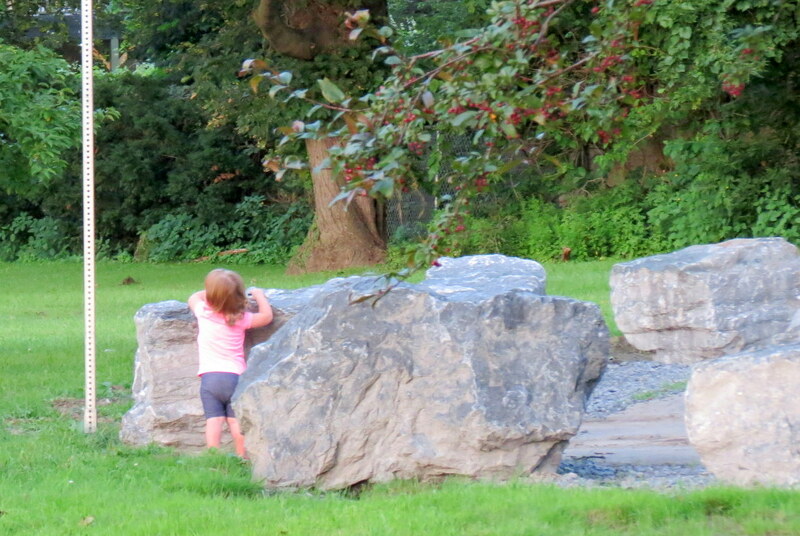 Where to use: Use where large rocks occur naturally. If large rocks are not common, do not use them; they will appear out of place. 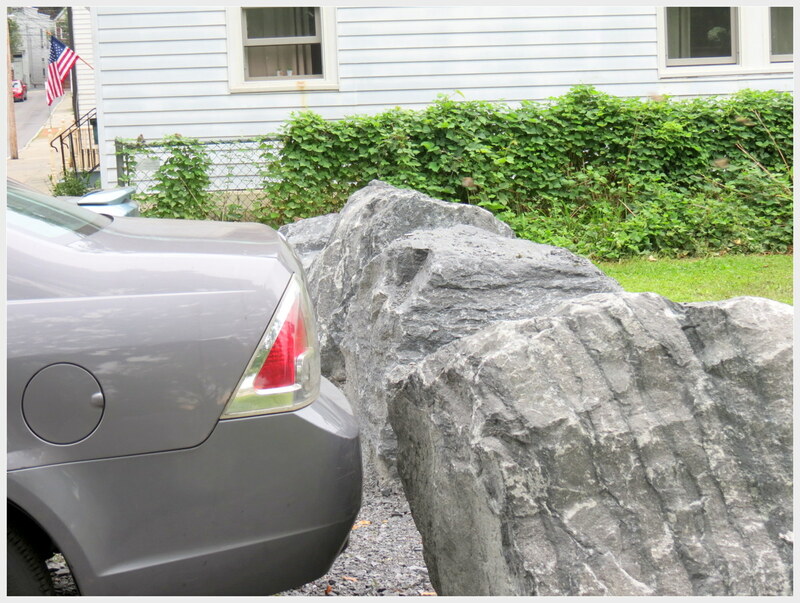 Furthermore, I have not been able to find even one example of analogous boulders of similar size being used as barriers along parking spaces — that is, none are in places where drivers must pull or back up to a boulder to park. 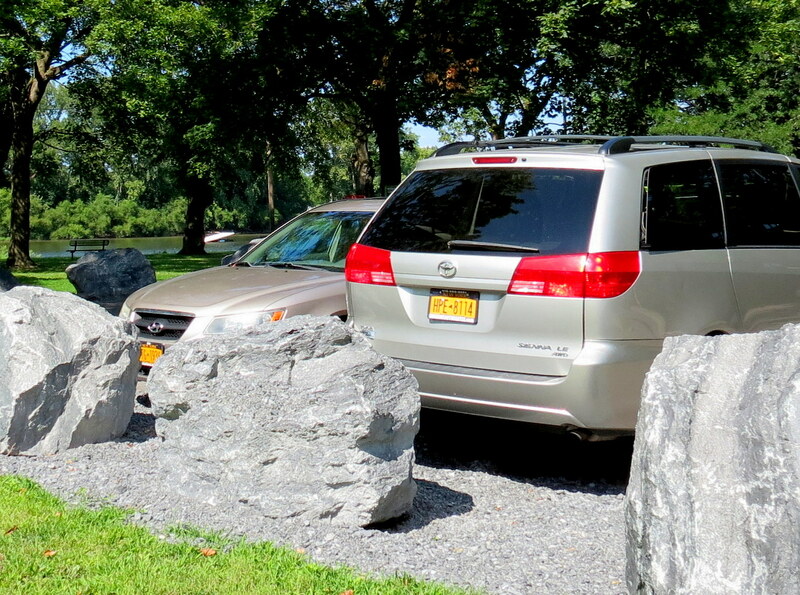 The City Engineer told the Times Union last month that the rocks in the Stockade are similar to the ones in found in Collins Park in Scotia and Indian Meadows Park in Glenville. My investigation suggests the contrary. 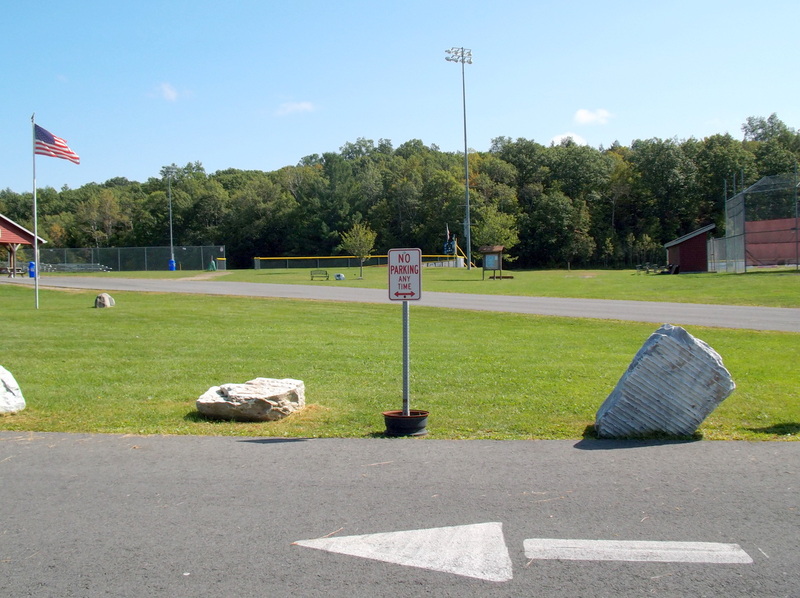 I could find only one “boulder” in all of Collins and Freedom Park, and it is nowhere near a road or parking space. 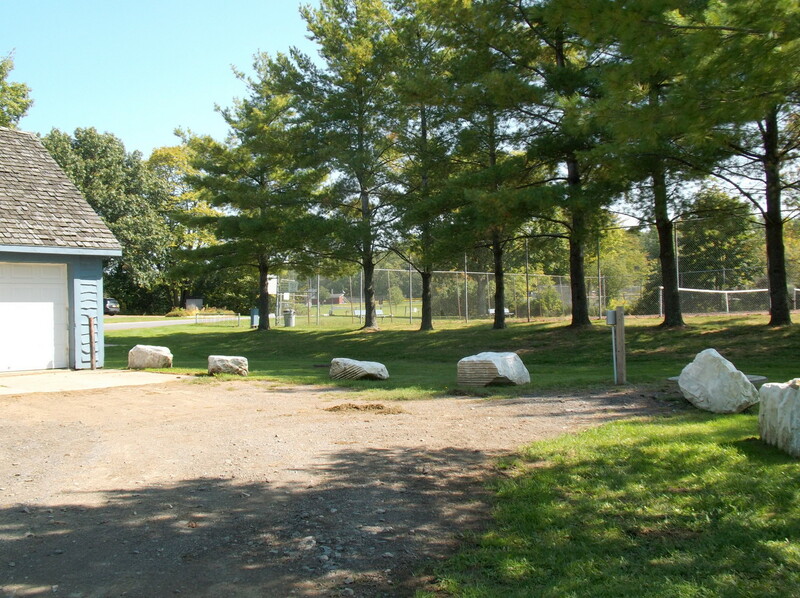 There are many boulders at Indian Meadows Park in Glenville, but not one is next to a parking space and, especially, none are along the parking spots at the playground. 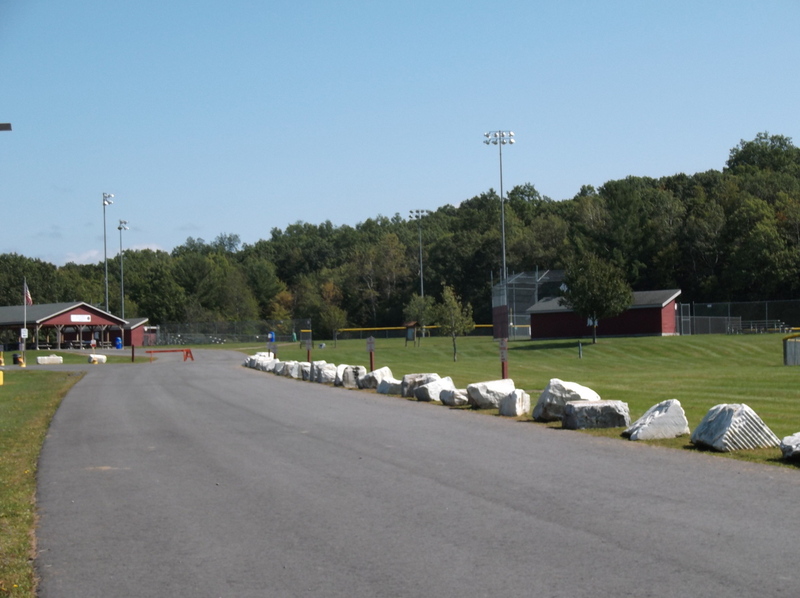 Also, the Glenville boulders, which are really homely when in large groups, are there to keep vehicles off of the lawns, and have plenty of open space available nearby for depositing plowed snow. 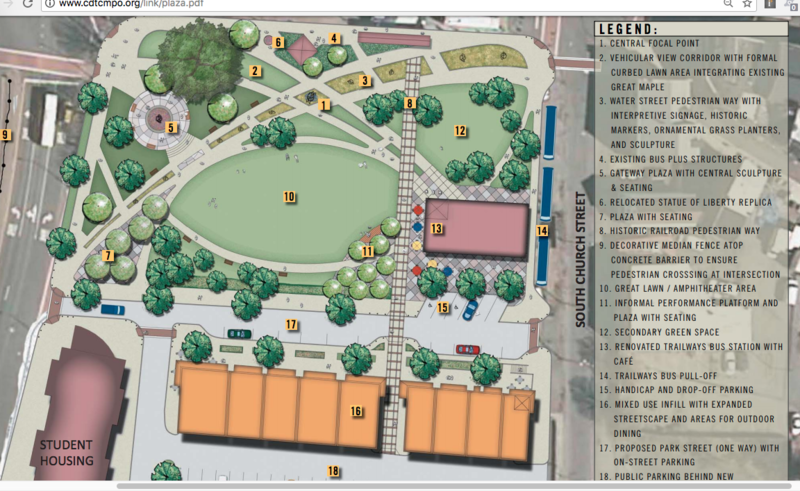 I hope the main points made above will help ensure a far more open process within the Stockade Association, and may help the City decide to find a better solution for the Park and a more appropriate home for the costly boulders. . . click on the above collage for a larger version . . Admirers of the Nicholaus Block building and advocates for preservation of our City’s fine old buildings were instantly filled with dread Friday afternoon, April 7,2017, when the Schenectady Police Department announced the immediate closing of the blocks alongside the Building. We were told that an engineering firm monitoring the structure had concluded that the building posed an immediate threat to public safety and could collapse. Sadly, we were right to fear the worst: by late that evening demolition had began on the grand structure, a beloved relic of the City’s German immigrant culture. There will be much finger-pointing and wringing of hands in Schenectady over this tragic episode in our history of preservation failures. But, I will try to keep this posting a eulogy for a structure that was a wonderful piece of Schenectady history for almost two centuries. 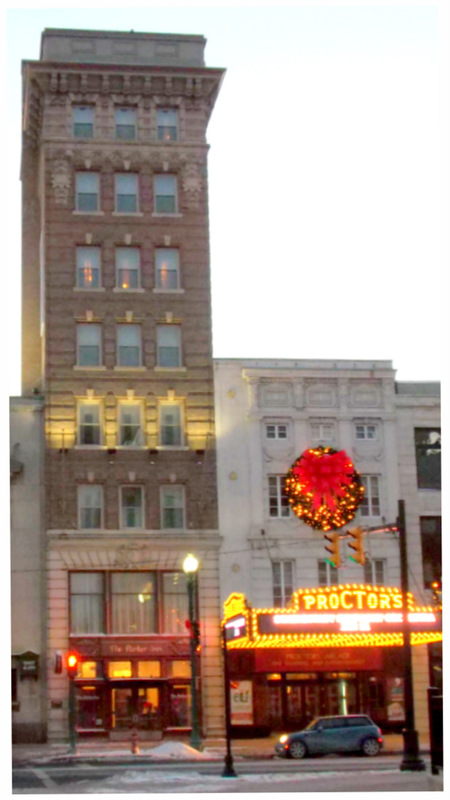 You can read the explanations given by our civic leaders in “Schenectady’s Nicholaus Building reduced to a memory: Overnight demolition brings down two centuries of history” (Albany Times Union, by Robert Downen, April 8, 2017); and “Schenectady’s Nicholaus Building: What happened? 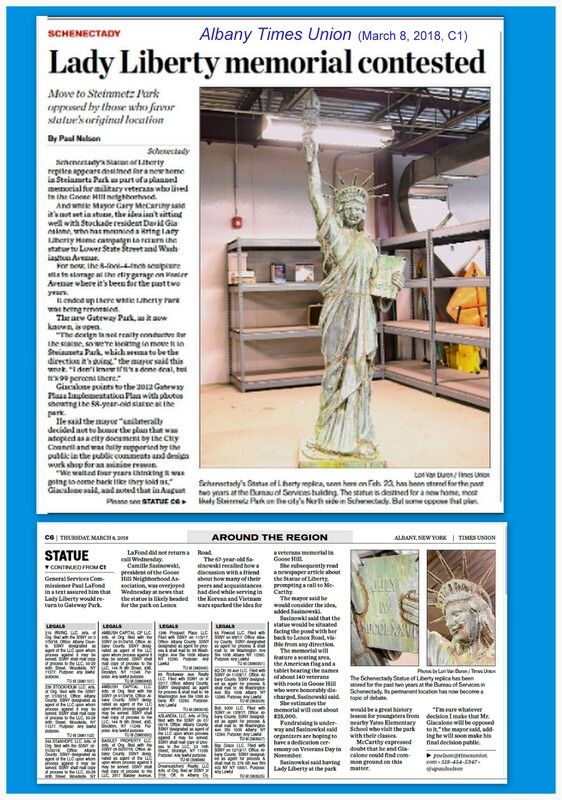 The iconic building was erected in 1820″ (Schenectady Daily Gazette, by Daniel Fitzsimmons, April 7, 2017). Suffice to say that Metroplex Chairman Ray Gillen and both the Mayor and Corporation Counsel of Schenectady say that they did everything they could do to save the building, including having engineers draw up a plan to stabilize it and offering to buy it, with no response from the owners, Viroj and Malinee Chompupong. As of the posting of this piece, the Chompupongs have not commented on the course of events since he building shifted and was evacuated in April 2016. 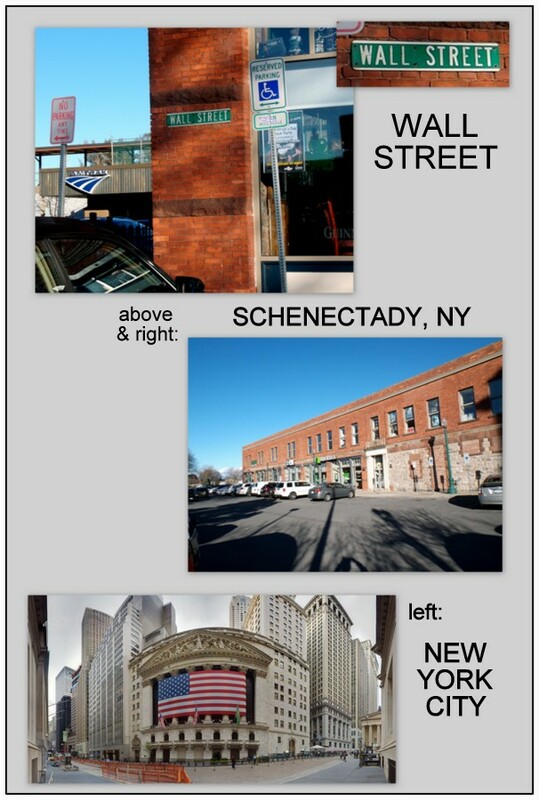 Followup (April 11, 2019): Exactly two years to the day that the Nicholaus Block Building was demolished, the front page of the Sunday Gazette was dominated by an article headlined, “Apartments at Schenectady’s most prominent intersection welcome first tenant: Electric City project has transformed corner of key intersection” (by John Cropley, April 7, 2019). Purposeful or inadvertent irony? An extensive piece at MyUpStateNYPhotos, originally posting on March 18, 2016, and updated yesterday, April 8, 2017. 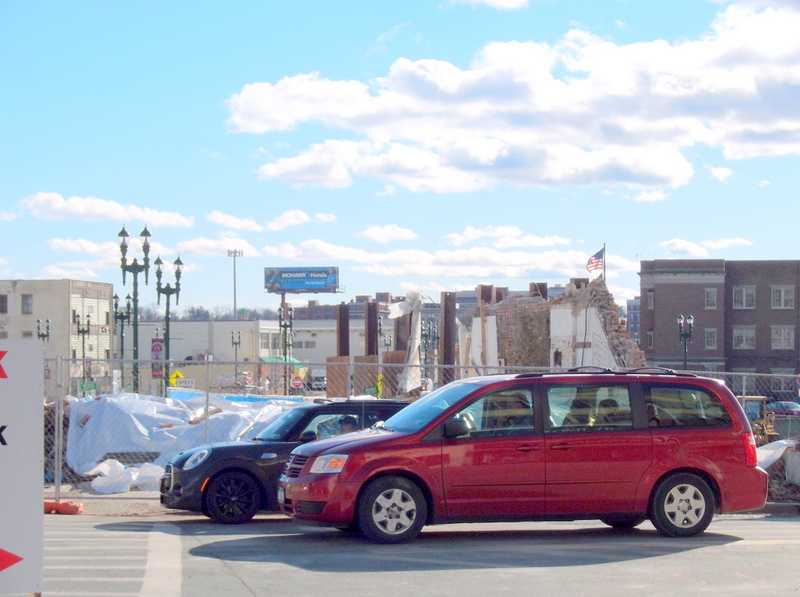 In addition to the building’s history, it has a good description of the problems that began in April 2016 during excavation for the Electric City Apartments complex next door, and ended in the demolition. It also notes that Nicholaus building suffered a large explosion in 1975, and the recent widow Mary Nicholaus considered demolition, but decided to repair it and continue. A weblog post at the Grems-Doolittle Library Blog of the Schenectady County Historical Society, “Good Food Without Frills”: Nicholaus Restaurant in Schenectady (May 14, 2014, by Library Volunteer Ann Eignor), which has photographs of both the exterior and interior of the building (including its famous bar; see image to the right from the Larry Hart Collection), as well as the Nicholaus family and restaurant staff, and a menu with German Specials, plus Loppa, a macaw parrot that was a longtime mascot at the Bar and was stuffed upon its demise and later donated to the Historical Society. 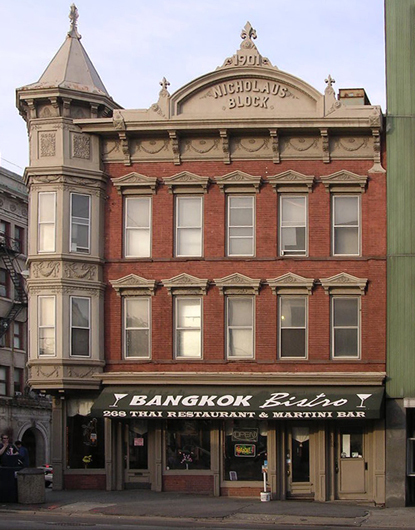 Nicholaus Block (266-268 State St.): Modern day Schenectadians know the brick building at the corner of Erie Boulevard and State Street as the home of Thai Thai Bistro (and before that, Bangkok Bistro). One of the few remaining buildings from the Erie Canal-era, it features bay windows and an ornamental roof engraved with fleurs-de-lis. The Nicholaus Hotel opened here in 1901. 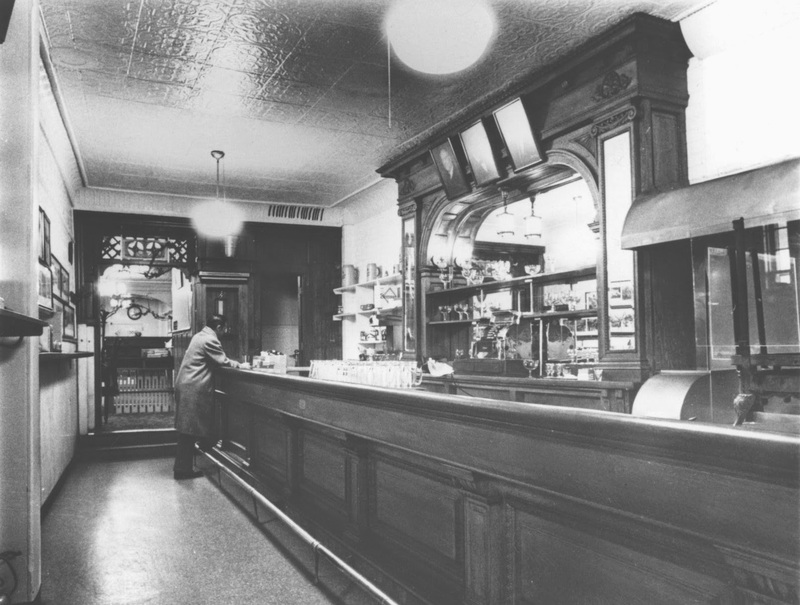 It housed the German-themed Nicholaus Restaurant until 1975 and then Maurice’s Readi-Foods until 2004. A good part of the building was actually built in the late 1820s, soon after the Erie Canal came through, and was used for many years as a saloon. The editor of this website moved to Schenectady in the apparently pre-modern year of 1988, and my first residence in Schenectady was on the block across the street from the Nicholaus Building, at Barney Square. That was the era of the popular luncheon spot Maurice’s Readi-Foods. I immediately admired the style of the old building, as I walked to my first local job, at Family Court. Since then, I have admired the beautiful bar and marveled at the Hofbrau-Haus murals that still graced the main dining room of the two subsequent Thai restaurants. I’ve continued to admire the building over the years, and am happy to say that I walked past it almost daily in the past month, on a new strolling-exercise regime. I am going to miss the Nicholaus Building, and surely will be mumbling about the bland modern building that will soon dominate that block. 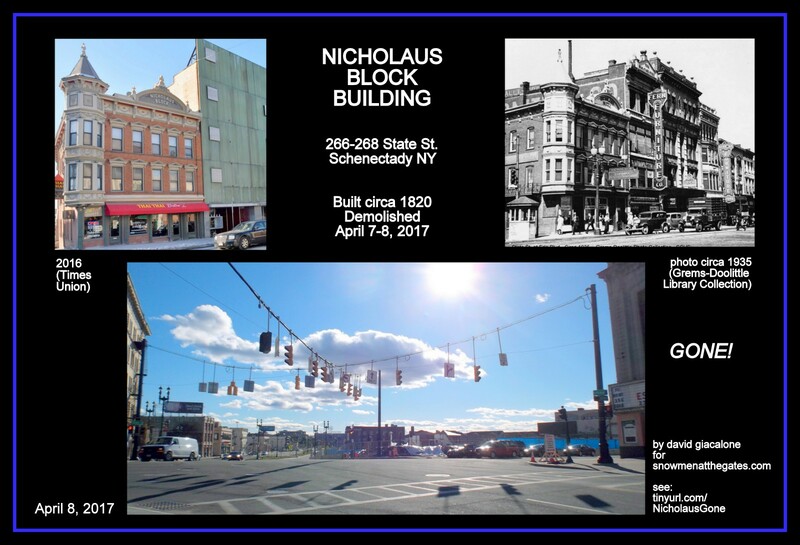 The Nicholaus Building holds far more “personal” memories for the residents of Schenectady than most of our other lost structures. I hope its demise will inspire sharing those stories (for example, by leaving a comment to this webposting). Whether it will cause the populace to be more vigilant and more vocal about our desire to preserve the dwindling stock of fine old buildings is another matter. Will Mssrs. Gillen, McCarthy, Gardner, and other decision-makers who act as if all development is good development, and all developers civic-minded heroes, get our message? We need to raise our voices much higher. . . as if it were never there . . The fate of the Nicholaus building represents the further loss of our trust in the leaders of our City and Metroplex. After so many half-truths, so much deception, and so many promises of preservation not kept, we never know if we can trust the information and excuses we are given for their actions and inaction. We keep hearing about a Renaissance in Downtown Schenectady, but it often feels like the Dark Ages. 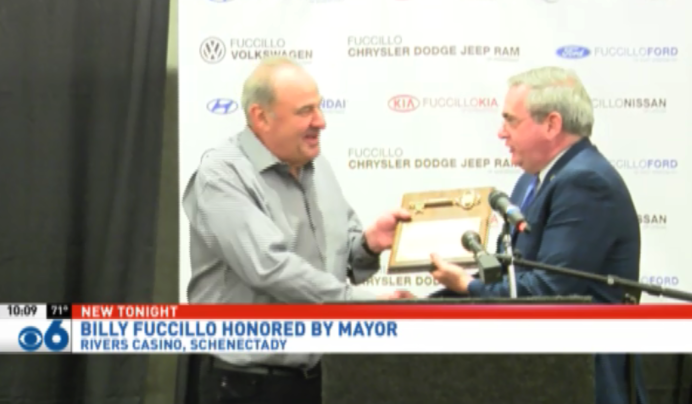 Last week, our leaders held a party to congratulate themselves for bringing the Casino to Schenectady, giving themselves far too much credit, in my opinion. They also boasted about spending two years orchestrating a free shuttle from Downtown to the Casino, at taxpayer expense. Perhaps Metroplex and City Hall should have spent a bit more time trying to save the Nicholaus Building. 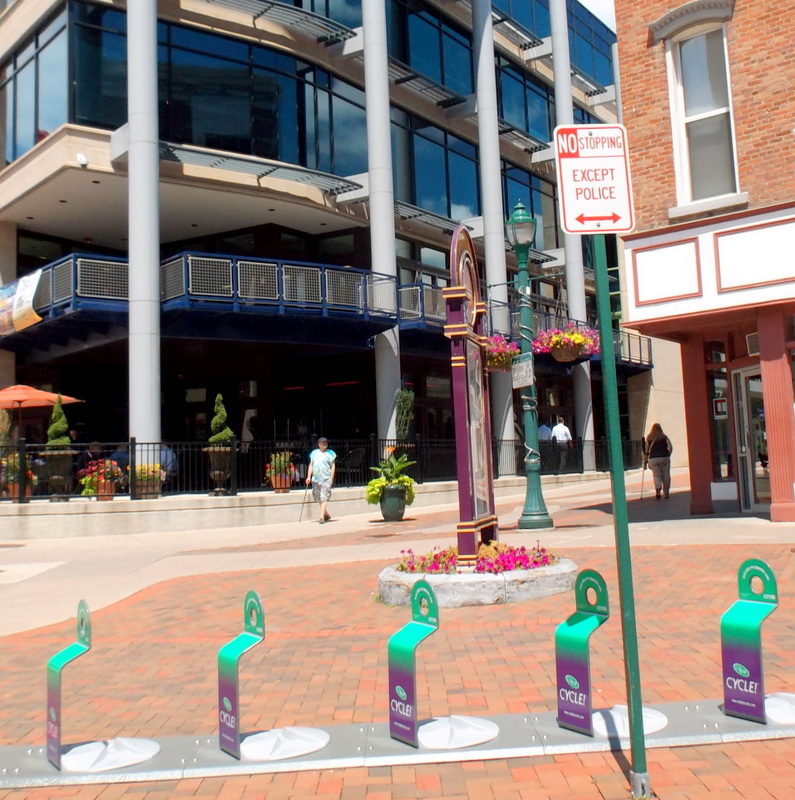 They might have, for example, pried some money from Rush Street Gaming, which has voluntarily given millions to other cities for community projects, to use to fix the Nicholaus stability issue. 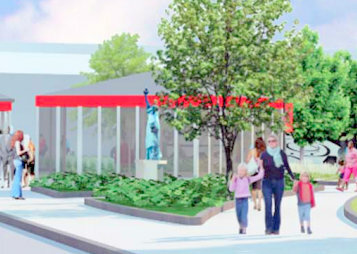 Or, a Metroplex loan or grant for the Nicholaus might have been offered, as such architecture is also a draw for downtown. 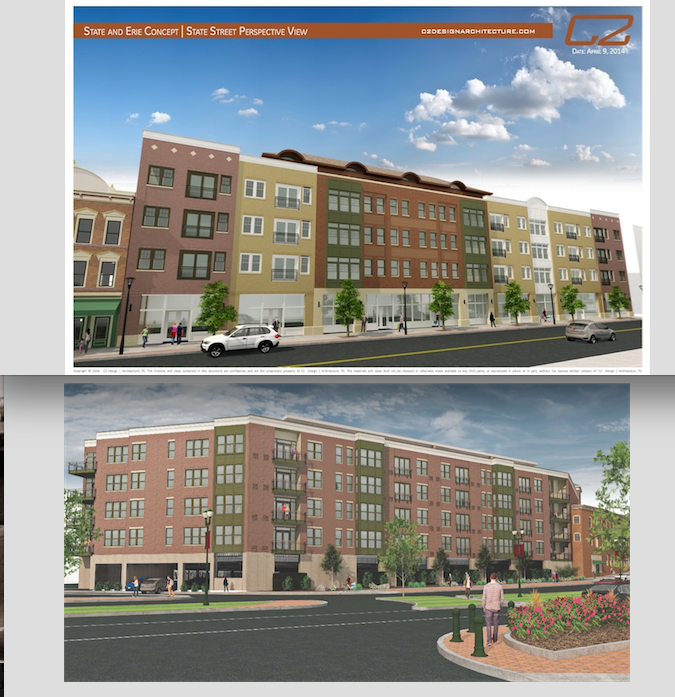 Now, we hear the City “will be seeking to recover the $168,000 cost of the demolition from the Chompupongs.” I’m scared to speculate on what will replace the Nicholaus Building in that wedge at the corner of Erie Blvd. and State Street. 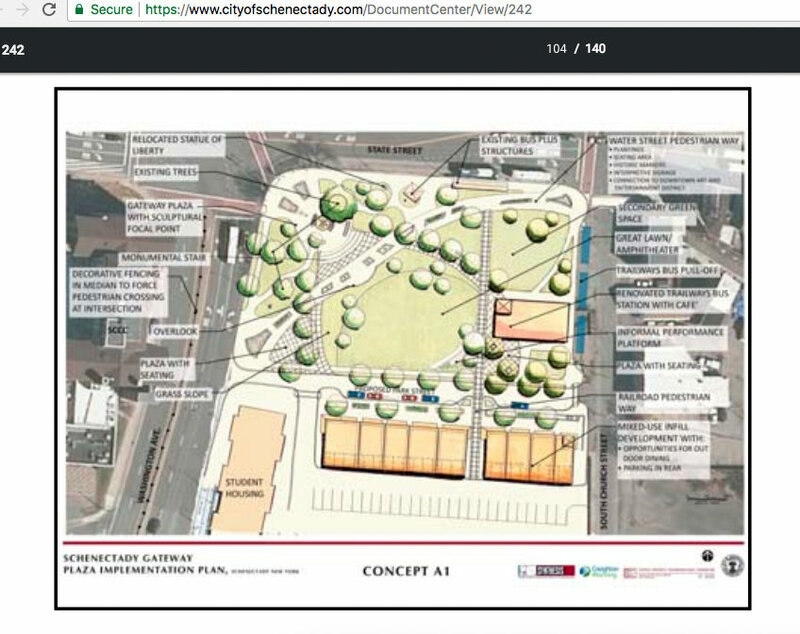 Perhaps, we will have a little bit of lovely green space, to compensate a bit for all of the green grounds originally promised for Mohawk Harbor, but now covered with parking lots and crowded structures. If it is eventually replaced by another building, I hope we will not get yet another less-than-mediocre façade slapped at too-little-expense on an unremarkable structure. Is that too much to ask? In Schenectady, perhaps it is. After the building was damaged, it was appropriate for Metroplex to hire a well-regarded engineering firm to provide plans for stabilizing the building. But, they should also have paid for the repair work. 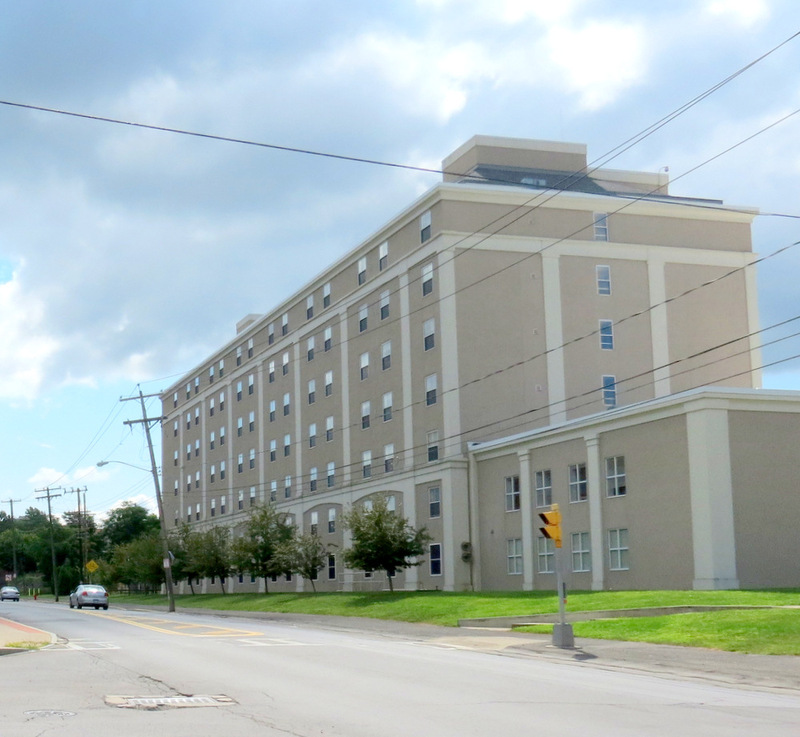 Highbridge/Prime is receiving a $1.2 million Empire State Development grant through Gov. Andrew Cuomo’s Regional Economic Council. These funds should have been used to repair the building. It was outrageous and unjust to expect the owners to pay for repairing damage others caused, and to recoup the expense through insurance or litigation. 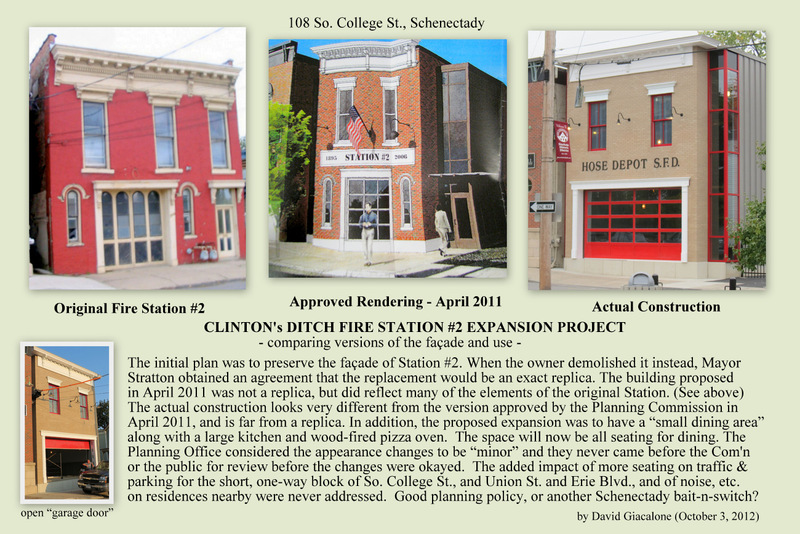 Adding insult to injury, the city of Schenectady intends to hand them the bill for the “emergency” demolition! 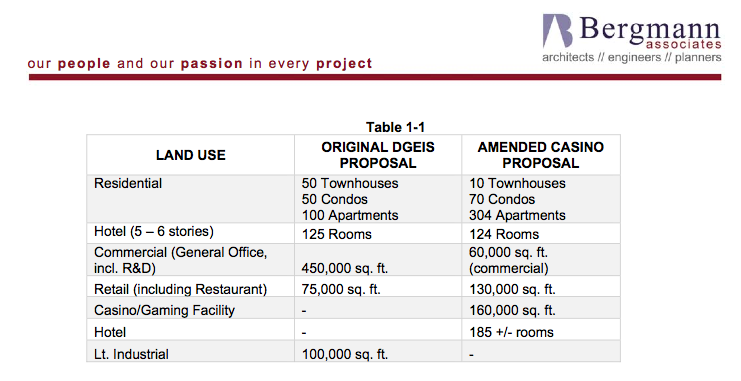 Now that the pesky Nicholaus Building is gone, Highbridge/Prime will proceed full speed ahead with its development. Fire Station #2 Ditched: .. click image for the story. 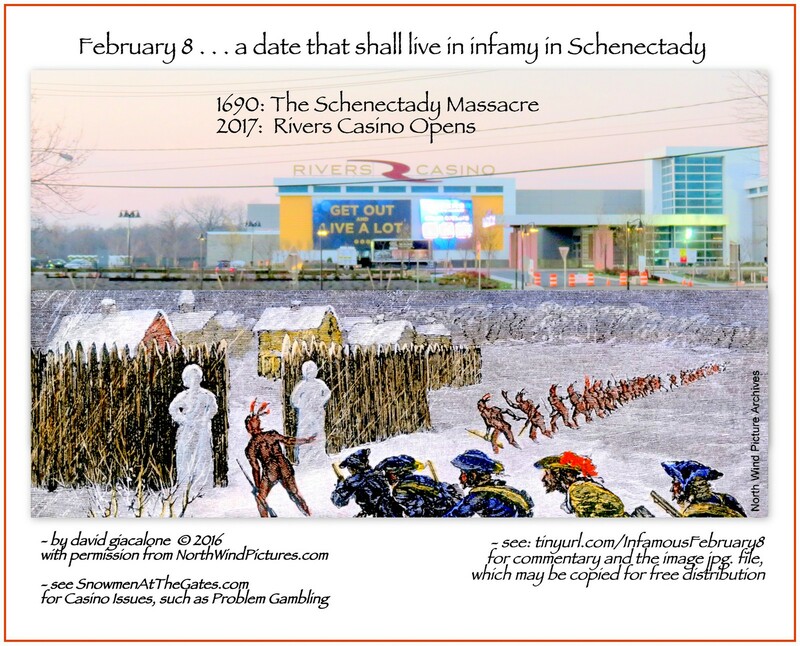 . . click on the image above for a larger version (formatted for 10″x8″) . .
Re: Massacre and Casino: Sadly, the timing of the casino opening has much more irony than merely coinciding with the date of the Schenectady Massacre. The website name “Stop the Schenectady Casino” was changed to “Snowmen at the Gates,” to symbolize that inviting in the Casino and capitulating to its proponents is part of a long history of Schenectady’s leaders not fulfilling their duty to protect the City and its people. 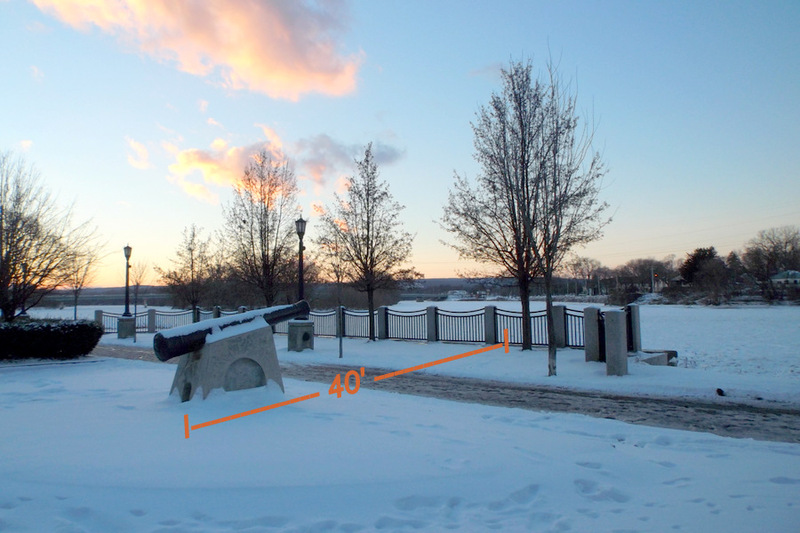 Our website name “Snowmen at the Gates” refers to the legendary snowmen “standing guard” in a blizzard, on February 8, 1690, outside the open north gate of the sturdy stockade fence that was built to protect the little village of Schenectady. Although messages had been received from the larger outpost at Albany warning that a war party was on the way that evening, the appointed sentries apparently decided to leave their posts to have a tankard or two at the nearby Douwe Aukes tavern. That dereliction of duty allowed a band of 114 French soldiers and 96 Sault and Algonquin Indians to enter the stockade, burn down the village, and massacre, kidnap, or scare away its residents. We who watched every element of our cheerleading City and County government [along with the Gazette] cave in to every demand of the Casino Gang (with only Mr. Riggi and Ms. Porterfield in opposition on the City Council), and ignore all warnings and research concerning the likely negative effects of a casino and ways to mitigate them, do not believe the lessons have been learned from the 1690 Massacre. Our Mayor, Metroplex Chair, and County Legislature prefer to have harmless, voiceless and blind Snowmen sitting on our boards and councils, turning over the keys of the City and the decision-making machinery to the Casino Gang. Perhaps we shouldn’t have expected the folks from Chicago’s Rush Street Gaming to recall the date of the Schenectady Massacre. But, didn’t anybody at City Hall or Metroplex Central see that date and point out the public relations problems it entails? 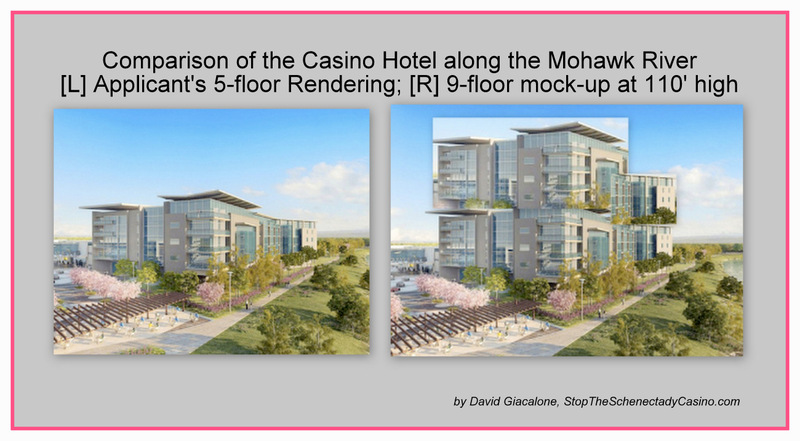 Or, is this a new notion of civic honesty about the casino and its impact on Schenectady? Our leaders and servants at City Hall need to be watchdogs protecting the public, not cheerleaders repeating the casino’s claims, or weaponless and mute Snowmen guarding the gates of our City, like on the night of the 1690 Massacre. Our leaders must take their time, use common sense, ask probing questions, and require full submissions about the factual basis of an Applicants’ claims, and deadline assertions, especially on projects as big and important as Mohawk Harbor and its Casino. And, they must actually listen to the warnings and suggestions of community members who want what is best for our City, not simply the best for their financial and political futures. Will the City, County and business leaders who are taking so much credit for bringing Rivers Casino to Schenectady, and did virtually nothing to mitigate or prevent its likely negative effects, melt like snowmen under the spotlight and heated questions that they can expect when things start to go wrong? Or, will they take responsibility, come up with meaningful solutions, and ensure that we are much more than a company town (a Casino Town)? (update: Jan. 21, 2017): We have started a new Category of posts called The Snowmen Effect, to show the consequences of our having public officials who are not properly protecting the public interest. The first installment is “casino choices in Upstate New York: who will choose Schenectady?” (Jan. 19, 2017), which compares our scandalously humdrum casino design with our casino competition. 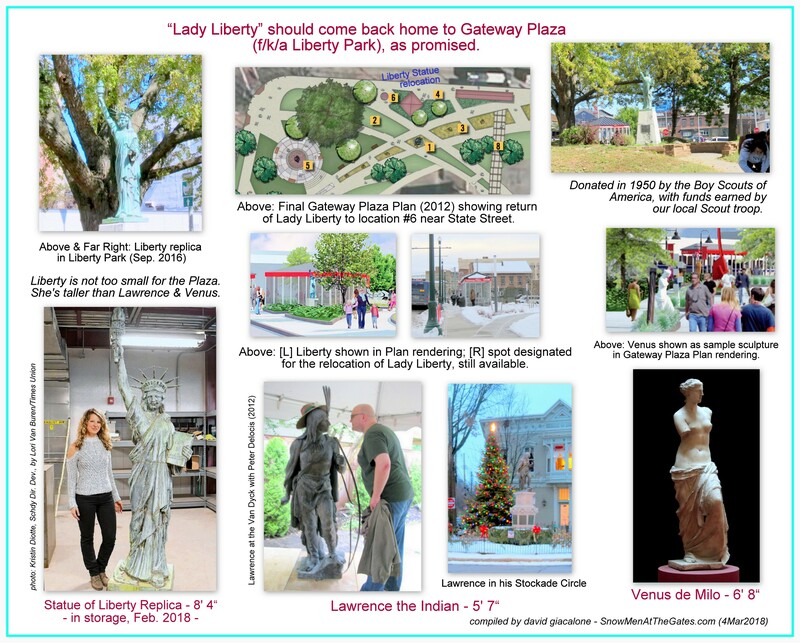 follow-up (Jan. 24, 2017): Many thanks to Schenectady Gazette columnist Sara Foss for featuring our Infamy Collage in her column today. “Collage makes for interesting conversation piece“. And, special thanks to “snowman expert”, cartoonist and author Bob Eckstein for introducing me to the story of the Stockade’s snowmen at the Gate and the fetching image, in his book “The History of the Snowman“. 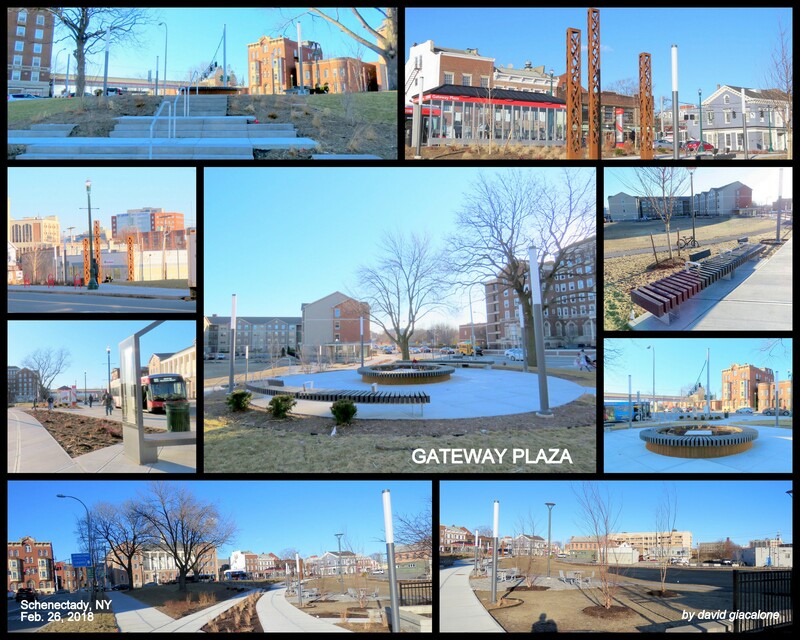 did haters visit Lawrence Circle? 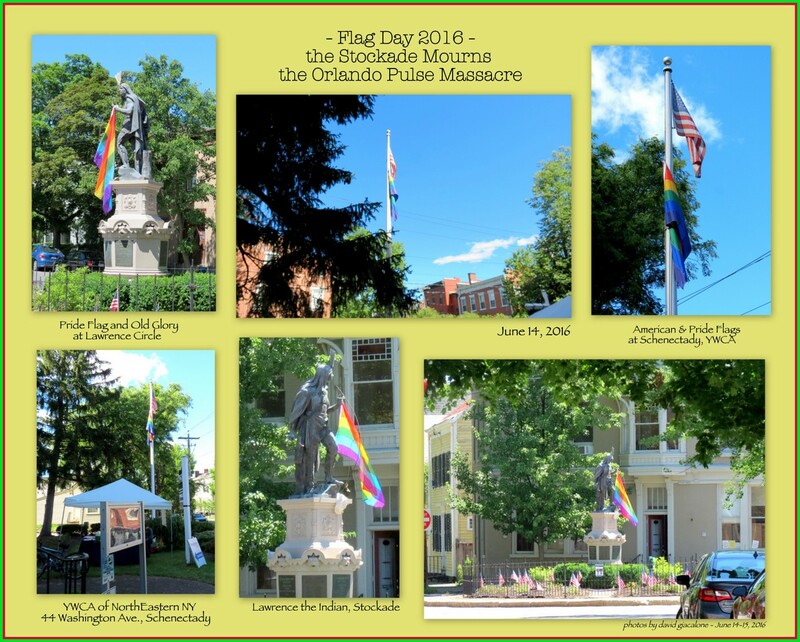 Last Tuesday (June 14, 2016) was Flag Day, and that evening a Pride Flag appeared at Lawrence Circle, in a symbolic show of support for the victims of the horrific massacre at the Orlando, FL, Pulse nightclub, and the LGBT community. 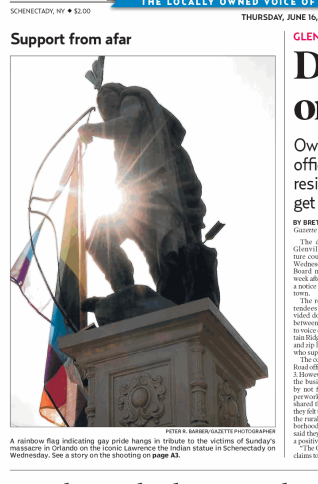 Today’s Schenectady Gazette had a photo of the flag and Lawrence on its front page. I am not sure exactly when, but by mid-morning today the Pride Flag was gone. Other then asking the question in the headline above, I will leave motives for others to speculate upon. I’m posting here at “snowmen at the gates” in the hope that our official, community, and neighborhood leaders will speak out for solidarity and love, not separation and hate. Oh, yes, and for good old American Freedom of Speech, too. 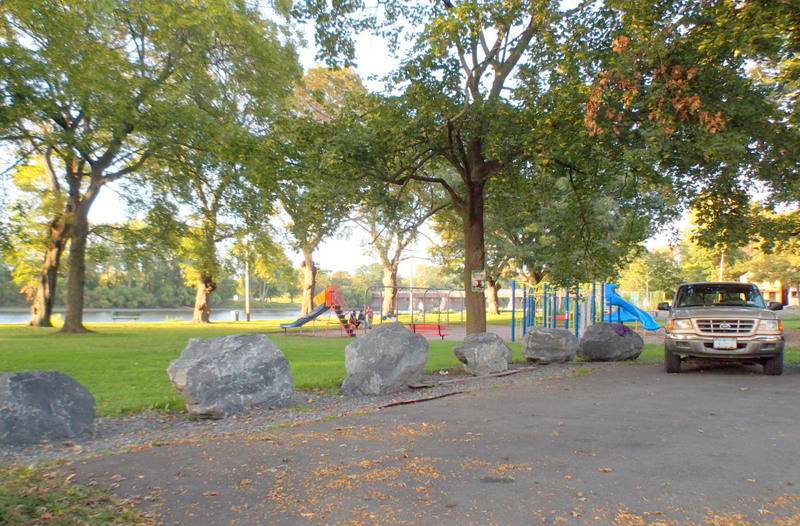 Second, Lawrence Circle is a public park, officially designated as a Neighborhood Park by the City of Schenectady. It belongs to no particular people or group, and free speech rights exist there, as on all public property. 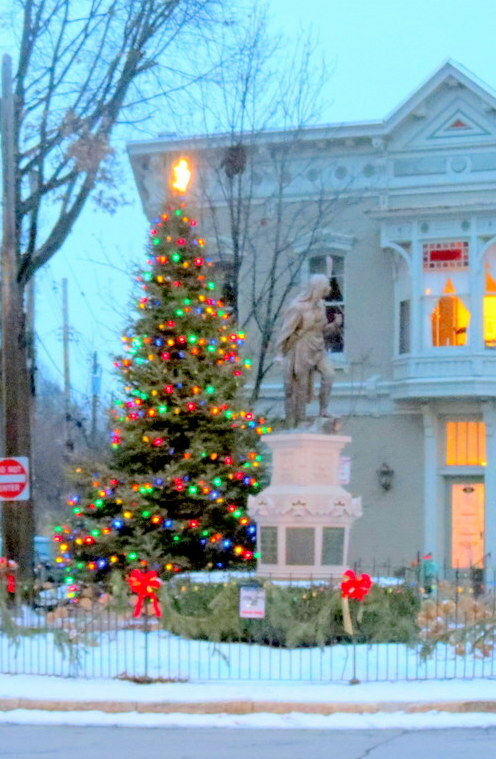 Those rights extend to any temporary display that does not vandalize the Circle or Lawrence’s statue (and is not within the very narrow legal category of pornographic). 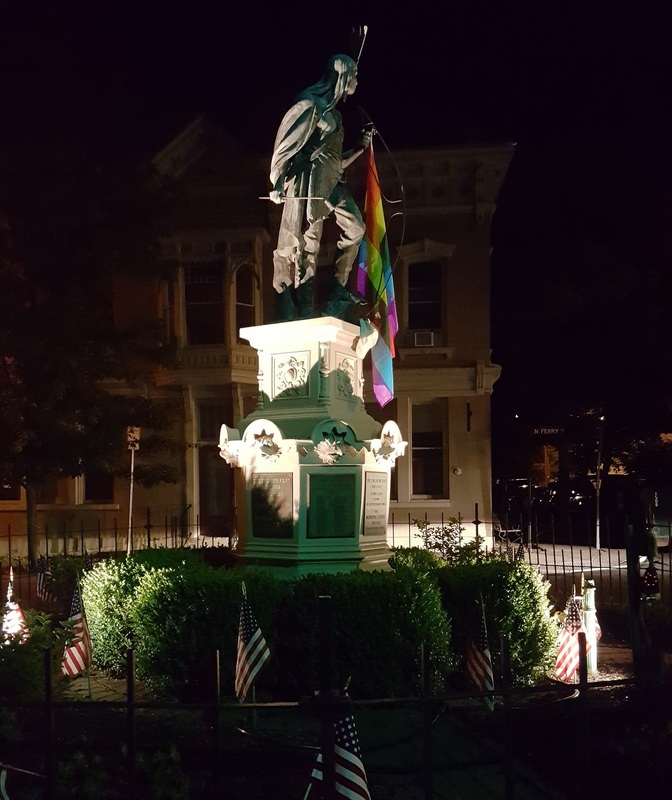 Even if you might think a display is tacky or you disagree with the sentiment, you have no right to remove a temporary display put up by others exercising their right of free speech. 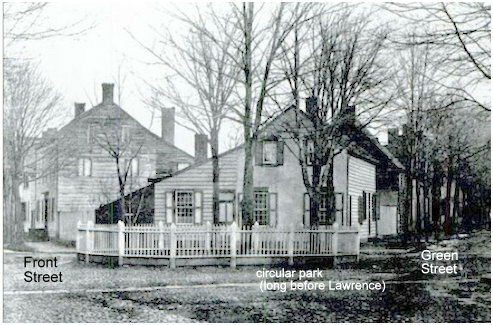 The second attachment shows the Public Park as it existed long before Lawrence. 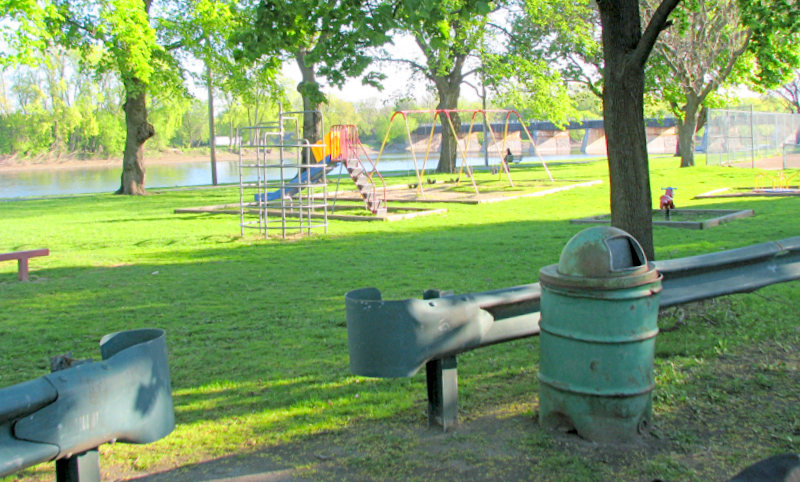 The third attachment shows that Lawrence was originally placed outside the park fence. 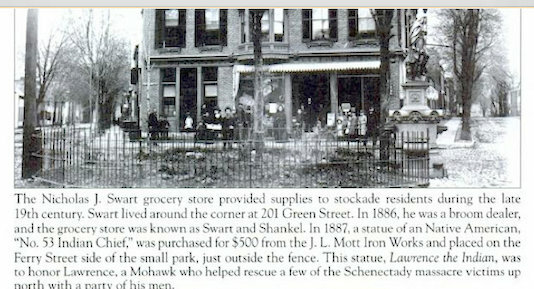 [source: SCHS, and Don Rittner’s “Schenectady: New York’s First Historic District.”] That Circle is not a sacred spot and Lawrence is rightly respected and celebrated, but almost certainly would not want to be venerated. p.s. The Huffington Post reprinted a powerful and telling piece from the Facebook page of Paul Rausnenbush (June 14, 2016), entitled “I’m Done Accommodating Religious Hatred Toward Queer Lives.” Amen.
. . . . . follow-up (March 29, 2016): see “what comes after a rush?“. 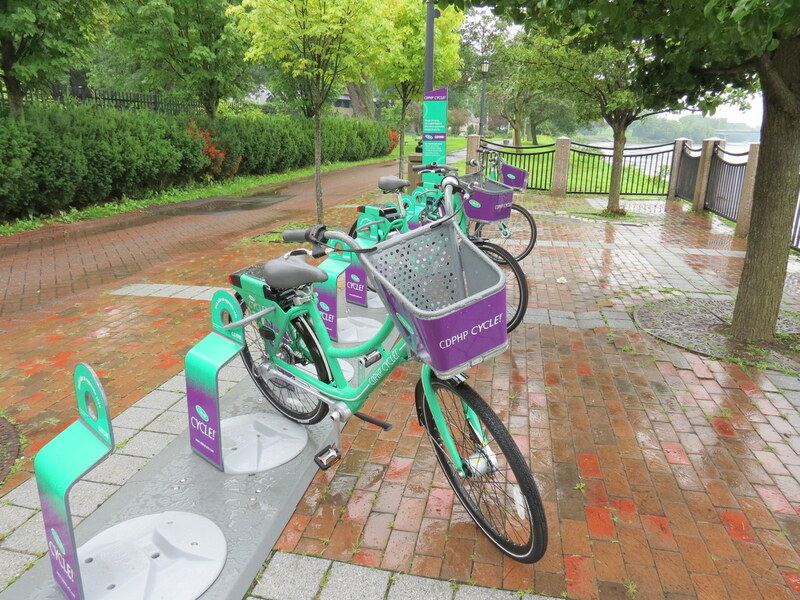 The City Council voted last night, and let’s just say “the fix is on” at Mohawk Harbor. 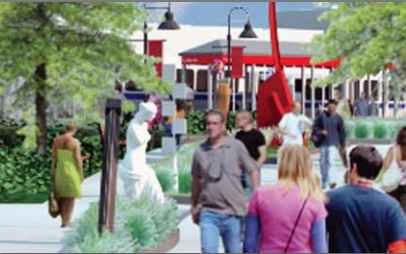 The proposed streets are Rush Street, which is an extension of Nott Street off the roundabout entering the site. 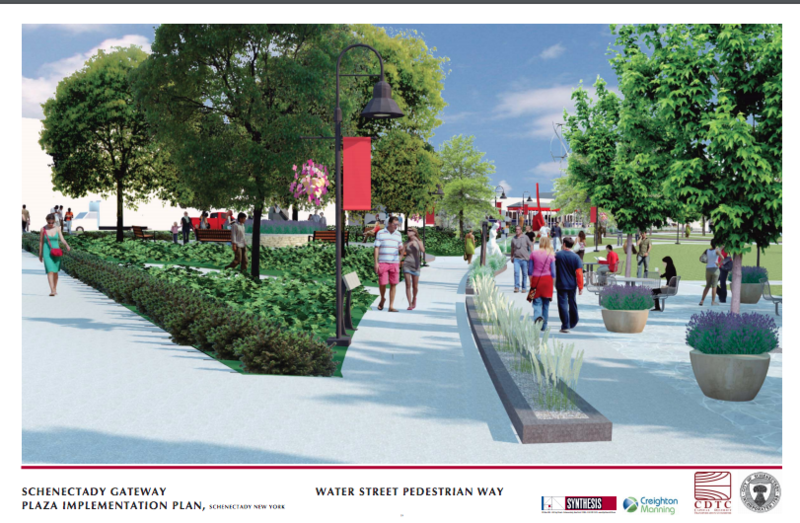 Off of Rush Street to the right is the proposed Harborside Drive, which runs parallel to Erie Boulevard. Off Harborside Drive to the right is the proposed Mohawk Harbor Way, which is an extension of Maxon Road. 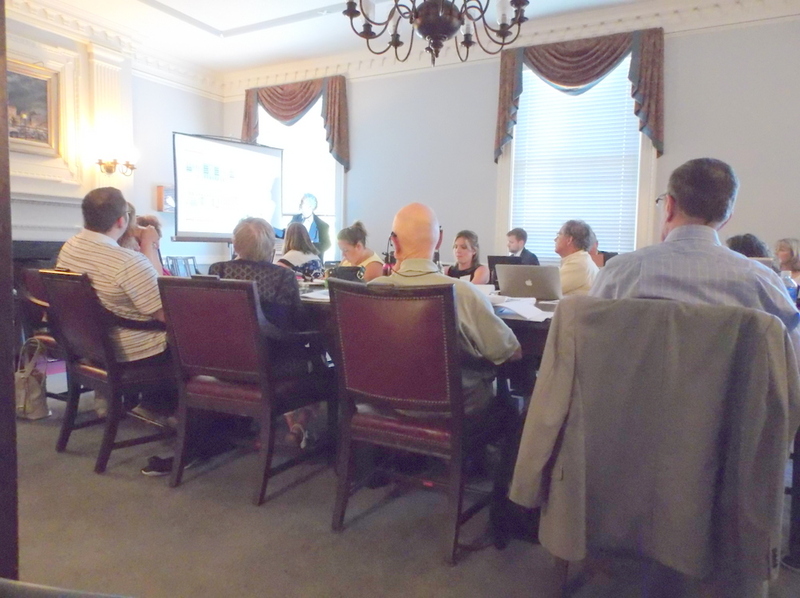 Although she has no problem with the name Rush Street, City Council President Leesa Perazzo proposed holding a non-mandatory public hearing on the street name resolution, to seek the public’s input, and the Council unanimously concurred. Perazzo acceded to the opposition of council members Marion Porterfield (Dem.) and Vince Riggi (Ind. ), who expressed concerns about having a street named after the casino operator, and refused to vote the resolution out of the Public Services and Utilities Committee. I’d like to suggest that the words “American Locomotive” be used in the street name, whether it is dubbed a street, avenue, boulevard, or lane. 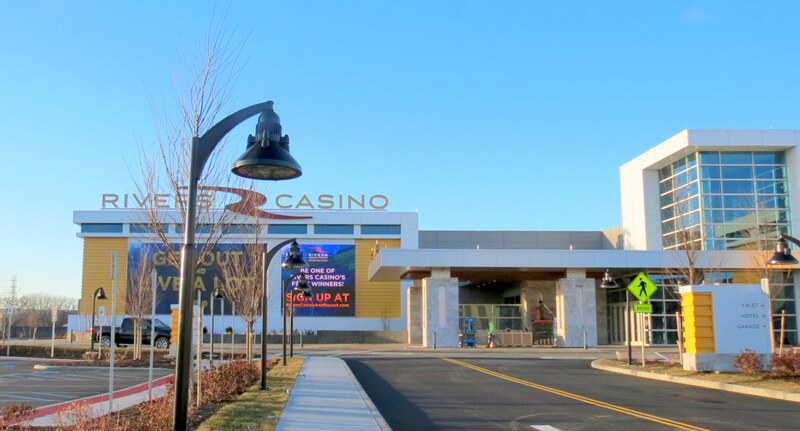 In addition to paying tribute to the site’s past, the name American Locomotive, or similar words, will suggest that Mohawk Harbor and its Casino can be an Engine for Economic Growth in Schenectady, without suggesting that Schenectady should be or somehow already is proud of the City’s role in the Gaming Industry and related businesses. For myself, and many other people in our City and County, the existence of a casino in Schenectady may be seen as potentially good for employment and our tax revenues. 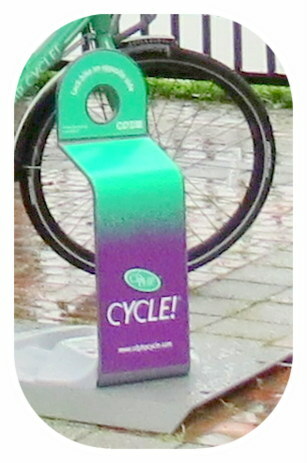 It is not, however, a matter of civic “pride”. A casino does not and will not invoke for the City a feeling of satisfaction or pleasure taken from its achievements, nor a feeling of dignity, value or self-respect. Even if well run by a committed workforce (with their own personal pride in a job well done), and if enjoyed by customers for its entertainment value, it is merely a part of the leisure industry. A casino will “produce” entertainment for some, riches for a very few (mostly living elsewhere), but nothing that speaks of greatness and of a community’s special skills and dedication. And, although denied by its cheerleaders, a casino has the potential to have a significant negative impact on many aspects of the life of our community and its families. I am proud of Schenectady’s connection to ALCO (and to GE), but I will never be proud of our City’s connection to the Gaming Industry, or to Rush Street Gaming. Honoring our past with a name like American Locomotive Drive — or simply the powerful “Locomotive Drive” — would be an important reminder to our residents and visitors of our proud and productive past, and of our faith in a future beyond the narrow scope of the gaming industry. What’s wrong with the name Rush Street? The vast majority of people considering or actually coming to Mohawk Harbor do not have the slightest idea what Rush Street Chicago is. That name is highly unlikely to draw any significant numbers of people from our very local/regional geographic market. 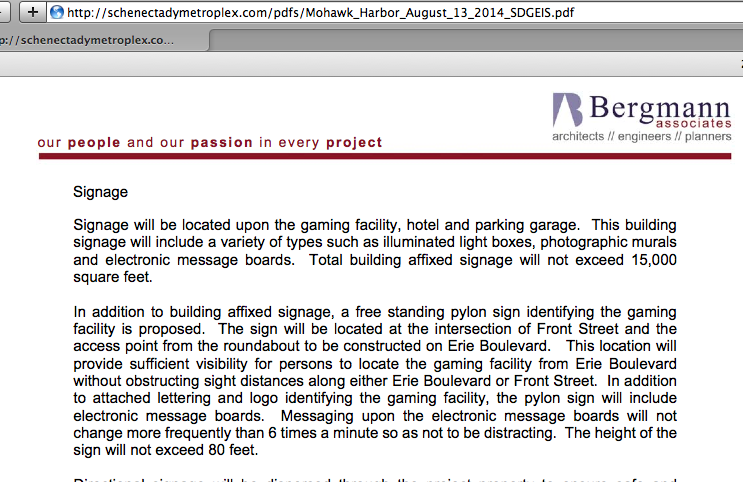 If Rush Street Gaming truly wanted to make Rivers Casino in Schenectady a world-class entertainment destination, it would not have given us a casino designed to look like an outdated shopping mall (while proposing imposing casinos elsewhere), and it would not be requesting a pylon sign so huge and homely that it would never be permitted within several miles of Chicago’s Rush Street. Ironically, Dr. Rush was a prominent advocate for temperance. He fought to include bans on “gaming, drunkenness, and uncleanness” along with “habits of idleness and love of pleasure”, in the U.S. Constitution. He also campaigned against taverns and “clubs of all kinds where the only business of the company is feeding (for that is the true name of a gratification that is simply animal) are hurtful to morals”. [See”The Benjamin Rush Prescription“, by psychologist Romeo Vitelli.] This leads me to believe Dr. Rush would strongly oppose naming the casino roadway Rush Street. 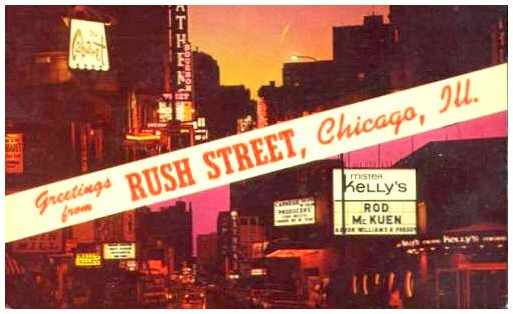 The Many Meanings and Connotations of the Word “rush”: The word “rush” has many meanings as a verb, adjective, and noun, and quite a few of the meanings conjure up notions that seem unseemly, misleading, or unworthy for a great City and sober community to be pushing. One example, of course, is the rush one gets from taking certain drugs. As described at Dictionary.com: “the initial, intensely pleasurable or exhilarated feeling experienced upon taking a narcotic or stimulant drug.” The little yellow bottle seen on the right contains a product deemed a liquid incense or aroma popper, thought of as cheap form of “club drug”. No matter what fans of the product my say or feel, neither the item nor the word comes to mind when I think about responsible gambling. And, even if lots of the old rockers on the Senior Casino Tour buses arriving at Mohawk Harbor are fans of the band Rush, I’m finding it hard to fit the lyrics to their biggest hit, Tom Sawyer, into a useful mindset relative to the future of the City of Schenectady. Naming the Street after Rush Street Gaming. Pretentious. At-Best Premature. Surely proof that Fools Rush In. 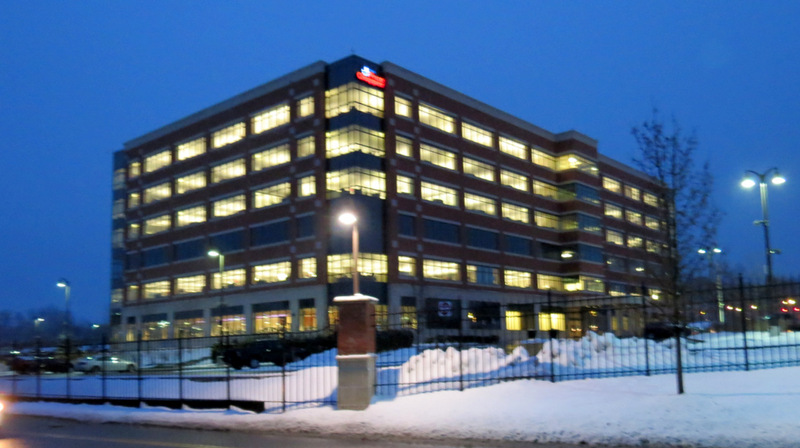 Rush Street Gaming has yet to prove that it will be a good corporate neighbor or citizen in Schenectady, and thus perhaps the recipient of an Honorary Street Name some day. 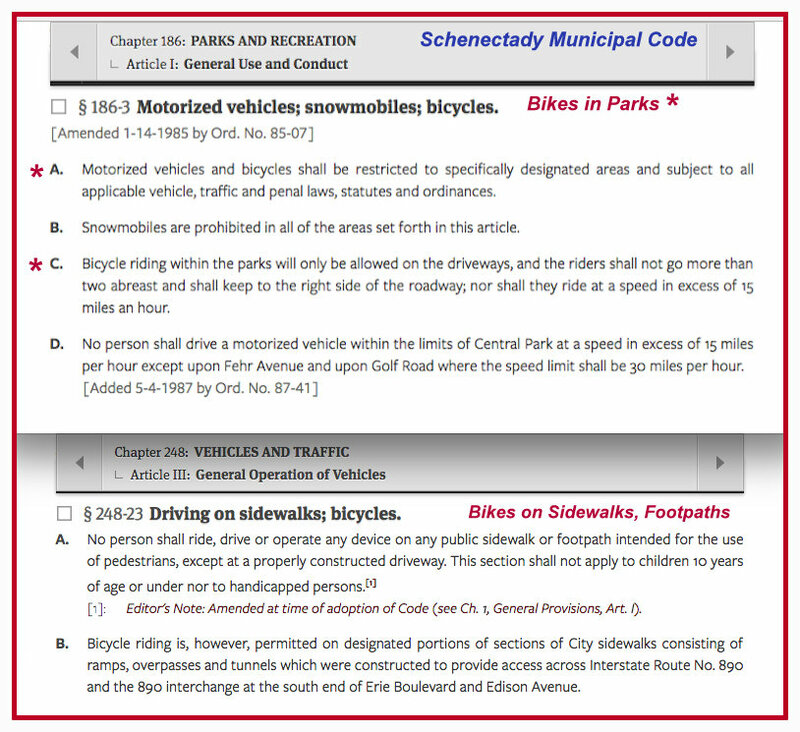 At “Snowmen at the Gates” (f/k/a Stop the Schenectady Casino)), there is plenty of proof that RSG asks for much and gives virtually nothing it is not forced by law to give. It certainly has been far more generous at its other casino locations with extra funding for local development and community services, and general mitigation of impact expenses, than in Schenectady, where the Mayor and City Council have given it all it wants, and more. 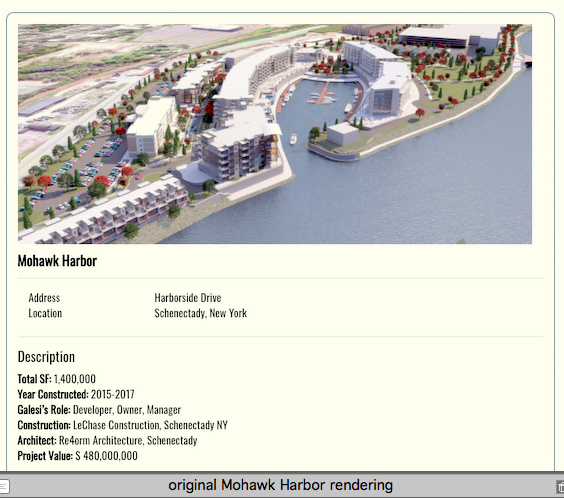 Moreover, Neil Bluhm is far too good of a businessman to refuse to listen to offers to buy him out at Mohawk Harbor. E.g., in 2012, he and Greg Carlin sold their Riverwalk Casino in Vicksburg, Miss., just four years after it opened, and after failing in their immediate request for a 60% reduction in their property tax assessment. That makes the Rush Street connection less than solid. Our elected leaders should have some self-respect and say no to this name grab. That could start a great new precedent, asserting that Schenectady has a casino, but is Not a Casino Town. Conclusion: Even if “Rush Street” were tolerably acceptable as a street name in Mohawk Harbor (which it is not), honoring our ALCO history and signaling our belief in a future that will once again be productive and worthy of civic pride are goals that point strongly to rejection of the street name Rush Street. have we learned the lessons of the 1690 Schenectady Massacre? . . click on the images above to go to their page in the New York Public Library Digital Collections . .
Our name “Snowmen at the Gates” refers to the legendary snowmen “standing guard” in a blizzard, on February 8, 1690, outside the open north gate of the sturdy stockade fence that was built to protect the little village of Schenectady. Although messages had been received from the larger outpost at Albany warning that a war party was on the way that evening, the appointed sentries apparently decided to leave their posts to have a tankard or two at the nearby Douwe Aukes tavern. That dereliction of duty allowed a band of 114 French soldiers and 96 Sault and Algonquin Indians to enter the stockade, burn down the village, and massacre, kidnap, or scare away its residents. The details of this event have been rewritten many times in the form of poems, song and history books, based mostly on rumor—often done to suit the desires of different political sides at work. 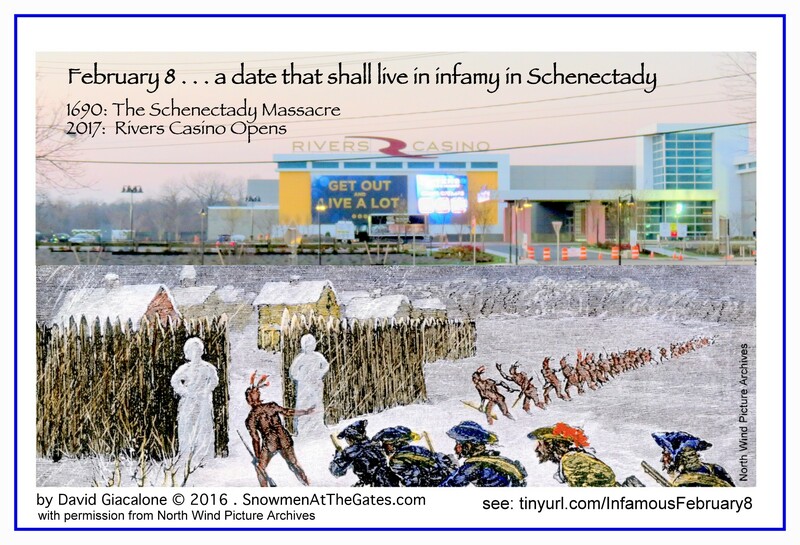 In addition, neither Bob Eckstein nor I have found any source that denies the gates were left open (stuck in the high snow) with no human sentinels in place when the French and Indians from Montreal arrived with malice in their hearts at Schenectady’s north gate. Like Eckstein, I agree that the villagers were wrong to assume that no human would be traveling, much less attacking, under such bad weather. That sounds like a lame excuse made up after the fact, as midwinter raids in deep snow had been made before, and blizzard conditions would make the raiders harder to detect and the guards perhaps less able to respond. 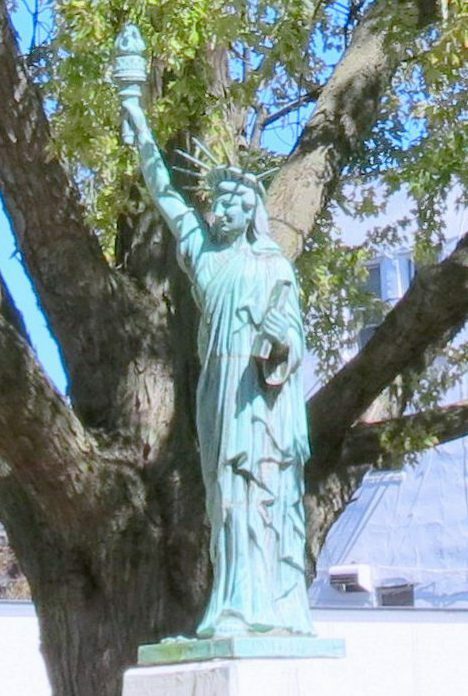 [T]he people of Schenectady were divided in their sentiments, and though warned of their danger by the friendly Mohawks, still, incapable of union, they failed to obey either power and fell into anarchy and subsisted without any government. The result was that, though the village was surrounded by a stockade and had a garrison of eight soldiers commanded by a lieutenant, the gates of the stockade were upon this night of destruction left open and unguarded, and citizens and soldiers slept the sleep of the just. Eckstein sees no reasons why the snowman detail in the Massacre story would be a fabrication. One reason he gives is that “No one slanders a person by falsely accusing them of making a snowman of all things.” I agree with his conclusion, but not with that particular reasoning. Charging that a soldier or citizen detailed to guard the village went AWOL thinking snowmen would serve as adequate sentinels seems very serious to me, surely worthy of a courts martial, especially given the resulting massacre. Indeed the seriousness of the charge, made more scandalous by claiming the guards were drinking at a tavern rather than at their posts, seems like a very likely motive behind the people of the Stockade wanting to deny the incident and hushing it up. For one thing, descendants of some of those Dutch families are still living in Schenectady or its vicinity. We’ll never know whether the AWOL guards really thought the snowmen would fool a raiding party. Eckstein is probably correct that no one was likely to stop to build snowmen in the middle of a blizzard in the dark. But, it seems highly likely that there would be snowmen built near the gates of the stockade. 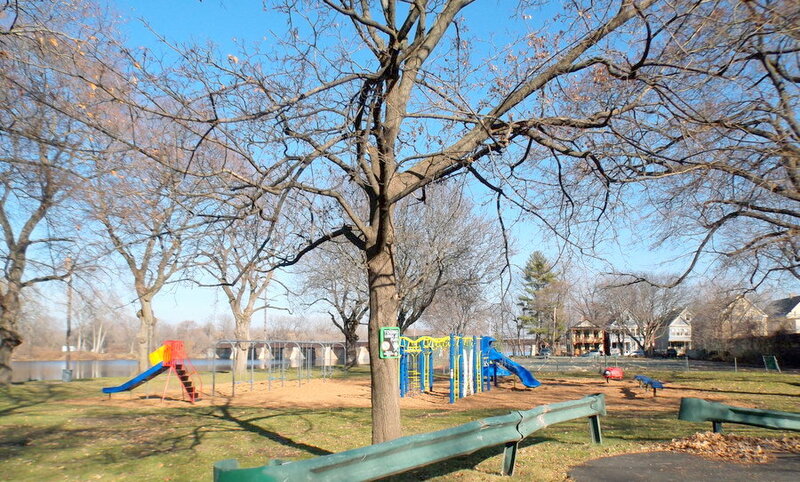 More than half of the inhabitants of Schenectady at the time were children, with no iPads or x-boxes or even tv’s available to keep them indoors. Building snowmen seems like a natural recreation, and would allow the kids to play soldier (and Indian). Given the treacherous surrounding countryside, parents and guards would almost surely have kept the children close to the stockade gates to monitor them better and help assure their quick return if danger arose. Beer and heartier beverages were an important part of Colonial life and some of the more prominent original settlers of Schenectady brewed and sold these beverages in their taverns and inns. Alcohol was not just limited to the men in New Netherlands, women and children were also known to drink. Early Dutch settlers were so fond of imbibing that when Peter Stuyvesant became director-general of New Netherland, he passed several restrictions on drinking and selling alcohol. [Douwe Aukes De Freeze] kept an inn or tavern . . located at the corner of State street and Mill lane, near the first church erected in the village. Douwe Aukes’ inn apparently was the herding place of the villagers and the recognized center of festivities, for it is said that high carnival was or had been in action there the night of the massacre in 1690, which in some degree may have caused the pervading insensibility to the impending slaughter of the citizens. 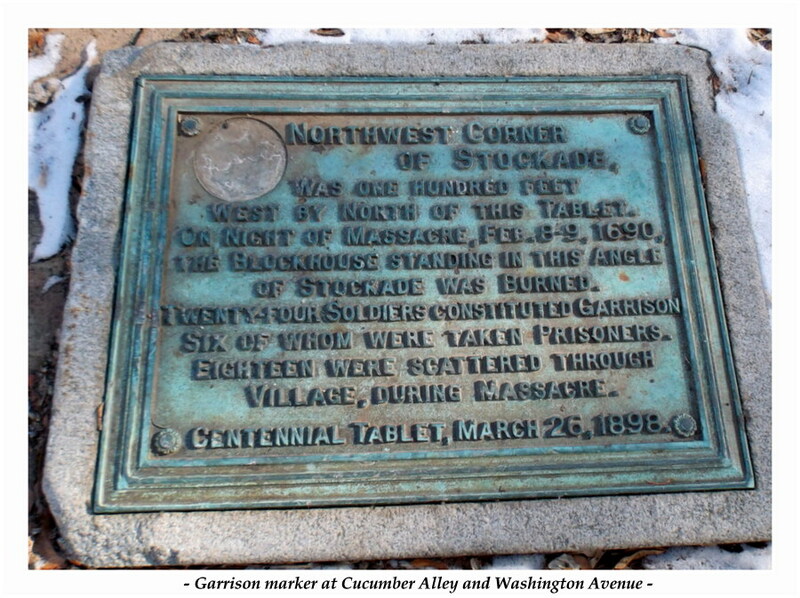 An 1898 Centennial Tablet located at Cucumber Alley and Washington Avenue states that there was a 24-man garrison located in the stockade the night of the massacre, and that “18 were scattered scattered through village, during the massacre.” I’m not certain, but that might suggest that six of the soldiers were at Douwe Aukes’ tavern when the raid took place. 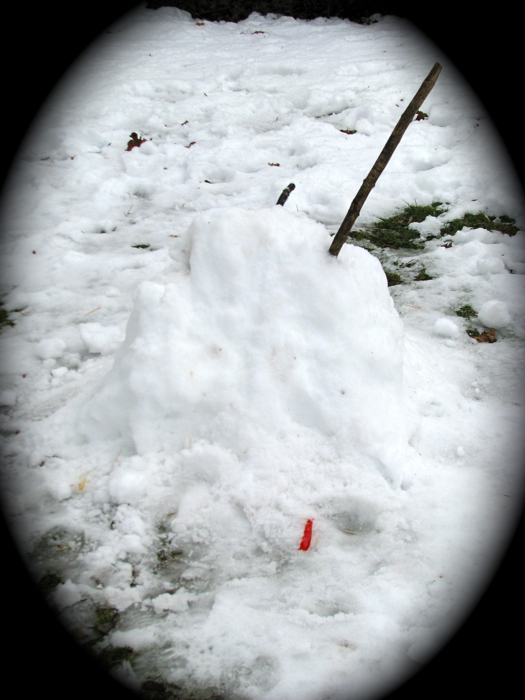 Despite the weight of the evidence supporting the historical existence of snowmen outside the open stockade gate on the night of the Massacre, the very recently published February 2016 edition of the Stockade Spy, the newsletter of the Stockade Association, has a front page article stating that the tale “of the Snowmen Sentinels that failed to protect the village, remain[s] subject to skepticism and speculation.” The author, Samuel Maurice, also calls it a “tall tale.” In a similar vein, the historical marker to the left of this paragraph,erected at the Centennial of the City’s charter, says only that the raiding party “entered during night at north gate,” without mentioning it being rather easy to enter. Maurice gives more credibility to the Ride of Simon Schermerhorn that night to warn the people of Albany of the attack, than he does the snowman story. Some Schermerhorn Skeptics wonder if he wasn’t just fleeing or looking for medical help for his wounds. The people of Fort Orange at Albany, of course, knew the raiders were heading for Schenectady that night. 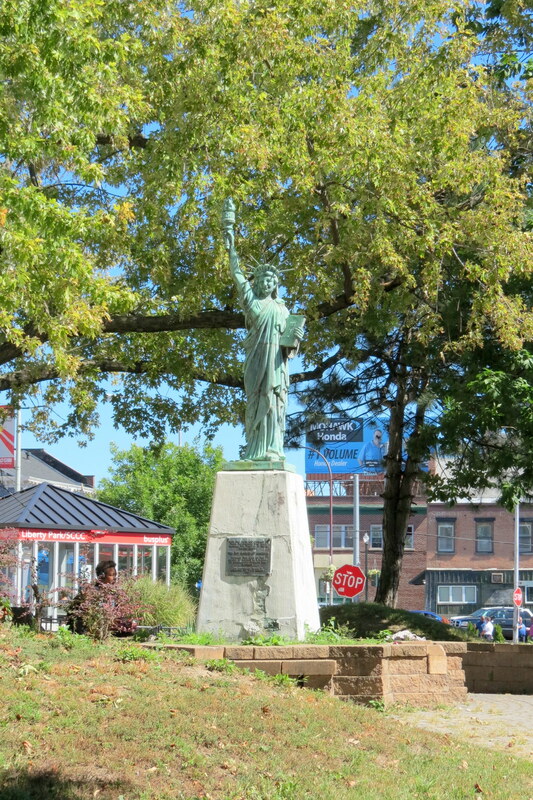 Simon might have had mixed motives, but Schenectady needs as many heroes as it can get for the sad tale of its Massacre. 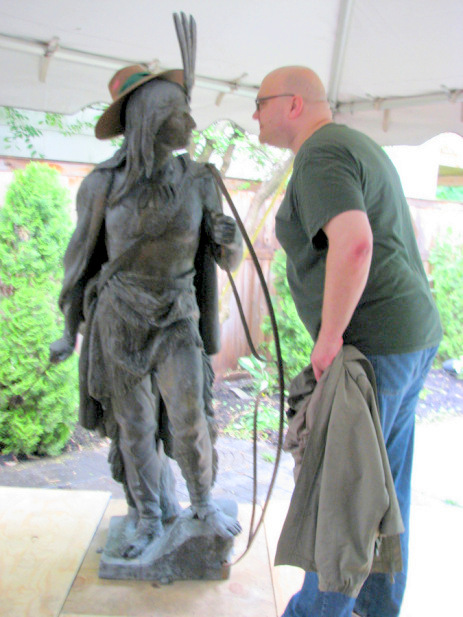 (2) The Stockade Association is perhaps the prime private organization targeted by this weblog when it asks whether Schenectady’s watchdogs are adequately on guard and acting to fulfill their duties to protect our community. (It is, of course, the one I know the best, as a resident of the Stockade.) Over the past few years, the leaders of the Stockade Association, and an often indifferent membership, appear to this observer to be sleepy, toothless watchdogs. 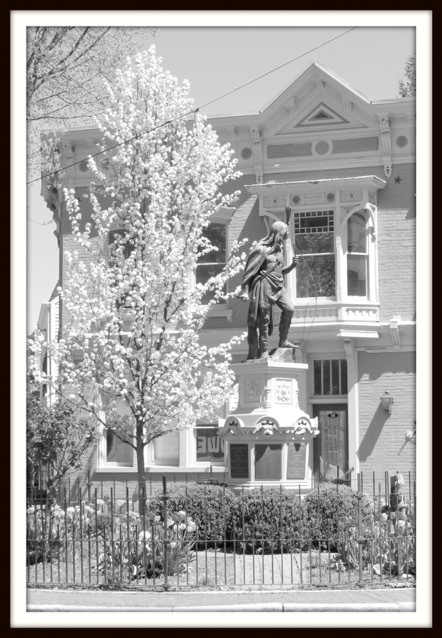 They seem unwilling to fulfill the organization’s primary objectives, as stated in its charter and by-laws, especially: the “Promotion and preservation of the residential character of the Stockade Historic District”; the “Representation before any City or County governmental agency or component on matters affecting the neighborhood”, and enhancing the safety and beauty of the neighborhood. The most glaring examples are, first, the failure to put the issue of the Schenectady Casino (a mere half mile from the district’s western boundary) on its agenda, in order to allow full discussion, promote needed research, and gauge the support or opposition of residents and property owners. And, second, the current refusal, despite new leadership, to ascertain — and, more importantly, to simply ask the Planning Commission to find out through a competent Visual Impact Assessment — how the giant Rivers Casino pylon sign and LCD screens will affect our skyline, nightscape, and traffic safety. 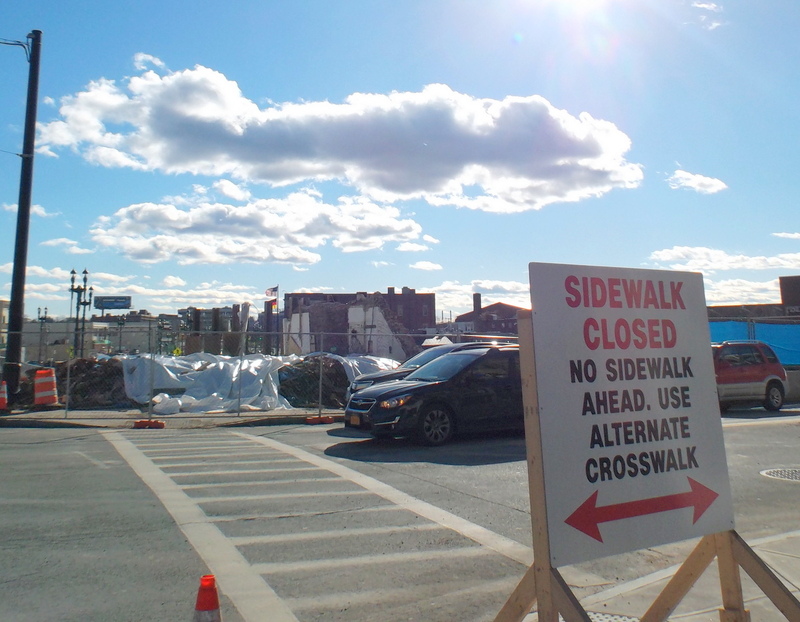 (update) We need to add: (3) The failure of the Association to strongly protest the suggestion by the City Engineer early in 2016, that the office would continue to favor the “Ferry Street” process of repairing sidewalks and repaving streets, is similarly inexcusable. See information and commentary on our Save Our Trees portal. when choosing sentinels to stand guard or to police the community, make sure they have the heart, brains, and stamina needed to fulfill their duties. No Snowmen Need Apply. Have the people of Schenectady, its government, elected officials, civil servants, and community leaders and groups, etc., learned the lessons of the 1690 Massacre and put them to practice consistently? Far too often, it seems, the answer is no. That conclusion applies in spades when it comes to what is surely the most important continuing governmental role this Century: preparing for the selection, construction, and operation of a casino in Schenectady. (See the list of postings in the Home Page sidebar.) We need observant, curious, active, and diligent watchdogs — with a pulse, and both a bark and a bite. One more thing about snowmen: beside serving no useful offensive or defensive regulatory or watchdog role, they are very averse to heat, hoping to avoid it and its damaging effects whenever possible. 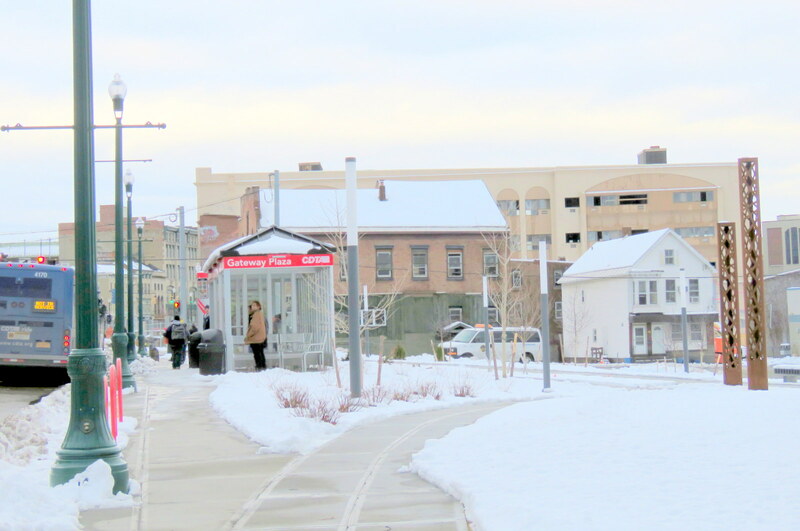 Yesterday [in another February 8th disaster for our City], Schenectady Mayor Gary McCarthy made public his decision not to re-appoint to the Planning Commission its newly-chosen chair, Matthew Cuevas, ending Cuevas’ service after more than two decades. Clearly, the Mayor is not interested in keeping a Planning Commissioner, especially one with the powers of the Chair, who is actively interested in enforcing the zoning laws, fulfilling their promise to protect the interests of all residents of Schenectady, and not merely those of the Mayor’s favorite few applicants and their proposals. Gary McCarthy wants Commissioners who are mere snowmen, looking like sentinels but offering the community no real protection — and, like wise snowmen, avoiding the damaging effects of heat whenever possible. . . above: Snowman Sentinel before [L] and after Heat applied . Why fire Matt Cuevas? Emperor McCarthy could not stand to have a Planning Commission chair who would occasionally ask questions at public sessions about the done deals sent to the Commission by his Zoning and Development staff and Metroplex. 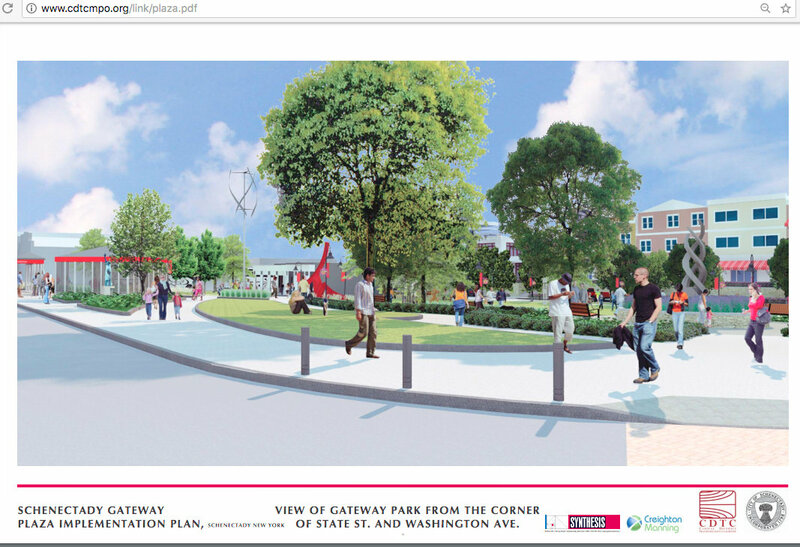 For example, Matt Cuevas noted during the Meeting on the amended waterfront district zoning that taking away the right of public access to the riverfront at Mohawk Harbor was inconsistent with the Commission’s Comprehensive Plan and 2008 Waterfront zoning goals. 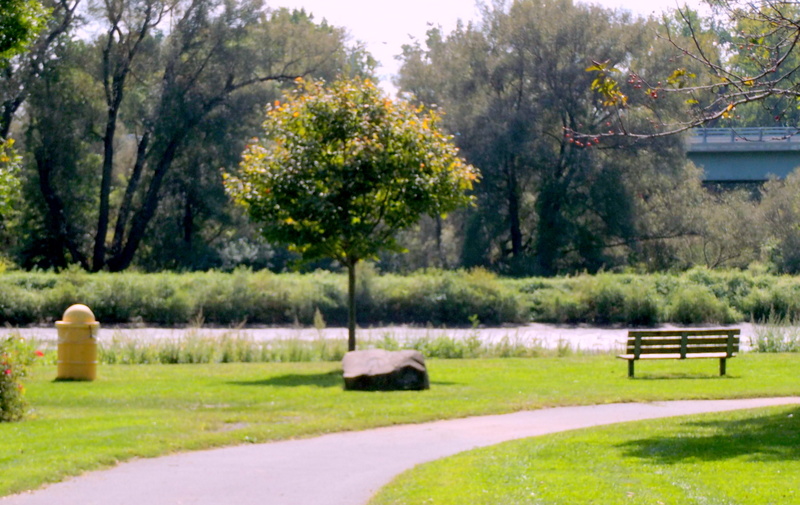 Schenectady needs a Planning Commission chair who takes seriously the role of protecting the interests of the people of this City and preventing unnecessary negative impact on our neighborhoods. We need a Chair who will ask the staff for full explanations of the pros and cons of proposals, and require that all information needed to make a responsible decision is obtained before decisions are made by the Commission. Assists various developers in obtaining financing, local permits and SEQRA approval for large commercial, housing and retail developments. Negotiation and drafting of complex commercial leasing, acquisition and conveyance agreements in connection with commercial office, retail, hotel and industrial properties. By The Way: Beach’s law firm now rubs elbows every day with Metroplex staff at Center City, as one of the five initial members of the newly announced innovation Incubator. Roger Hull, former Union College President and Schenectady mayoral candidate, had a Letter to the Editor in Wednesday’s Daily Gazette questioning the ability of the Gazette to be an objective critic of our local government. See “Gazette jeopardizing role as outside critic” (January 27, 2016; scroll to 3rd Letter). 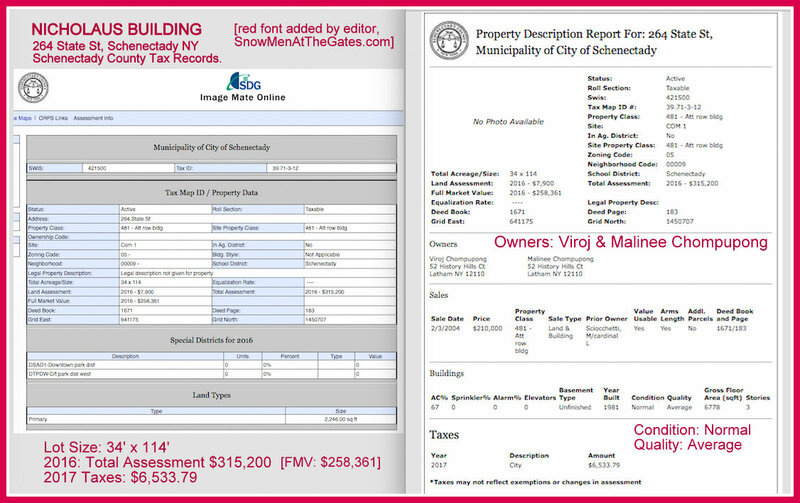 Hull’s letter highlights an important reason why, when it comes to safeguarding the interests of the residents of Schenectady, City Hall seems populated with more feckless snowmen than vigilant watchdogs: The City’s “newspaper of record” has become too closely allied with the Mayor, his Administration, City Council, and certain favored developers and businesses to serve as a fourth branch of government providing “checks and balances” through effective, unbiased criticism. Roger Hull is too gentlemanly, perhaps, to also mention that the Mayor’s wife, Caroline Boardman, has been employed by the Gazette as a Multi-Media Specialist since May 2014 (when the casino issue first arose in Schenectady). Compared with a typical Gazette staffer, Ms. Boardman’s online staff webpage is remarkable — it has no mention of her married name, of course, but also no biography nor contact information. That seems somewhat ironic for a newspaper so interested in transparency lately. Hull wonders “whether a newspaper can remain objective when it is partnering with those advancing a particular agenda.” After spending 20 months or so closely observing the treatment the Gazette has given to the many factual and policy issues raised in the process of supporting and selecting a casino for Schenectady, and preparing for its construction and operation, this website doubts that the Gazette does or can remain objective when its allies at City Hall want a particular outcome on an important issue. And, that conclusion applies to actual coverage of the news in its “factual” reportage, as much if not more than on its editorial page content. 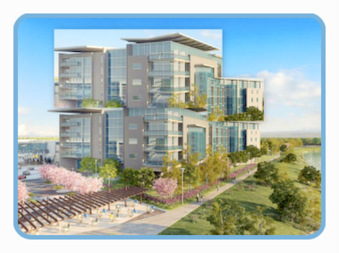 By choosing to ignore negative facts about the casino, and by failing to pose crucial questions (i.e., the reality of constant deadline crises that were used to force decisions prematurely), and to demand the kind and amount of information needed for responsible decision-making by City Council and the Planning Commission, the Gazette has forfeited any claim that it can be an objective or effective critic. 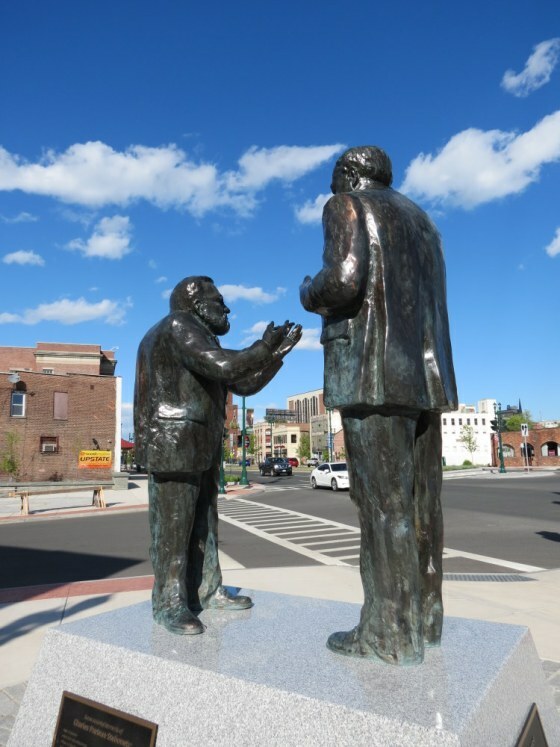 Moreover, by failing to provide the people of Schenectady with such information, and to provoke needed debate on the biggest questions shaping the City’s future, the Gazette has lost credibility and sown doubt about all of its coverage of local news. They [the Gazette’s owners and management] are proud of being “locally owned” and “independent”, but we’re afraid that can translate into parochial, unaccountable coverage, far too susceptible to pressures from local government and business interests (including important current or potential advertisers), and from the social, personal, demands on members of a small community of local leaders. Those pressures can only be increased when the Gazette directly partners in business enterprises, joins important advisory bodies, and even hires the spouse of our Mayor. As a result, we have to look elsewhere for fuller news coverage and investigative reporting on City Hall, County Government, Metroplex, and development issues. And, it is difficult to envision how the Gazette can win back our trust. 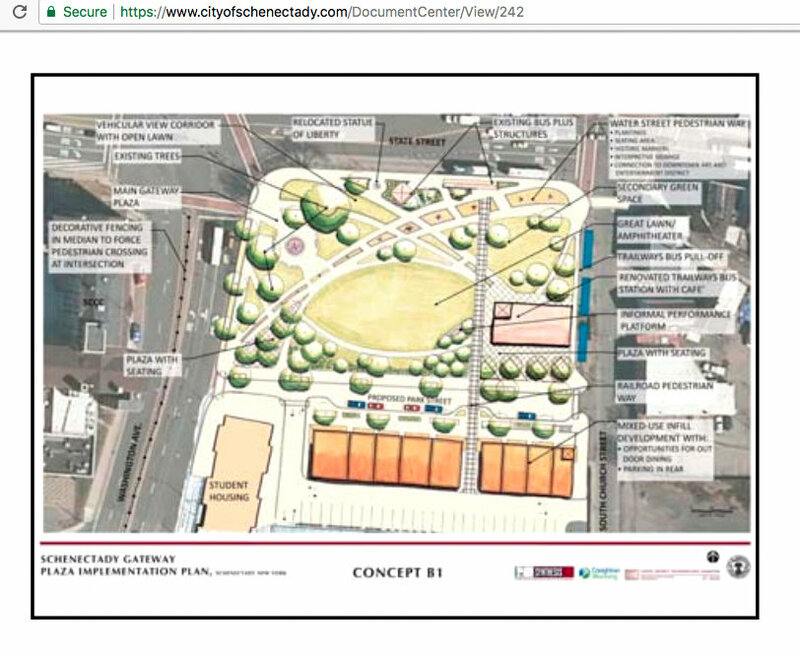 follow-up – no full images for public review (Friday evening, July 24, 2015): It was disappointing to be told at City Hall this afternoon that there were no additional renderings or sketches available to let the curious public see the final design of the Schenectady Casino. 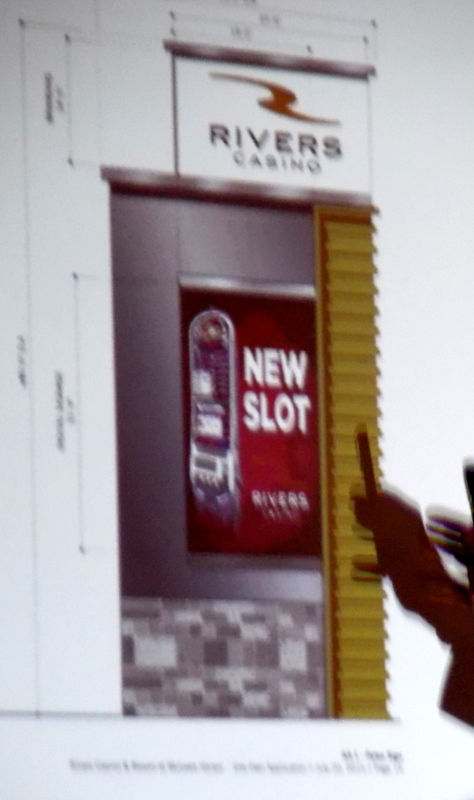 The unveiling of the 3rd Design on July 9th by Rush Street Gaming merely gave us a peek, with a detail from the front and one from the rear, of the make-over they performed on the unpopular 2nd Design. 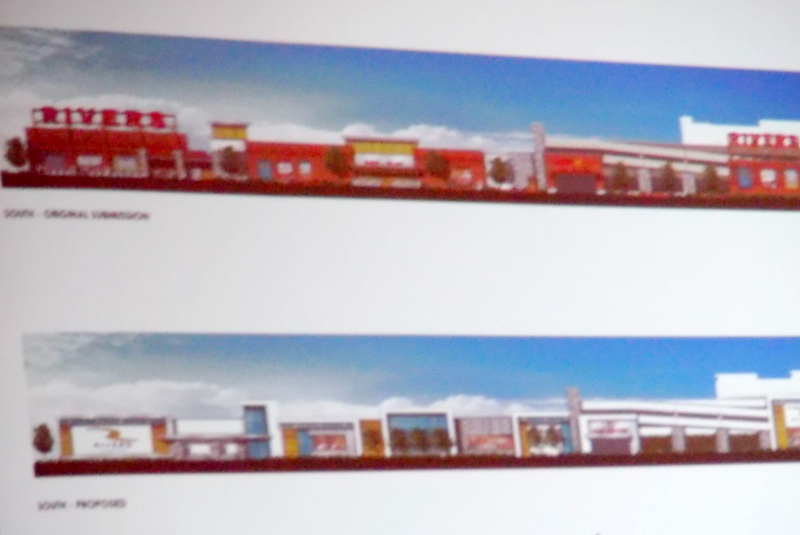 Although their Power Point presentation for the Special Site Plan Review Meeting of the Planning Commission on July 22nd offered a more complete set of sketches (not detailed renderings) of the nearly 300-feet long casino facility, those images were apparently not made into hardcopy form for submission to the Commission or for public viewing. Rush Street has not posted any additional images at its Rivers Casino at Mohawk Harbor website, as of 10 PM this evening. (It does still have a video clip with the original casino design from last year on the home page). [R] photograph of pylon image presented to Commission meeting on July 22 in Power Point display, showing the white branding section as contrasting greatly with the darker body of the pylon. Nonetheless, one accomplishment of my visit was being able to snap a clearer photo [see and click on image to the left at the top of this follow-up section] of the sketch of the pylon design that was presented to the Commission for the Special Meeting, and which was approved as to height, width and location (with possible changes in color and materials to be considered). Looking closely at the new version, I realized that it is actually worse than the prior version in several ways relevant to the complaints of many thoughtful folk: It is boxier (no narrow light-box “lantern” at the top), brighter (a pure white background on the Rivers branding section of the pylon, instead of black), taller in the sky by perhaps 6 or 7 feet (its main “branding” sign having been raised to 80′ by removing the “lantern”), and wider (39′, instead of an already excessive width of 38′).
. . . Commissioner Wallinger had pressed the Rush Street consultant over the white background of the branding sign at the Special Meeting, saying that the bright white was too much of a contrast with the remainder of the pylon, making it look like a separate sign sitting on top. That is one of the items that were noted for possible changes in the otherwise approved pylon. The consultant, Mike Levin, was surprisingly reluctant to discuss making the background dark, saying they want the “lantern effect.” It is more likely that they like the distance-viewing effect even more of the bright sign on top. 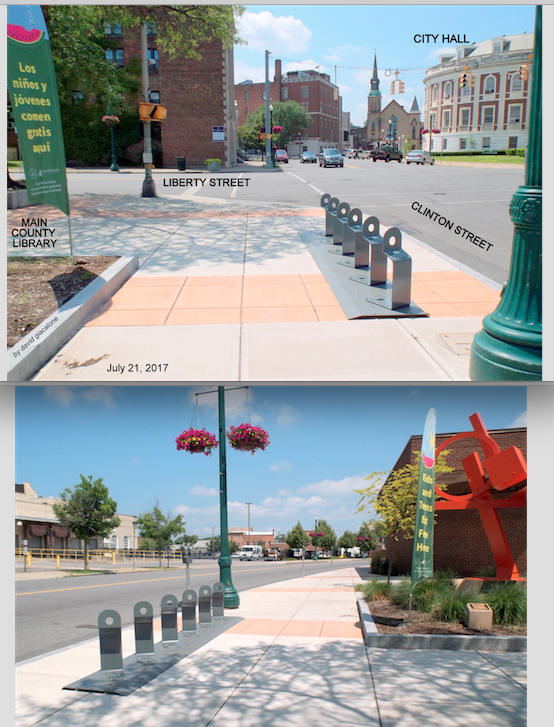 There is little reason to be optimistic about the results of any additional tweaking, as we are told by Corporation Counsel Falotico that Commission members will merely receive a courtesy copy of the Rush Street changes to the pylon, rather than having a subcommittee session that might be viewed by the public. 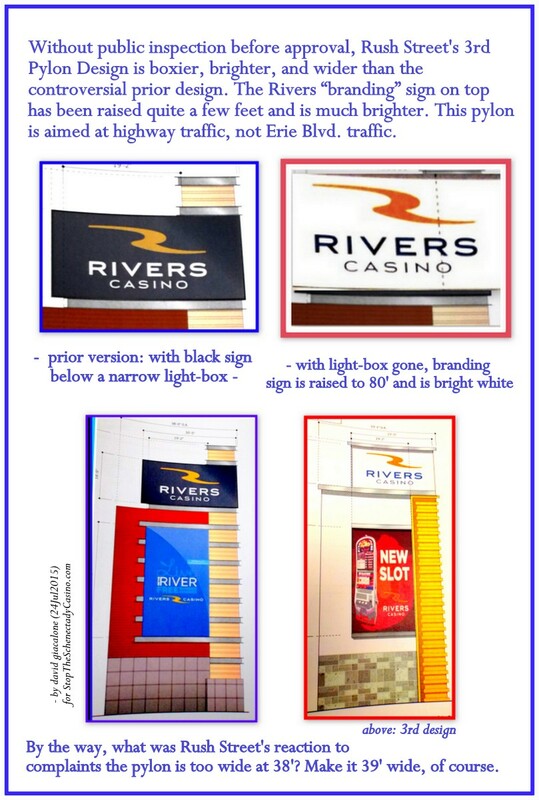 ” See “Public won’t review casino sign changes” (Schenectady Gazette, by Haley Vicarro, July 24, 2015). 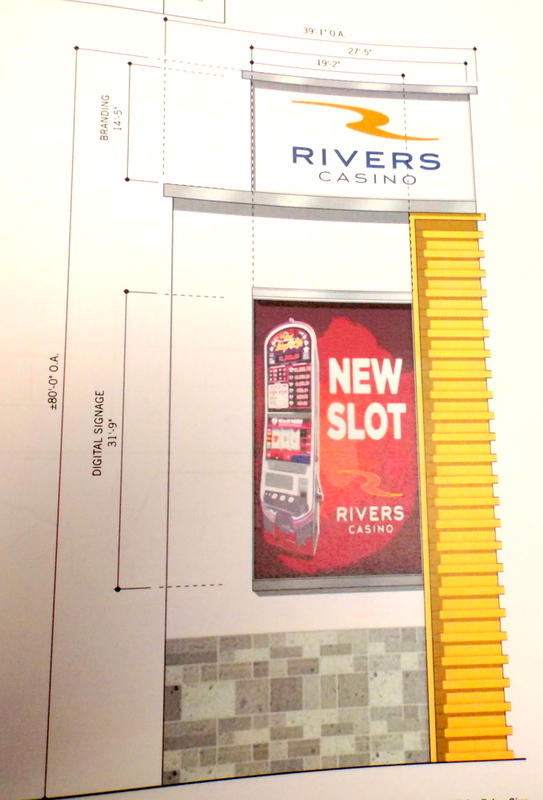 “The city Planning Commission gave final site plan approval to the gaming operator of the $330 million Rivers Casino despite complaints from some residents and disagreement among some on the panel about certain features of the 80-feet tall pylon, or gateway, sign. . . .
“The sign’s height, which complies with city code, and the brightness of signs on nearby residential neighborhoods area emerged as key issues. 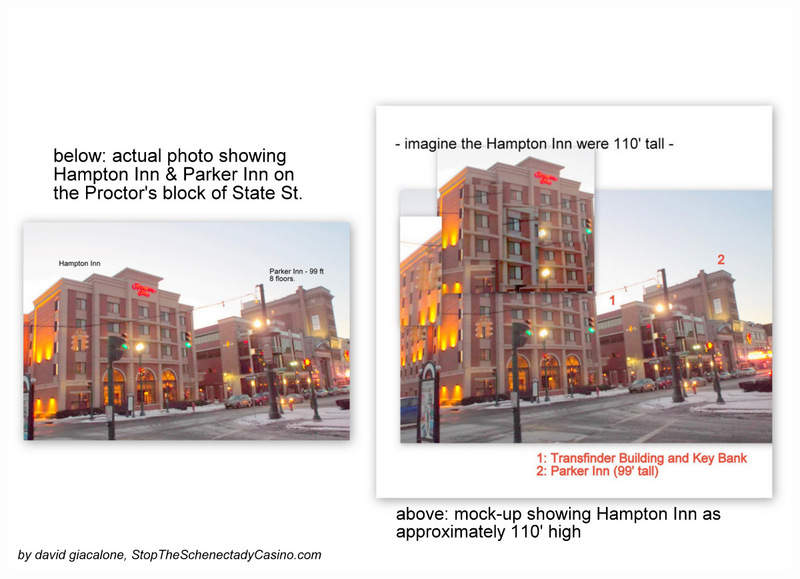 “Mike Levin, design team consultant for Rush Street, said the gaming operation is orienting to traffic because the casino will be 750 feet from an Erie Boulevard roundabout being built.. . .
. . . [L] 3rd version detail of riverside view of casino and hotel. I hope the Commission was given more detailed renditions of the 3rd design than we saw at the Commission meeting. The presented drawings were not up to the usual standard for Site Plan submissions, but I heard no complaints from the Commissioners. 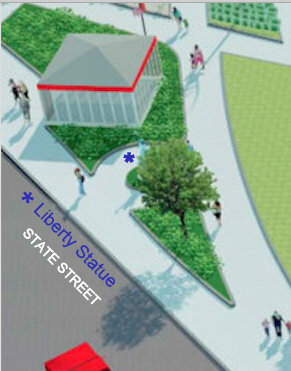 A couple of rather minor design “tweaks” could be in store for the pylon, but none of the issues raised in the Comments that I submitted today to the Commission made a difference. (If curious, click here or on the image at the top of this posting for the 9-page Comments in pdf. form, with text and images on issues such as safety, aesthetics, phony excuses for the height and location, questions never asked and documents never requested, legal duties in a Site Plan Review, and more. 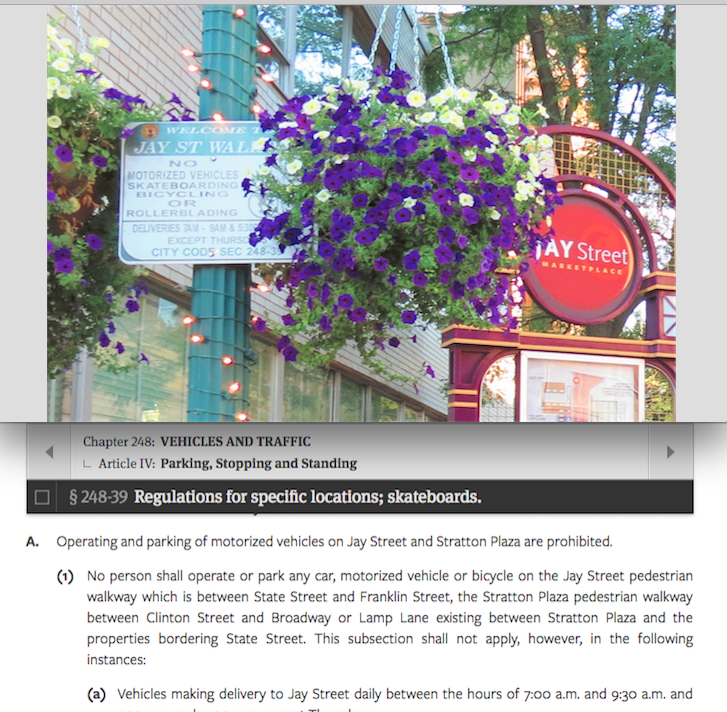 Also see my June 17th submission to the Planning Commission, which stresses the inappropriate height and width and the serious traffic hazard from the huge digital display. Chair Sharran Coppola declared that she liked the design of the pylon and its materials. Commissioner Wallinger said she was pleased that the pylon did not look like a Las Vegas sign, but thought having the top “branding” portion of the structure such a bright white made it look like a separate sign sitting on the top of the pylon. 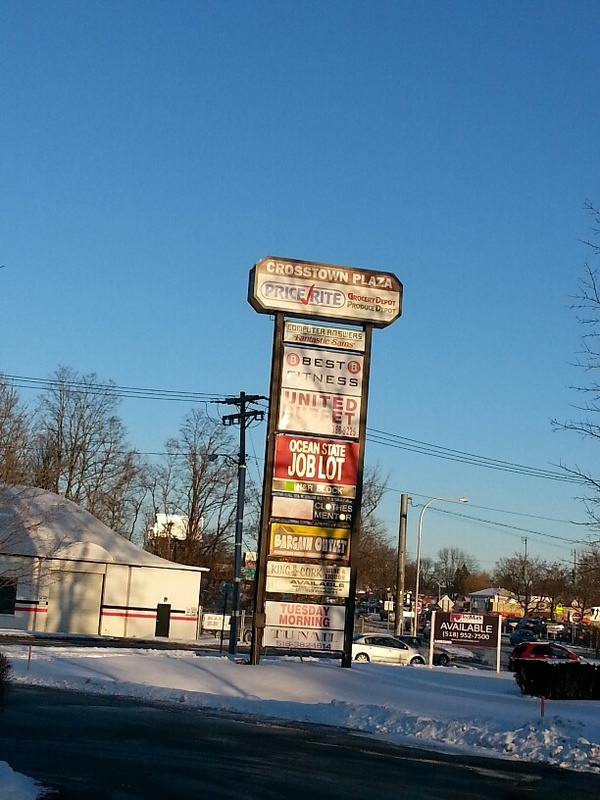 Thomas Carey, the lone dissenting vote on the Commission, declared that 80′ is too high, and bemoaned the fact that restrictions placed on every other business in the City against large signs lit internally did not apply to casino signage. Bradley also went out of his way to deride the notion in my Comments that the classic Sands marquee pylon was at all relevant, saying that it was on the Vegas strip and therefore along the street. He appeared to miss my point that the Sands sign, which was the tallest at the time on the Strip, was only 56′ high, despite being used to compete for attention with so many other casino signs. I’ve yet to see a Metroplex project Mr. Lewis did not enthusiastically (and often with barbed tongue for any skeptical questions) support before the Commission. Galesi Group COO David Buicko, who has often been the spokesman for the Casino Applicants, attended the Meeting but said only a few words. When I was making my presentation to the Commission, focused on the failure to show the need for an 80′ sign, Buicko did animatedly shake his head “no” at me a couple of times, especially when I asked whether there would be streetside directional signage pointing toward the Casino throughout the City, eliminating the need for a colossal sign supposedly meant as a safety precaution to make sure drivers know in time that they need to get on the Erie Blvd. roundabout at Nott Street. Commissioner Julia Stone told Rush Street’s Mike Levin the pylon was “the ugliest thing” she’d ever seen. She did later vote in favor of site plan approval, perhaps forgetting the power the Commission has over design in review of site plans. East Front Street Association president Carmella Ruscitto told the Commissioners she just couldn’t understand why some people could be against the casino or its design, especially after the Galesi and Rush Street folk have worked so hard. It was a surprise that Carmella never brought up the subject of East Front Street opposition to the pylon. According to the Gazette, her younger sister Mary Ann pointedly told the Planning Commission last month, “We don’t want the giant big sign at the entrance to our neighborhood.” That topic must have made for some interesting sisterly conversation over the breakfast table. Camille Sosnowski, president of the Goose Hill Neighborhood Association, told the Commissioners of her concern over light pollution and glare from the pylon and reminded them we do not yet know how much higher the Mohawk Harbor site will be raised above the flood level. By the way, Chair Coppola started the meeting by giving her defense of the “subcommittee meetings” the Commission members had with the Applicant Casino developer. She insisted it is a frequent practice and only to gather facts. She insisted more than once “there are no deals”. Later, Ms. Coppola remarked that she wondered what the Gazette editorial page would have to say about this evening’s results. See our Pylon Directory to find links to postings detailing the safety, design, and process issues raised by the Colossal Casino Pylon and its approval process. The Mayor [Gary McCarthy] has apparently been reassuring City Council members that you can accept items such as the height and signage limits in the proposed C-3 waterfront district amendments, without looking closely into each issue, because any problems can be fixed by the Planning Commission in Site Plan and Special Use Permit review proceedings. As a retired lawyer who has done a significant amount of legal research and writing on zoning issues over the past few years, my good faith legal opinion is that His Honor is simply wrong. Once legislated in a new version of C-3 standards, the signage, height and setback numbers will be virtually untouchable by the Planning Commission (unless, perhaps, it does a new environmental impact statement under SEQRA that justifies the changes as necessary “mitigation” of environmental harm). The developer and Casino owner have no reason to contradict the Mayor’s position, as they would be very pleased if you believe him and think you can just punt the hard decisions over to the Planning Commission. Tomorrow, Dec. 17, 2014, the NYS Gaming Facility Location Board is expected to finally announce its selections for up to four Upstate gaming facility licenses. 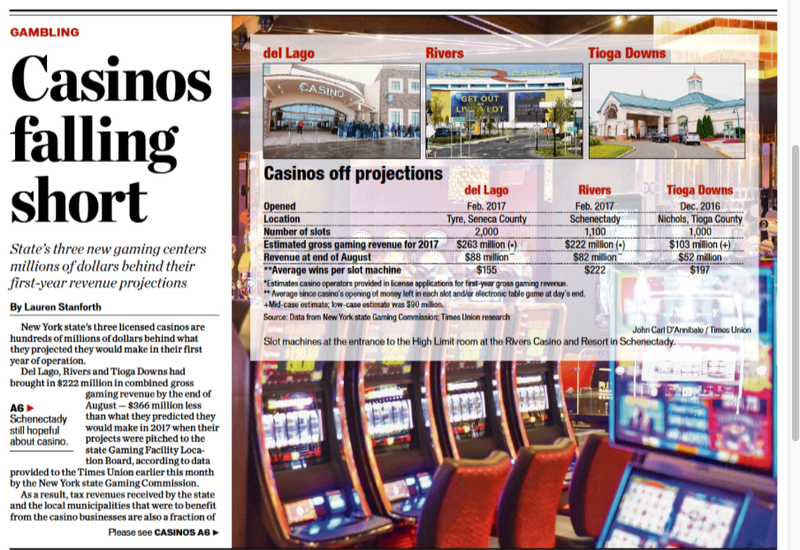 Before the winners and losers are chosen, however, we would like to set out our perspective on the coverage given to the casino selection process by the Schenectady Daily Gazette, which has editorially supported the Schenectady casino application. Whether we “win” or “loose”, we believe it is important for the people of Schenectady to know how poorly the Gazette has performed the role of presenting the relevant casino news and helping the public (and our leaders) understand the issues and the likely impact of a casino on Schenectady and nearby communities. They are proud of being “locally owned” and “independent”, but we’re afraid that can translate into parochial, unaccountable coverage, far too susceptible to pressures from local government and business interests (including important current or potential advertisers), and from the social and personal demands on members of a small community of local leaders. In a way, “locally owned” can lead too readily to “locally bought”. Meeting with Gazette Officials. 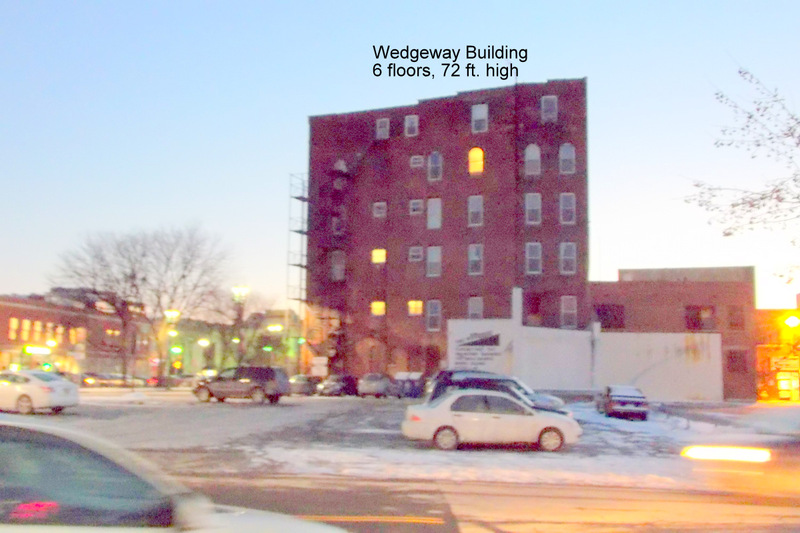 Yesterday afternoon (Monday, Dec. 15, 2014), the Publisher of the Gazette, John DeAugustine, the Editor, Judy Patrick, and Miles Reed, the City Editor met with Stop the Schenectady Casino members Mohamed Hafez and myself (David Giacalone) to discuss our belief that the Gazette’s news coverage has favored the casino. They gave us a considerable amount of their time and made the valid points that they have a limited amount of resources to cover the wide world of local news and that they are bombarded by complaints they have not given enough coverage to particular issues or have not been impartial. The Gazette officials insisted they are proud of the wide coverage they have given the casino issue and seemed not to understand why we would want the Gazette to report the positions and arguments of Stop the Schenectady Casino, as opposed to merely vaguely mentioning concerns of those against a Schenectady casino. We wanted (and needed) the public to know and the media to report there is a serious opposition campaign, because the Location Board wants to know the extent of local opposition, and because not mentioning our specific arguments and background information serves the interests of the casino applicant by default. 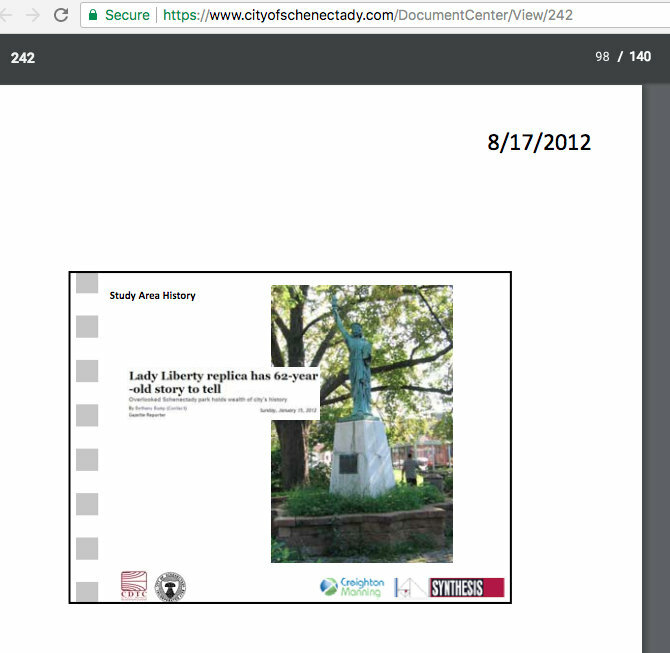 To “write about” (usually, merely mentioning) crime, traffic, the proximity to Union College, and potential harm to the Stockade Historic neighborhood, etc., without mentioning our consistent focus on those issues, and our very specific research on the facts and research literature, not only has left the articles almost content-free, but fails to show the seriousness of the problems. 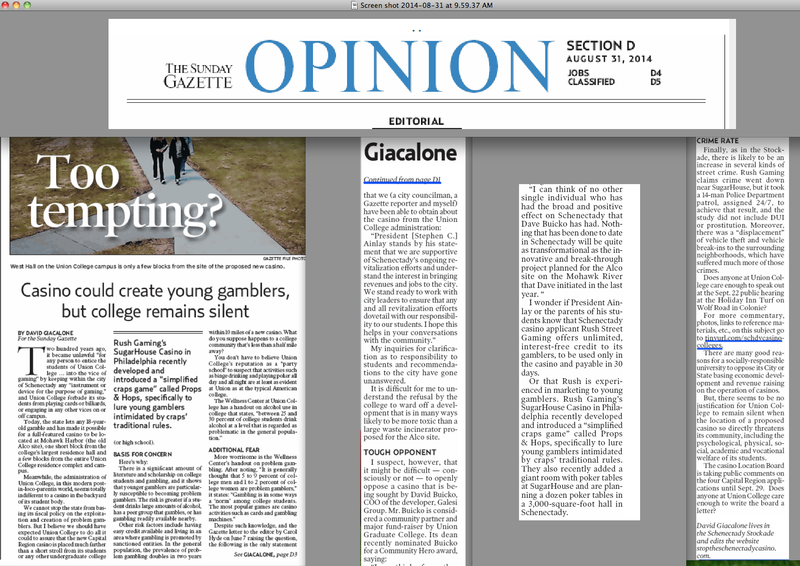 The Gazette‘s editorial board endorsed the casino on June 9th, and — viewed from the outside as casino opponents, and also perhaps to the objective observer — its newsroom became a virtual public relations department for the Schenectady casino, with news editors seemingly reining in reporters who were initially curious and conscientious in covering casino issues. Despite the public’s desire to know more about the applicants and the pros and cons of locating a casino in Schenectady, the Gazette newsroom did little to counter the propaganda of local political leaders, the pie-in-the-sky predictions of Rush Street Gaming and Galesi Group CEO David Buicko, and the incessant cheerleading of Metroplex and the local Chamber of Commerce, with facts and investigatory reporting. It failed to look beyond the conclusions and soundbites of casino proponents and to present the facts and arguments behind the concerns of opponents. The Gazette also ignored a press release by many of the same religious leaders, dated September 30, 2014, telling of a campaign among various faith congregations in Schenectady to make their opposition known to the proposed Schenectady casino. [See our posting of Oct. 1, 2014; and click for a pdf. version of the Press Release] The campaign provided an information packet with documents to aid in writing the NYS Gaming Facility Location Board. I personally brought up the topic to a Gazette casino reporter, supplying the phone number of Rev. Phil Grigsby, who was a contact person for the group behind the Press Release and anti-casino campaign. Rev. Grigsby made several direct attempts to speak with the reporter and Gazette, but was never able to do so. It is that “major concern” that might have kept the ministers’ news-worthy campaign out of the Gazette. The Press Release was referring to a study, Betting on Kids Online, released in early September by a major hospitality and casino worker union, stating that Rush Street Gaming is investing millions of dollars with the aim of becoming the industry leader in “building a bridge” between children playing casino-like games on social media and smartphones and their going to brick-n-mortar casinos to do real gaming once they are old enough. 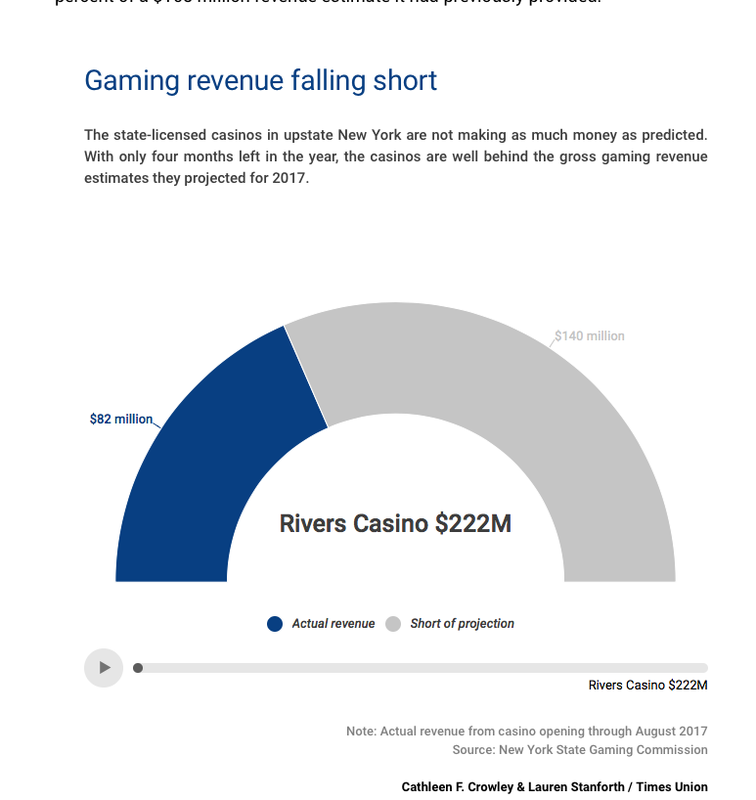 As we stated in our posting “Rush Street takes aim at adolescents” (Sept. 11, 2014): Knowing that the earlier you begin to gamble, the more likely you are to gamble often and obsessively, Schenectady’s proposed casino operator is sowing the seeds digitally to grow the next generation of problem gamblers. I personally corresponded with a Gazette reporter a few times on Betting on Kids, sending a link to the study and related website. 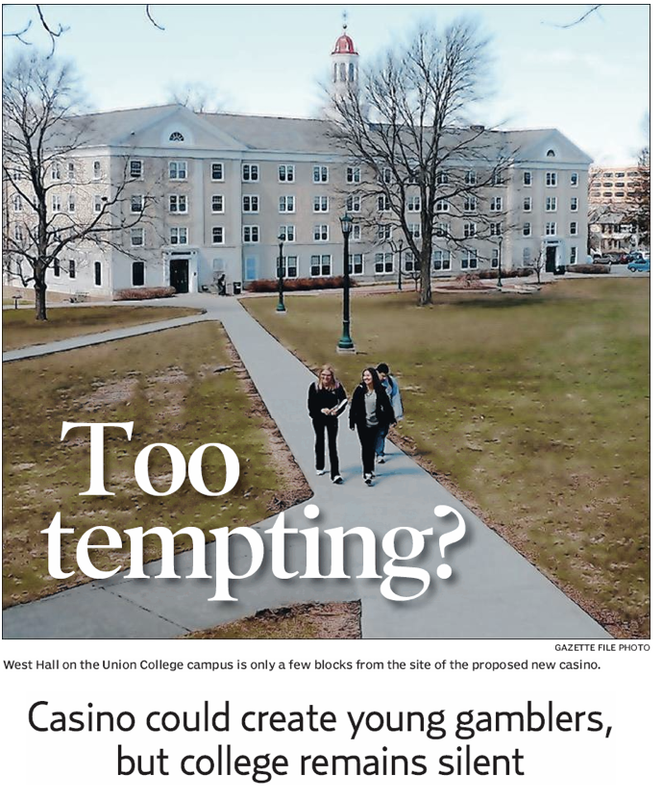 The Gazette chose to censor this important news about a casino operator who wants to locate a gaming facility a block away from a giant Union College residence hall filled with potential young gamblers. It also failed to report that Rush Street’s Philadelphia casino was specifically aiming at young potential gamblers by creating a simpler form of craps called “props and hops” and building a large poker hall. See this posting. The Gazette newsroom has also, by commission and omission, acted to erase the existence of the group Stop the Schenectady Casino from the minds of its readers. Indeed, when WAMC’s Dave Lucas first contacted me in November, he started the conversation by saying, “I didn’t even know there was a group in opposition to the Schenectady casino.” Also, at the September public presentations by the Applicants to the Location Board, one Board member told the East Greenbush applicant that they were the only casino with any public opposition. 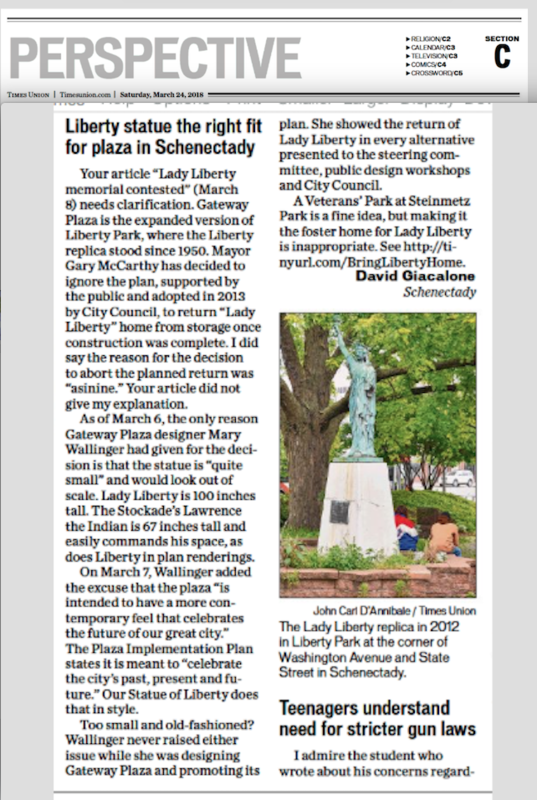 Mr. Lucas and the Location Board staff must have blinked and missed the initial coverage the Gazette gave to our group when we were first formed at the end of May, in our attempt to prevent the City Council from approving the Schenectady casino proposal. 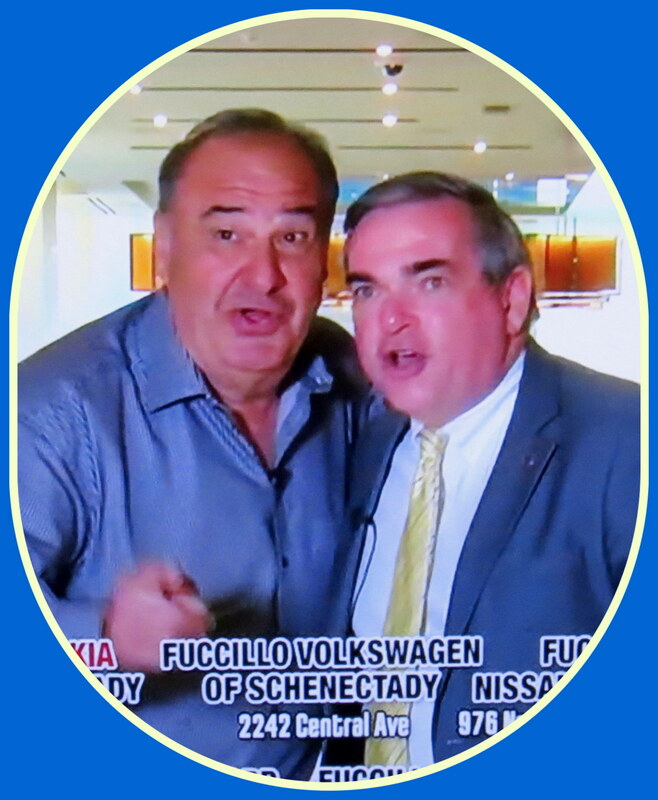 See “Neighbors rally against Schenectady casino plan” (Sunday Gazette, by Ned Campbell, June 8, 2014); and our posting on “our June 7 opposition meeting” at Arthur’s Market. In fact, in the four months since the Gazette’s June 9th editorial supporting the casino, there has only been one mention of the existence of a group in Schenectady opposing the casino. That was in a piece on June 23 about my complaint to the NYS Attorney General, alleging that the efforts of the Fair Game theater coalition to force applicants to accept a list of their demands violate the antitrust laws. [see our post “arts venues want more than a Fair Game” June 28, 2014] The very next day, the Gazette printed an editorial praising Fair Game, and calling it good for the theaters, the City and the casinos. Despite the editorial staff’s usual CYA approach, in which it states “on one hand, on the other hand”, concerning most issues, it did not even acknowledge that Fair Game’s activities could increase entertainment prices and limit entertainment options available to Schenectady County residents, while also damaging non-favored entertainment and leisure establishments. Perhaps because I was attacking our biggest local sacred cow, Proctor’s and its director Philip Morris, I have subsequently been relegated to being called a Stockade resident and/or outspoken casino critic, not the leader of an opposition group. Reporter Viccaro had been in frequent touch with me the days before the Board’s public comment event. She knew that I was scheduled to appear on behalf of the group Stop the Schenectady Casino, and that the reserved spots were in fact meant for representatives of groups. I told her Mr. Hafez also had a time slot, and she sent me an email specifically asking if Hafez was a Stockade resident. I immediately wrote back, saying he lived in Mt. 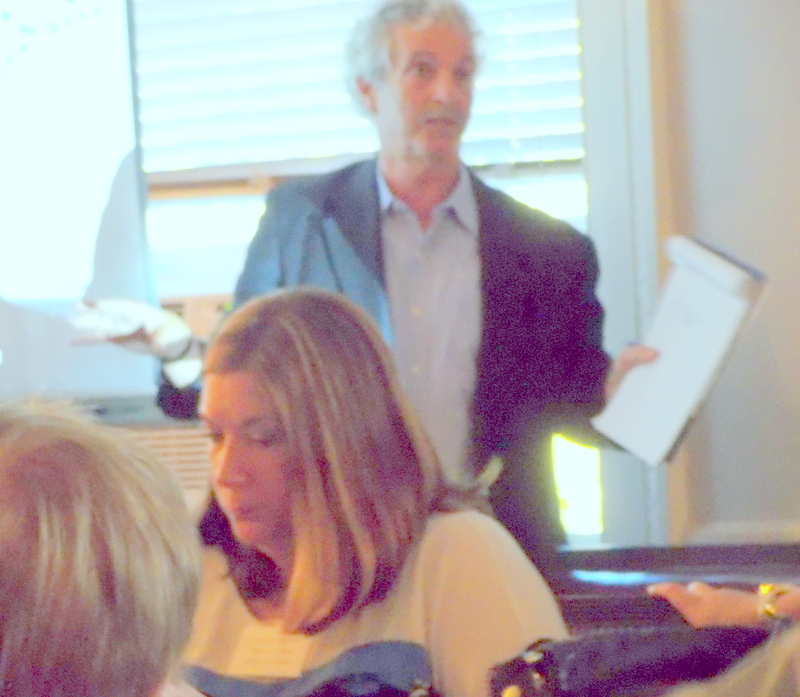 Pleasant, not the Stockade, with an insurance office on Guilderland Ave., and was appearing to present the perspective of a landlord on the negative impact of a casino. To the typical Schenectadian reading the Gazette, the term “Stockade resident” often means “spoiled elitist opposed to anything new that might be an inconvenience.” It does not suggest serious opposition and a coalition of people with a wide range of reasons to fight against a casino. 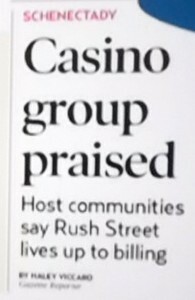 The impression is strengthened by failing to mention (as the article does for opponents of other Capital Region casinos) any actual issues and concerns of the Group. Worse than the relegating us to the issue-less category of Stockade resident prior to the Public Comment Event, the Gazette‘s multi-piece coverage of the 12-hour public hearing never mentions that there were local opponents of the Schenectady casino present at or making presentations to the Location Board, much less that a spokesperson appeared on behalf of Stop the Schenectady Casino and presented a 20-page Statement in Opposition to the Schenectady Casino to the Location Board, along with our signed Petitions against the casino. 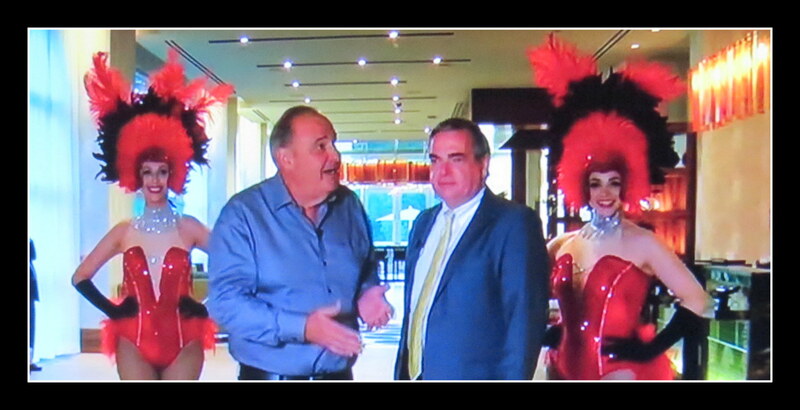 [Even Galesi CEO Dave Buicko and Metroplex Chairman Ray Gillen later congratulated us on the quality of the Statement.] 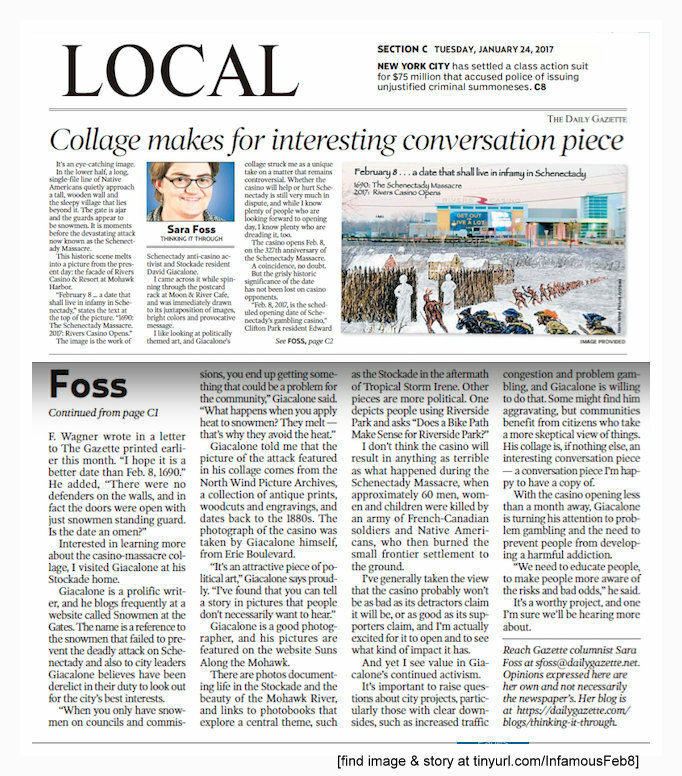 Nor did the Gazette mention Mohamed Hafez’s presentation, and his attempt to share some of his five minutes with Rev. Philip Grigsby of the group of Schenectady religious leaders against the casino. Did we just get lost in the overkill of a day-long hearing? Well, Gazette reporter Haley Viccaro watched my presentation and when I finished it, we talked, joked, and schmoozed on and off for well over 30 minutes; she even strongly advised me to check out the fancy room reserved by the Schenectady applicant for the comfort of its supporters. She was also very pleased when I handed her a flashdrive that held our Statement, its attachments, and copies of the petitions. Instead of mentioning our group in her pieces, Haley ended up marveling over a cake baked by one of the businesses that plans to partner with Rush Street Gaming at the Schenectady casino. Haley’s article is filled with quotes from local development and business officials and Rush Street Gaming’s CEO Greg Carlin, without a word from their detractors, such as Casino-Free Philadelphia, or the Worchester MA citizens group that was successful in keeping RSG out of their city, nor even from the Stop the Schenectady Casino gang. We speculated in August that perhaps the article was the Gazette‘s penance and mea culpa to Casino proponents for an earlier article titled “Officials in other cities warn of pitfalls, failed promises by Rush Street“? (June 8, 2014, by Bethany Bump). Indeed, Rush Street Gaming liked the August 3rd article so much, it included a Power Point image of the headline in the “final”, public presentation it made to the Location Board in September. (click the image at the head of this paragraph) In our posting on what the newspaper forgot to mention, we walk through a number of very important facts the Gazette should have mentioned as a matter of fairness, but also of journalistic duty and pride. For example, it failed to mention the many facts that refute the claim by a Philadelphia official that, rather than crime rising, it actually got safer near Rush Street’s Philadelphia casino. In addition, it allowed a company official to brag that they even help customers find other hotels for their stay in Philadelphia, without noting that the particular casino has no hotel of its own and must assist customers to find lodging if it wants to lure them to their facility. Traffic & Crime Concerns. The Gazette also managed to write an article on the traffic problems in the Stockade, and to occasionally mention concerns over increased crime, without ever including mention of Stop the Schenectady Casino, which has focused on those issues, and researched and written on them in some detail. 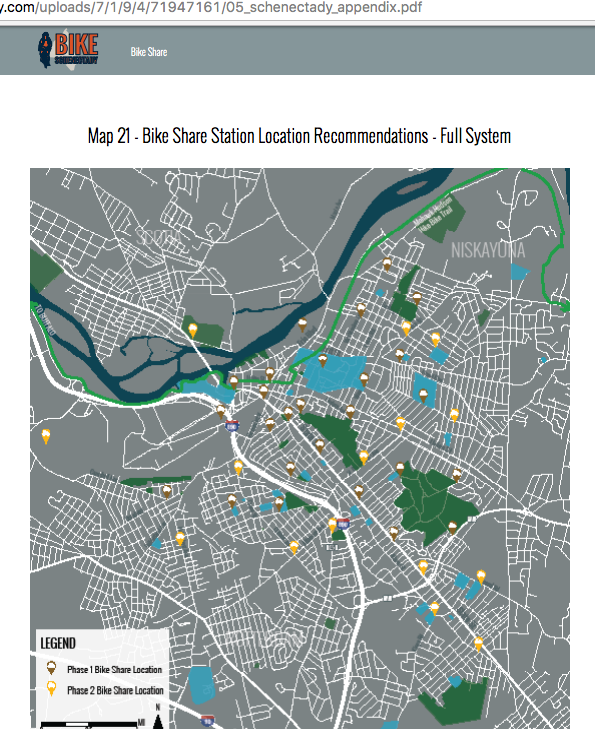 For example, see the Gazette piece “Stockade group frets over potential traffic: Mohawk Harbor access a concern” (Sept. 30, 2014, by Haley Viccaro). 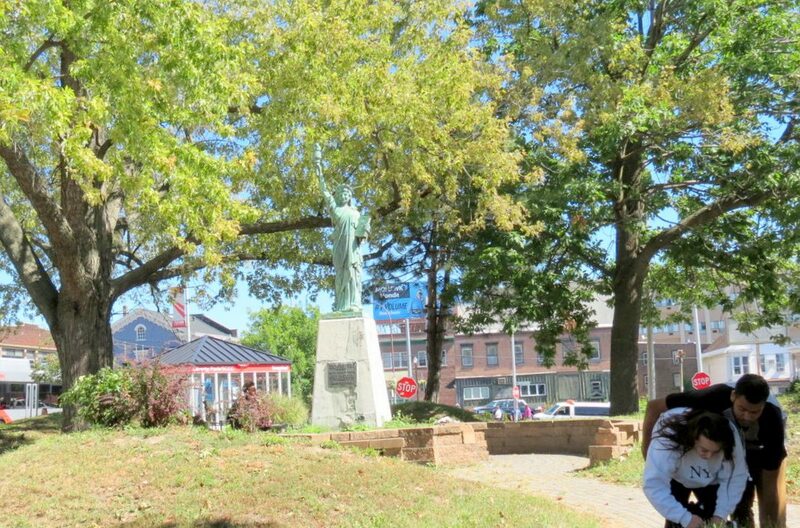 Ms. Viccaro decided to only speak with Mary D’Allesdandro, Stockade Association president concerning the Stockade’s traffic worries. Not only is Ms. D’Allesandro a supporter of the casino, she never did anything about the traffic issue until a non-officer member of the Association asked at the September Stockade Association that they give comments to Metroplex as part of the environmental review. The Comment was hammered out at the end of the Meeting, and is filled with generalities. The Gazette article is so troublesome, that I left a lengthy comment at their website, and repeated it in a posting on October 1, titled “the Gazette gets stuck in Stockade traffic” (October 1, 2014). 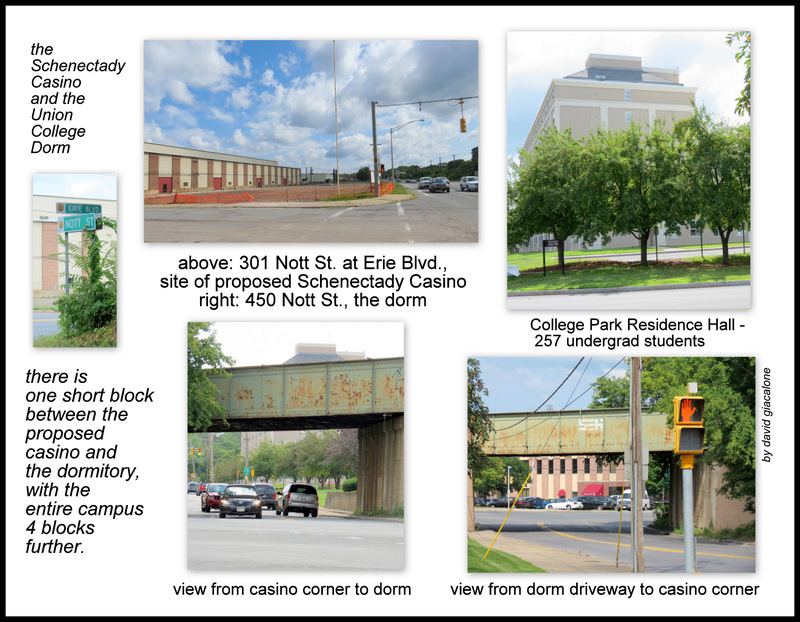 That posting has links to the work done by Stop the Schenectady Casino on the traffic issue, including discussion on our Statement in Opposition of September 22, 2o14. Crime. The Gazette has also failed to address in any meaningful way an issue of great concern to neighborhoods near the proposed casino: the likelihood that the casino will bring an increase in crime. We were told in the Gazette, with no explanations, that Stockade Association President, a casino booster (and mayor-appointed member of the City’s Board of Zoning Review), Mary D’Alessandro didn’t think there would be an increase in crime; that East Front Street Association officer Mary Ann Ruscitto, an “excited” casino booster, wasn’t worried, because we already have crime in the Stockade area; and that a Rush Street Gaming proponent stated that crime went down around its Philadelphia SugarHouse casino. As you can see in our posting “will a casino bring more crime,” and at pages 6 -8 or our Statement in Opposition to the Casino, there is much to say about crime and an urban casino that goes far beyond one-sentence gut feelings. The Gazette could have added to that debate, but I believe doing so would have made more of their readers and their allies supporting the casino nervous. Often mentioned that the East Front Street Association supported the casino, but never reported on how few people were members nor how its leaders concluded the majority of neighborhood residents supported the casino. Every resident of that neighborhood asked by us said no one asked them their stance on the casino. Gave no coverage to the Statement of the Schenectady Heritage Foundation to Metroplex, asking Metroplex to act to protect the Stockade from the negative effects likely to be caused by having a casino a half mile away. See our post on October 2, 2014. This is, we submit, not a record that should make the Gazette proud, unless its goal has been to give Rivers Casino at Mohawk Harbor a better shot at being selected by the Location Board. 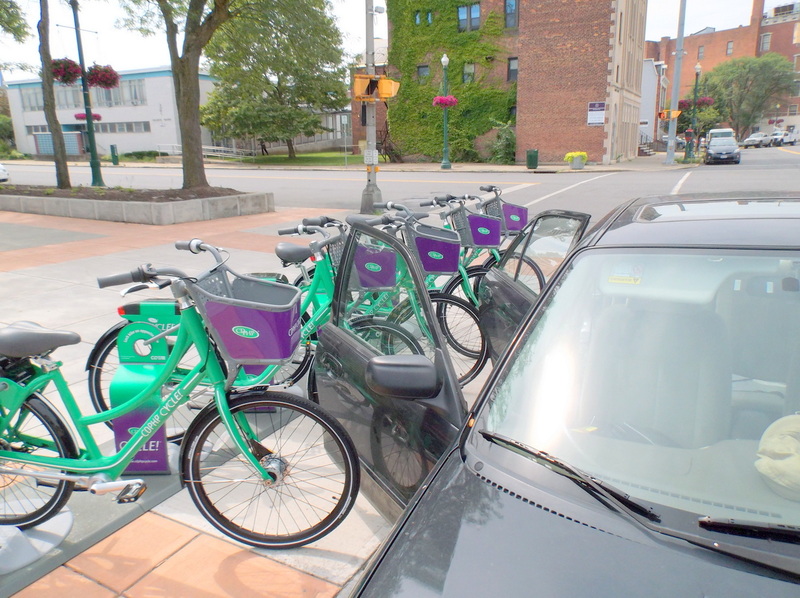 follow-up: Why No East-Greenbush Effect? (Dec. 22, 2014): The opponents of the East Greeenbush casino won a well-earned victory, and they show what was needed to attract the attention of the Gaming Facility Location Board. You need a large number of truly upset, directly-affected homeowners (especially middle-class ones), with organization skills and at least a modest war chest, and with lots of publicity that garners more publicity, and the kind of Town Council monkey-business to make a lawsuit at least colorable, and gives the media a hook for covering the topic repeatedly. See “Churchill: East Greenbush casino opponents win big” by Chris Churchill,” Albany Times Union, Dec. 18, 2014). With the Gazette ignoring us, and the Stockade Association hampered by a President who favored the casino and would not call a meeting on the casino nor put the issue on the agenda, the anti-casino crowd in Schenectady never got the nucleus of publicity that would let them grow into as thorny an opponent as those in East Greenbush. The Stockade had voted against Proposition One in the November 2013 election. Had the Stockade Association voted to oppose the casino and opened its treasury to the cause, the Gazette would not have been able to ignore us. Ifs, buts, regrets. No matter the results on December 17th at the Location Board meeting, we are proud to have made this campaign to help protect the heart, soul and future of our community. We believe Schenectady is strong, creative and capable enough to continue our revitalization, without the problems created by reliance on a casino for jobs and revenues. update: Click here to see our reaction to the selection of Schenectady’s Casino. For a memento of the Stop the Schenectady Casino campaign, we’ve put together a one-page 2015 Stop the Schenectady Casino calendar. It is formatted to be printed as an 8″ x 10″ photo. 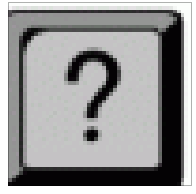 You can click on the above image or find the jpg. 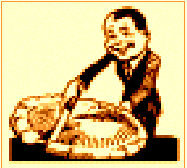 file at http://tinyurl.com/StopSchdyCasino2015 . 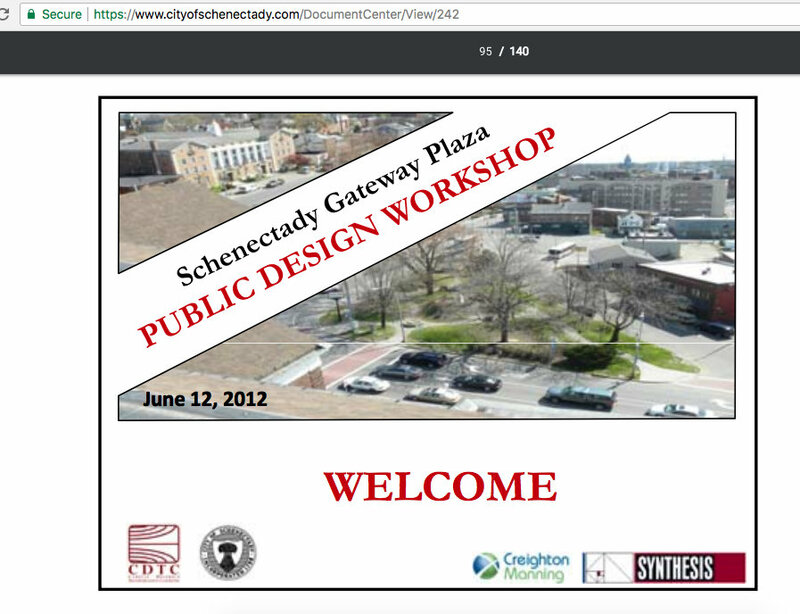 About eight weeks ago, Stop the Schenectady Casino learned that the Applicant/Developer of the proposed Schenectady casino at the Old ALCO Plant site failed to disclose to Metroplex in its environmental statements its discovery of “tunnels” under historic ALCO Building 332, and that the Schenectady Gazette helped in the coverup. The Rotterdam-based Galesi Group is the owner of the Mohawk Harbor site and the developer of a planned marina and mixed-use complex there, and hopes to include a casino on the 60-acre site. 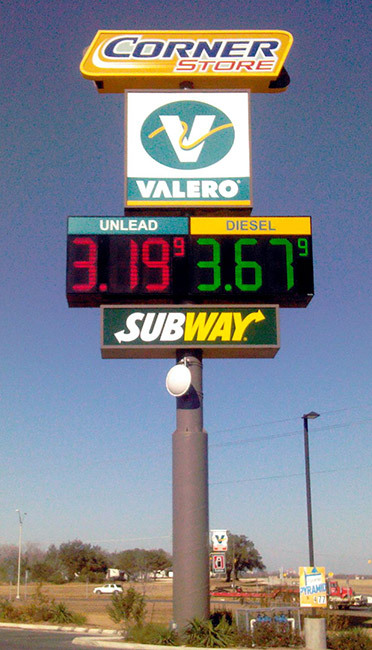 As the owner-developer, Galesi is responsible for submitting an environmental impact statement [“EIS”] to the Metroplex Authority, which is the lead agency for purposes of the State Environmental Quality Review Act. As such, in attempting to obtain approval of a final EIS, Galesi has an ongoing responsibility to report any new facts that raise a significant question of potential harm to relevant aspects of the environment, including elements of historical or archeological importance. 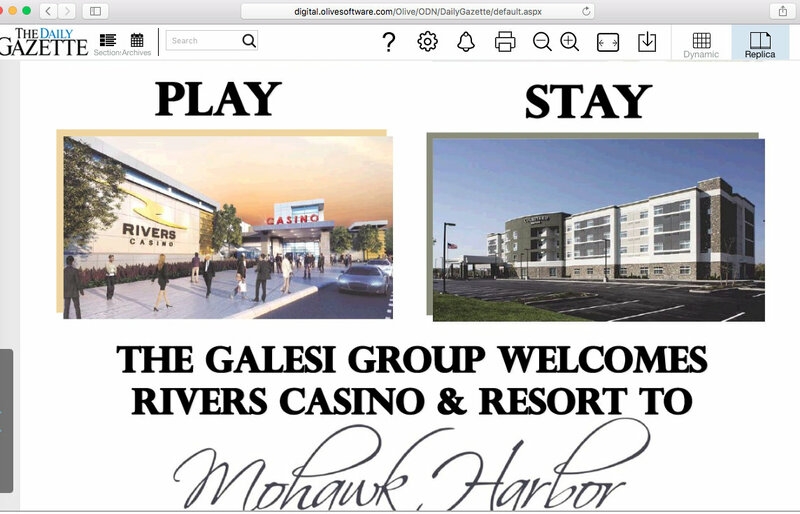 Galesi CEO David Buicko has taken the lead as spokesman for the proposed Mohawk Harbor projects before local government bodies as well as the NYS Gaming Facility Location Board, and is well known in the business, development, political and educational sectors of Schenectady County and the region. 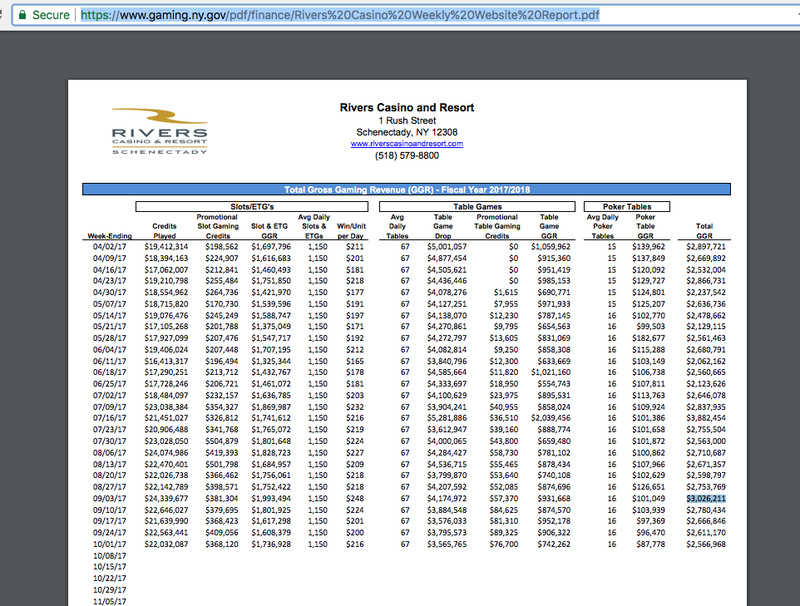 Rush Street Gaming, which is headquartered in Chicago, is the primary Applicant for a casino license and would operate the Schenectady casino, called Rivers Casino at Mohawk Harbor, if granted a license by the Gaming Commission. Because the Gazette has failed to clarify what happened on the site, at Metroplex, and in its newsroom and editorial enclave concerning the uncovered utility tunnels, I sent the following proposed opEd piece or guest column Letter to the Gazette on November 14, 2014. There has been no response of any kind from the Opinion Staff. Here is the piece the Gazette refuses to publish, followed by additional explanation and discussion, including communications between myself and both the Gazette reporter who admitted she was asked not to report on the tunnels and the one purportedly assigned to find out what really happened. Three weeks ago, I was told by a Gazette reporter that the paper would be following up on its incomplete and one-sided article “Metroplex OKs Alco site environmental review” (Oct. 22, 2014), concerning the failure of the ALCO/Mohawk Harbor developer (Galesi Group) to disclose in its environmental impact statement its discovery of tunnels under Building 332, and its request (honored by the newspaper) that the Gazette not report on the discovery. [the portions of the Oct. 22 article relevant to the tunnel issue are quoted below] So far, not a word has been printed about an issue that draws into question the credibility of the Applicant for a Schenectady casino license, Metroplex’s environmental review, and the Gazette‘s coverage of the casino selection process. Is the Gazette waiting until the NYS Casino Facility Location Board makes its decision awarding a Capital Region casino license, so that the credibility of the Schenectady Applicant won’t be undermined prior to the selection? 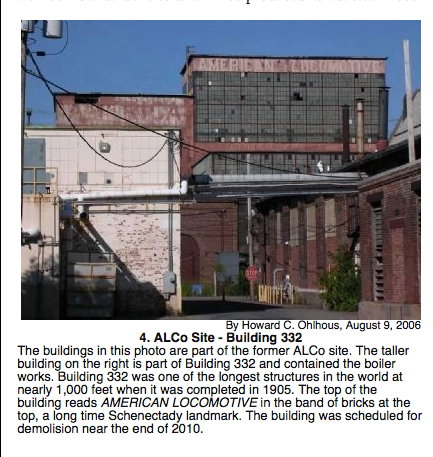 The Oct. 22 article correctly points out that I and Mohamed Hafez had written to Metroplex chair Ray Gillen just prior to its Board meeting that day, asking for a postponement of its approval of the environmental review, because we had just learned that the ALCO contractor had uncovered tunnels under the century-old ALCO Building 332 while demolishing its foundation. The discovery was in early August, prior to the approval of the draft environmental impact statement, but Galesi Group never brought in an archeologist nor reported the discovery to Metroplex. The article then fails to mention any of my supporting information, although it was supplied to the reporter along with the Memorandum to Metroplex. 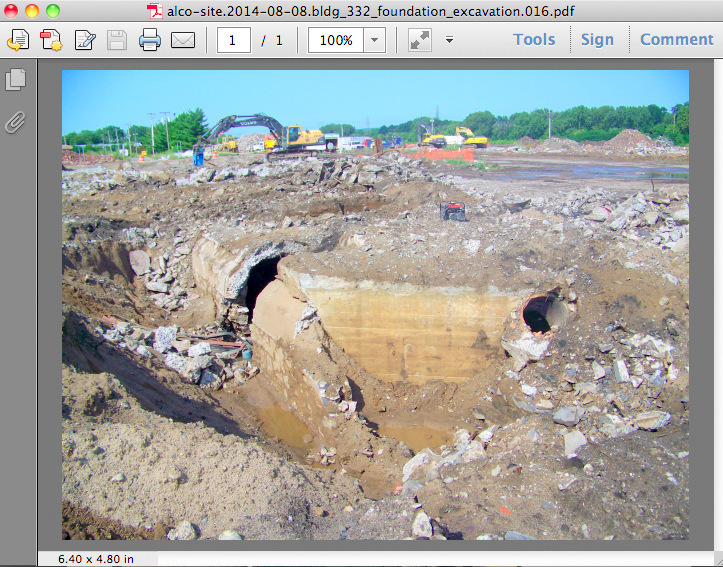 Instead, the rest of the article debunks my Tunnel Coverup claims, by quoting Mr. Gillen and Galesi CEO Buicko denying that there were any tunnels and that there was any historical significance to the “utility corridors” they did find and demolish. It then quotes from three Galesi consultants denying the existence of tunnels or saying that what was found was expected. In addition, the letters by the consultants were described as having been “written this week,” although the reporter knew that they had been written that very evening specifically in response to our Memorandum to Metroplex. The article also fails to mention that our Memo to Metroplex specifically alleged, using information verified by another Gazette reporter, that “When a reporter from the Gazette attempted to learn about the tunnels [in early August], the Applicant refused to give an interview on the record and would not allow photos to be taken; it also appears that the Applicant specifically requested that the Gazette not report on the discovery of the tunnels.” Not having mentioned our coverup claim, the article does not tell us whether Mssrs. Gillen and Buicko denied the request for a coverup or somehow justified it. Contrary to the letters of the Galesi consultants, the DEC engineer stated twice that it would have been virtually impossible for the contractor to know the tunnels existed prior to demolishing the building’s foundation. In addition to the original Gazette reporter calling the so-called “utility corridors” tunnels and not questioning our using that word, the Department of Environmental Conservation engineer heading up the remediation project at the ALCO site spoke with me at length by telephone, and said that the “pipe chases” were indeed large enough to be more appropriately called tunnels, and he thereafter referred to them as tunnels. The Gazette reporter, Haley Viccaro, wrote to me on October 20 in an email that: “Yes there are tunnels and they are working to get rid of them. I was asked not to report on that fact,” and complied after discussing the issue with Gazette editors. 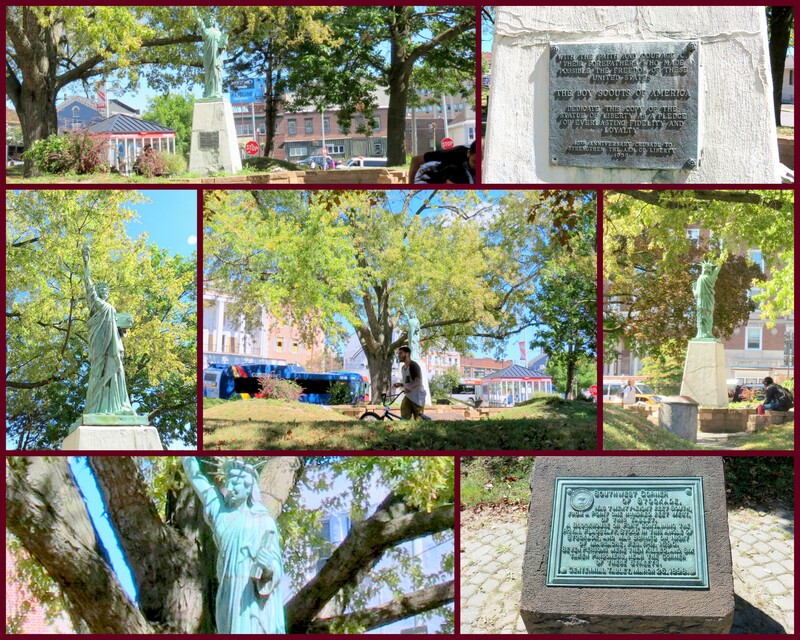 On October 21, I emailed the six photos sent to me by the DEC engineer to Don Rittner, the former Historian of Schenectady County and the City of Schenectady, and an archeologist. 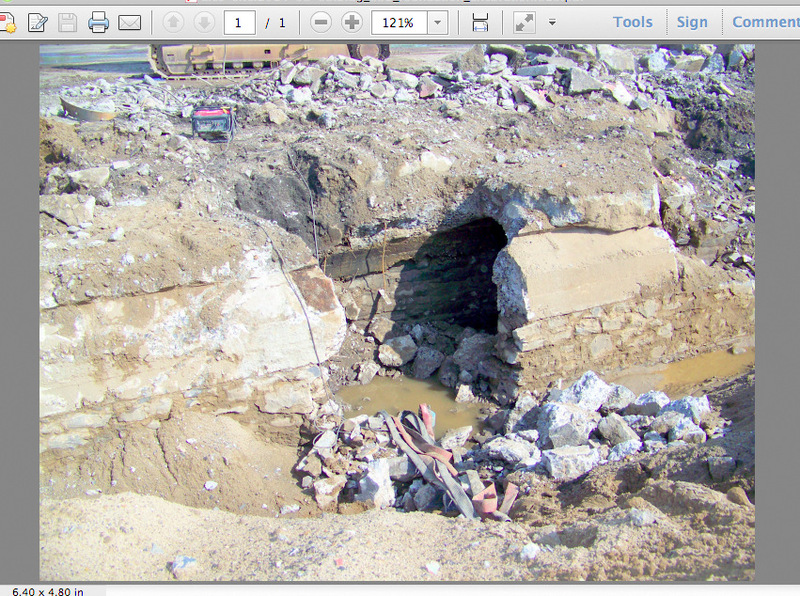 Dr. Rittner wrote back: “[A] professional archeologist should have been hired to document the site before destruction. This was such an important part of Schenectady history [but] we may never know what those tunnels were for.” Dr. Rittner also concluded that the discovery should have been disclosed as part of the Environmental Impact review process. According to information at the Historic Marker Data Base website, “Building 332 was one of the longest structures in the world at nearly 1000 feet when it was completed in 1905.” (see photo to the right, taken and with commentary by Howard C. Ohlhous, Historian of the Town of Duanesburg, NY; click on the image for a larger version) Furthermore, according to DEC engineer Strang, the buildings on the ALCO site often were built over the foundations of prior buildings dating from the mid-19th Century, and “cells” found during its demolition suggest that was the case with Building 332. Construction of ALCO Building 332 was completed in 1905, but its foundation was very likely to have been erected on the foundation of buildings dating back to before the Civil War, increasing the chance that the tunnels could have some important stories to tell us. Whatever they are called, the uncovered hollow structures were part of or beneath the foundation of a building which played an important part in the history of ALCO, of Schenectady, and of our nation’s war efforts in the 20th Century. A professional archeologist could have quickly examined and documented the tunnels, assessing whether they were standard, mundane utility corridors, or were indeed of archeological and historical significance. We will never know, because the Applicant concealed their existence from all but DEC’s remediation engineer, demolished them and filled them over. The goal of receiving environmental approval by Metroplex as soon as possible to gain an advantage in the casino licensing process is understandable, but in no way justifies the Applicant’s covering the tunnels over without archeological examination, nor asking the Gazette to cover up the story. To the extent the Gazette allowed itself to be part of the Applicant’s concealment efforts, it has also failed to serve its public. Bravo and Best Wishes to Howe Caverns Casino! [Location Board Chair Kevin Law] told the crowd during a day of 145 speakers and 11 hours of testimony that “we have no doubt that Schoharie County wants a casino,” drawing hurrahs from the crowd of Howes Cave backers. Yes, we think our STATEMENT in OPPOSITION to the Schenectady Casino does a good job of explaining why Schenectady should not be chosen. 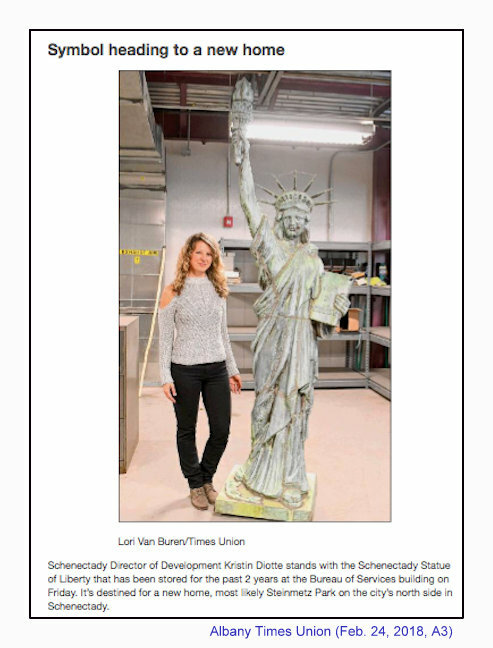 But, we also believe that the good people of Howe Caverns and Schoharie County have done Schenectady a very good deed by making such a strong case that they be selected. So, Bravo!, Best Wishes and Big Thanks to the Howe Caverns Casino and Resort. We like your odds. Because Governor Cuomo tilted the vote in favor of the gambling industry. His aides helped rewrite language on the ballot to portray the amendment as a huge boon to the state, suggesting it could only lead to benefits, such as job creation, greater school financing, and lower taxes. Newspaper editorial boards and public interest groups across the state cried foul, noting their actions would massively mislead voters — but the Cuomo administration kept the pro-casino wording on the ballot anyway. There’s good reason to think Governor Cuomo had his own interests in mind. Since 2005, he has directly collected over $1 million from gambling and horse racing companies – more than any other elected official or candidate in the state. As Governor, Ms. Teachout says she will break the tie between political donations and politics, between casino donations and public policy. 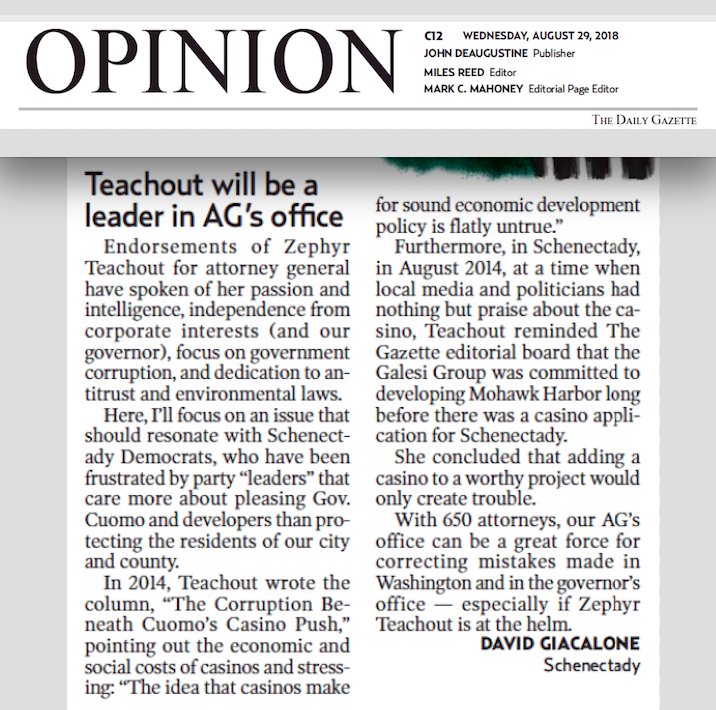 Also see our posting “Teachout says No to Casinos“, about her campaign interview with the Gazette editorial board in 2014.
follow-up (Sept. 2, 2018): click on the image to the left for my Letter to the Editor of the Schenectady Gazette supporting Zephyr Teachout’s campaign in the Democratic Primary to be Attorney General of New York State. 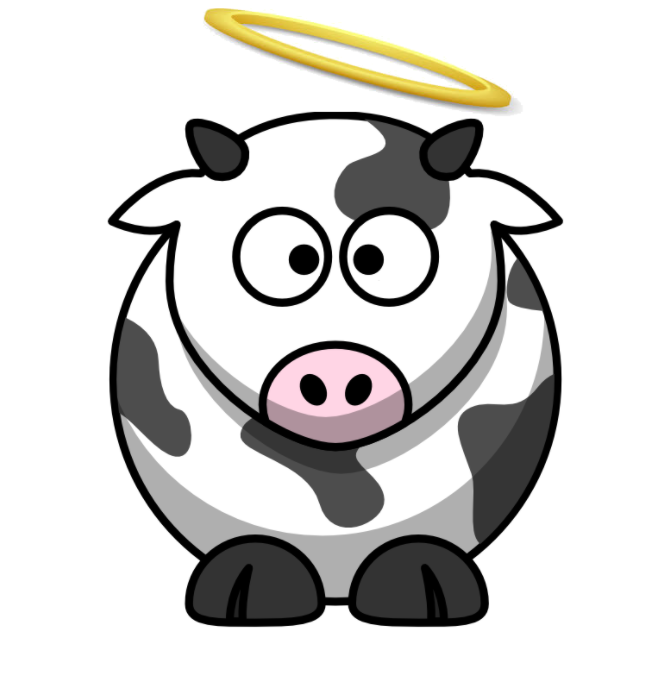 Click here for the text of the “Too tempting?” OpEd piece in a pdf file. 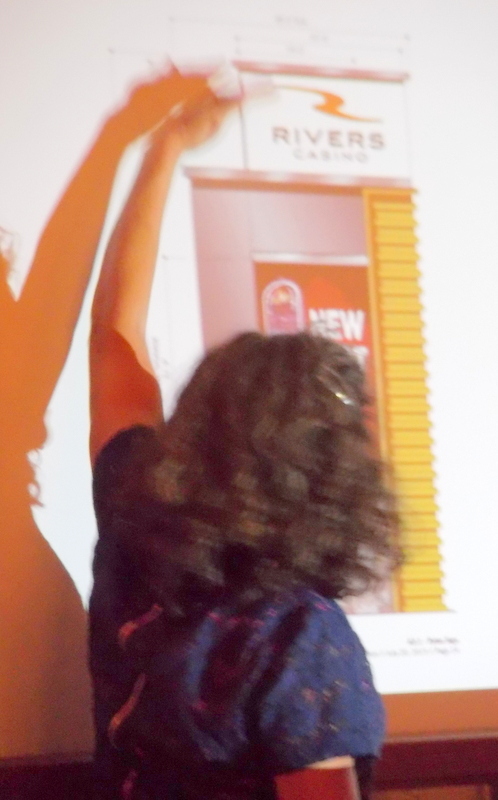 And, see our posting “what will the casino mean for Union College students?“, which has had many updates, and added discussion and references. Naturally, we will post any response from the Union College administration or community at this website.